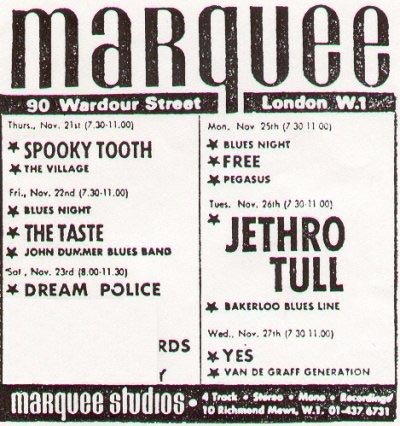 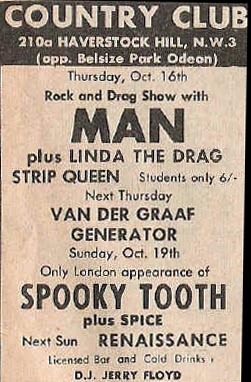 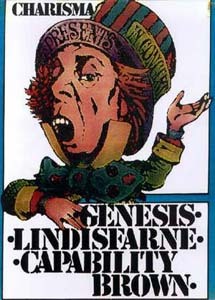 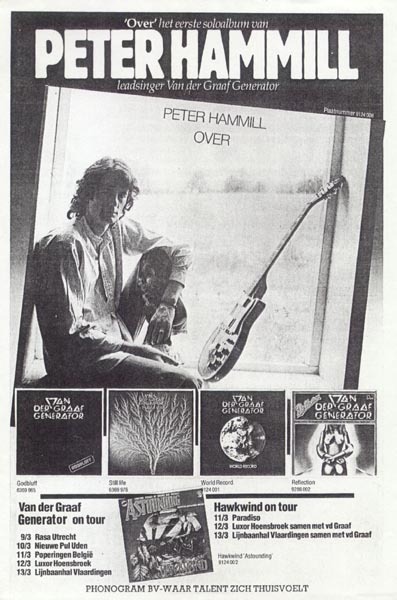 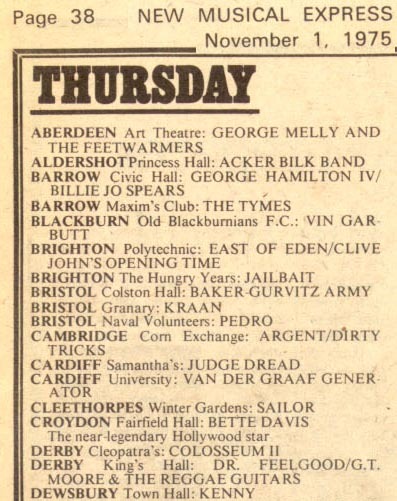 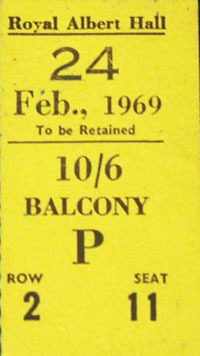 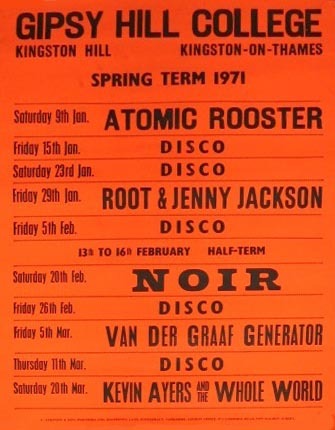 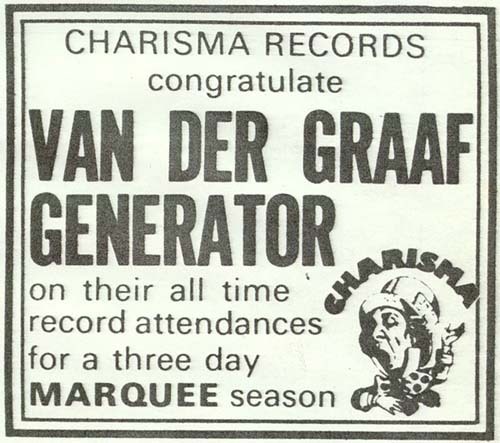 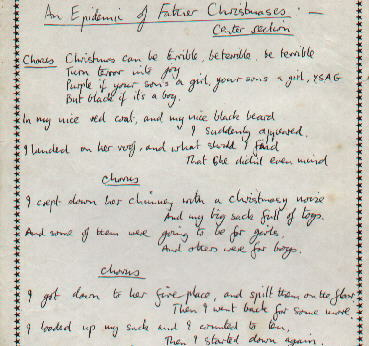 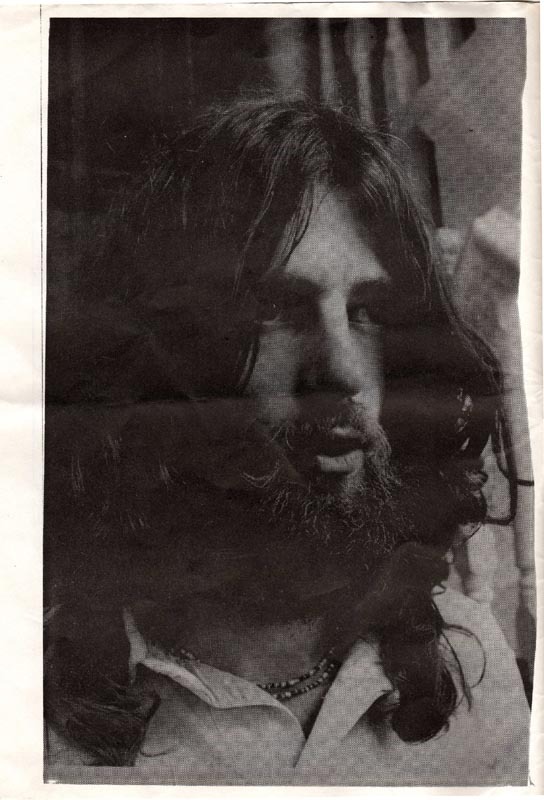 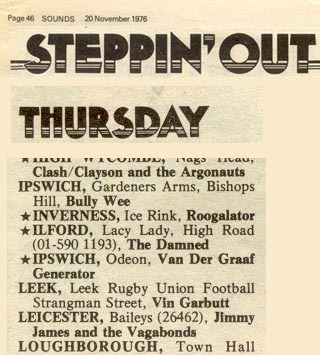 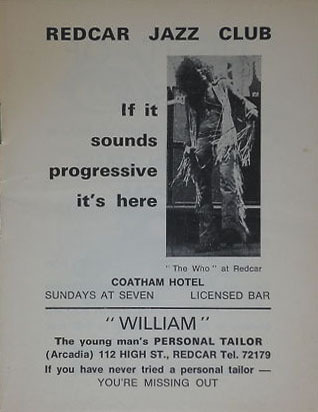 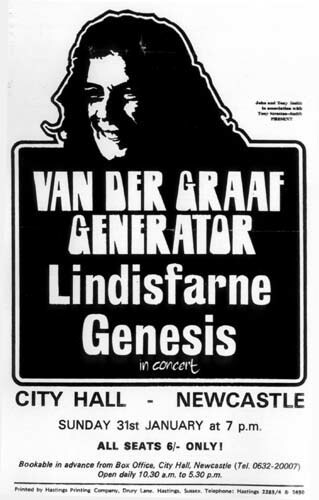 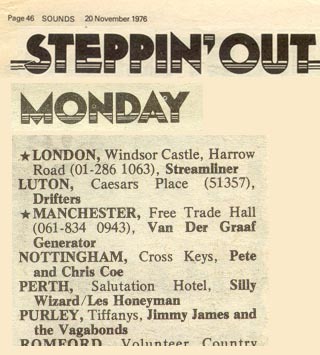 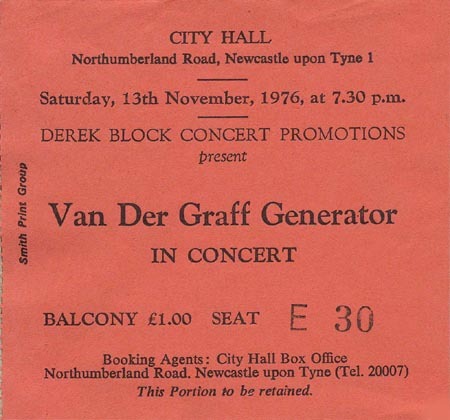 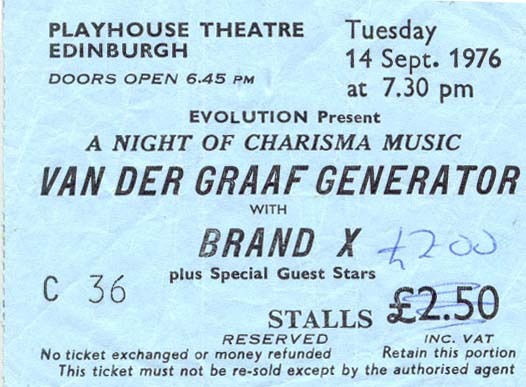 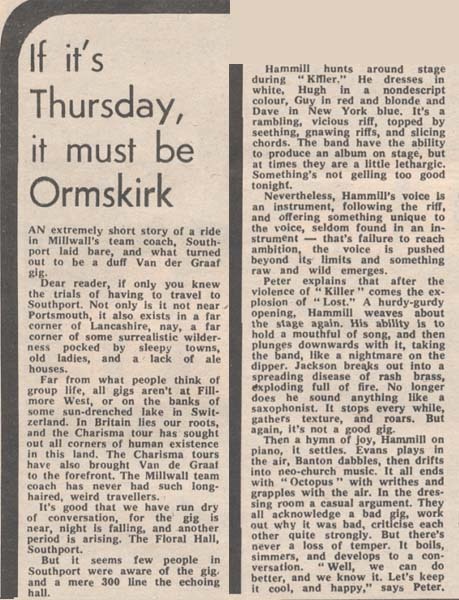 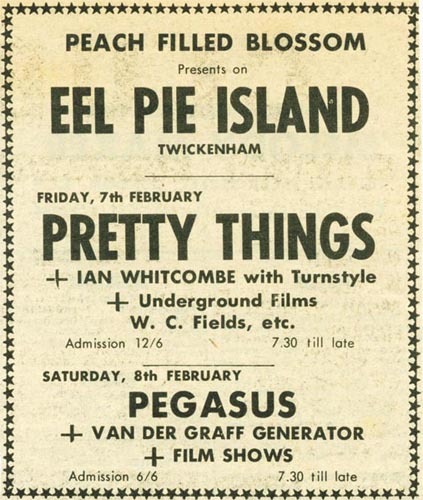 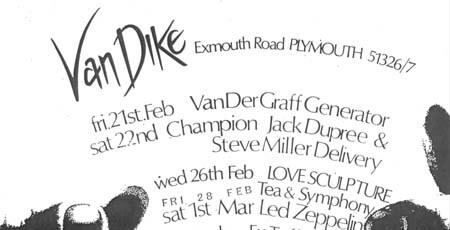 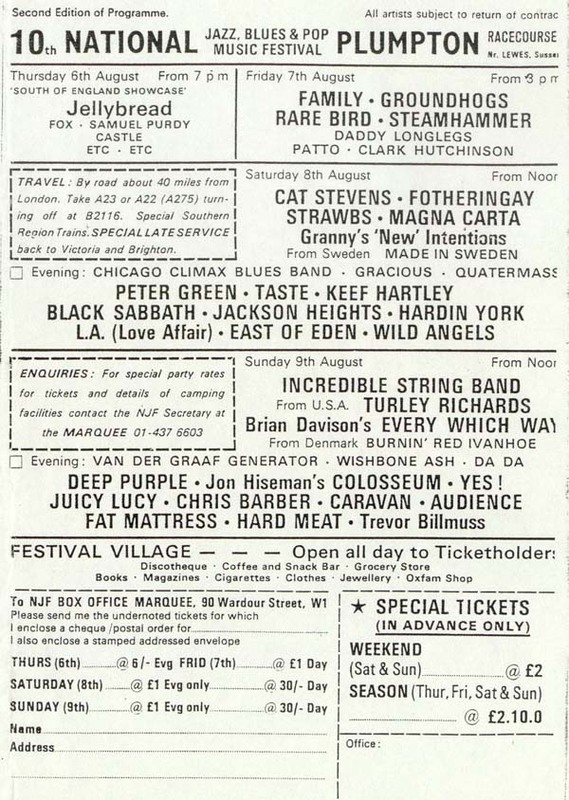 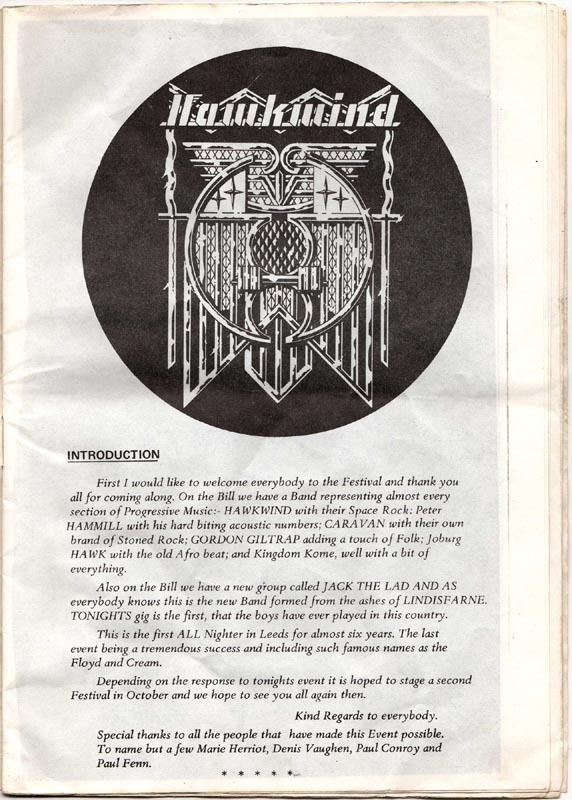 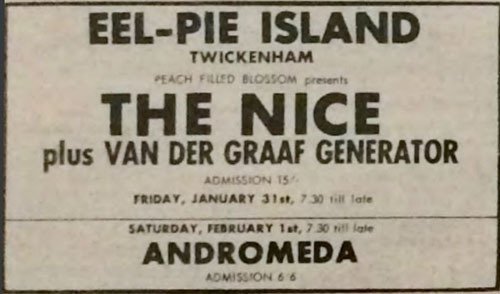 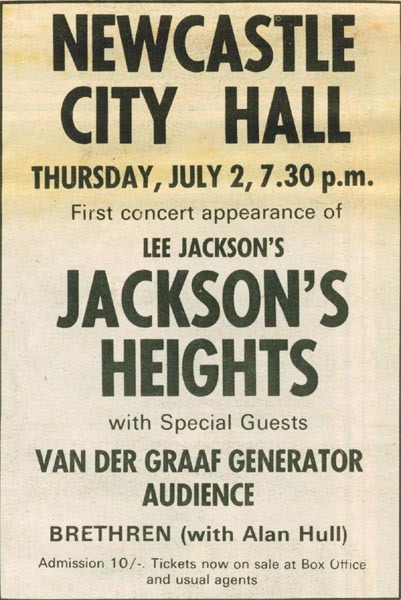 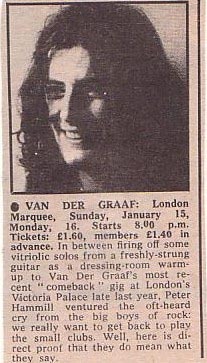 28 NOV 69 Scotland, Edinburgh, "Frisco's"
08 FEB 70 England, Peterborough, Town Hall (Advert) - Vandergraph! 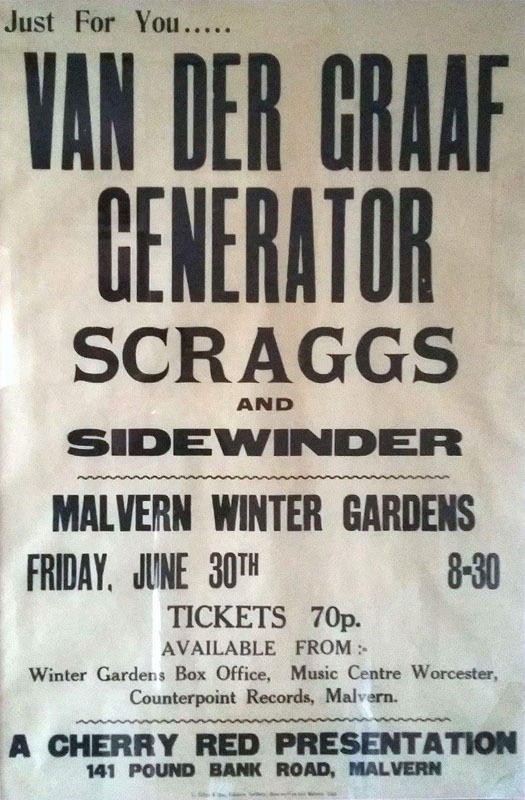 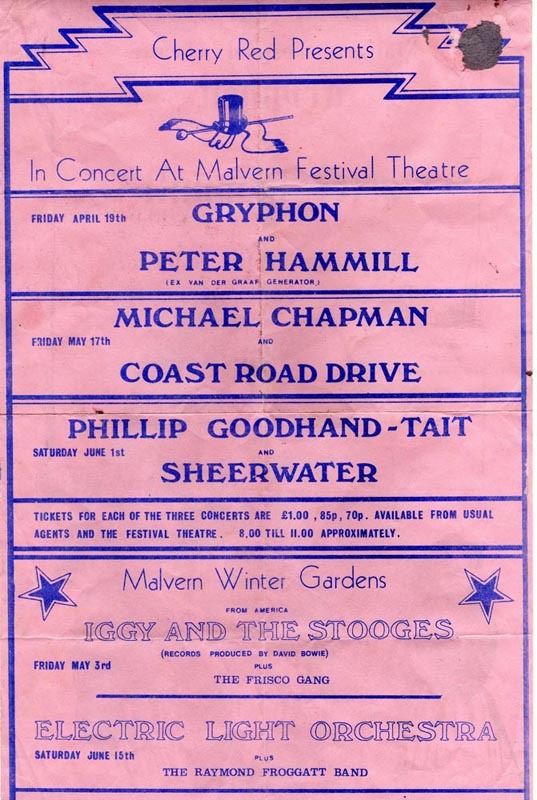 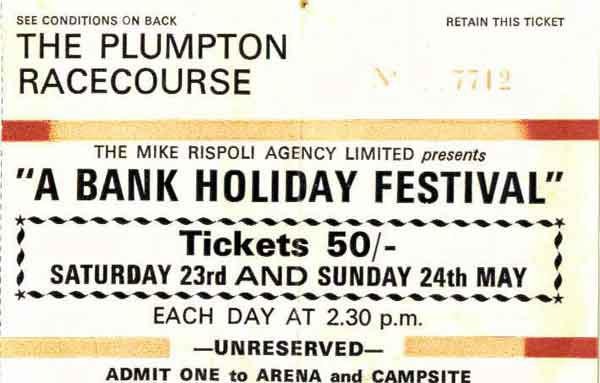 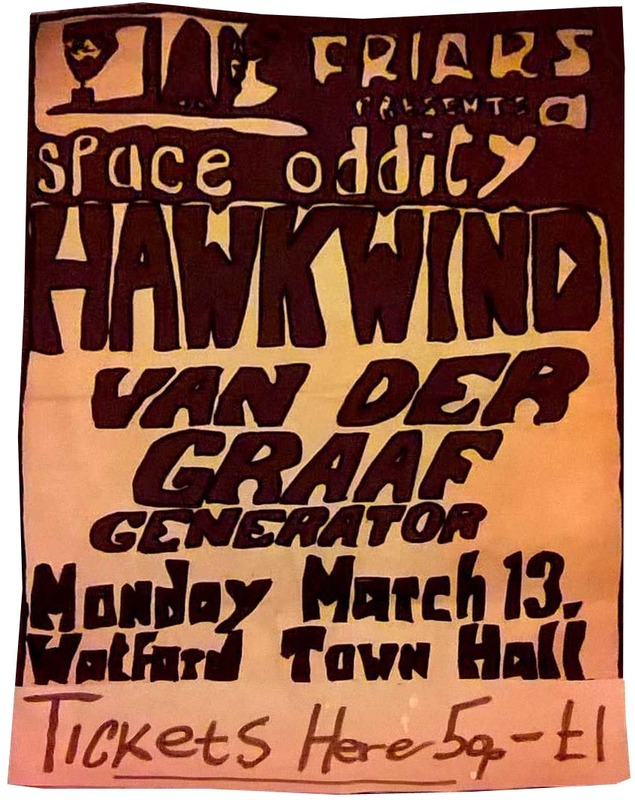 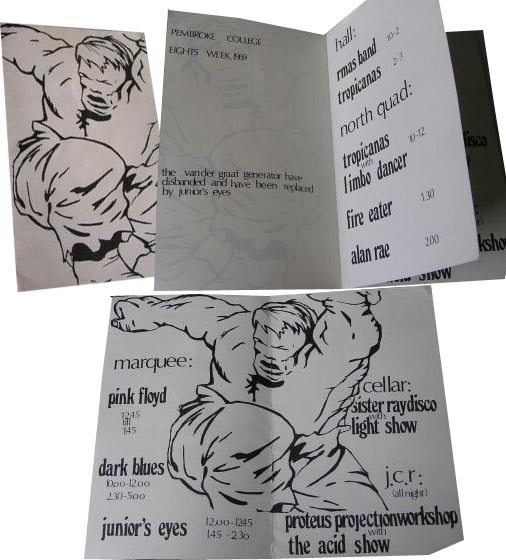 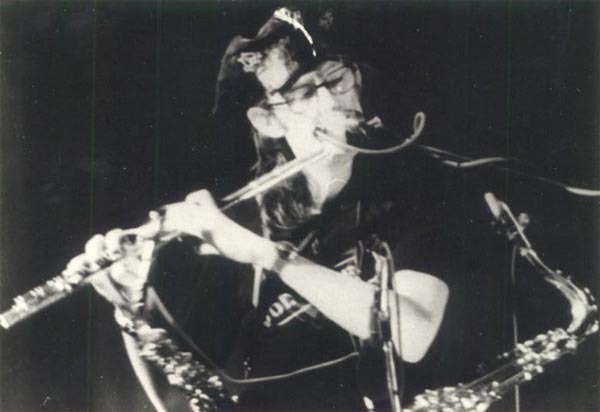 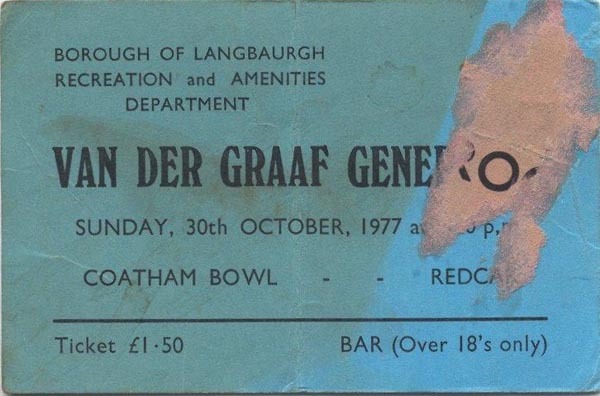 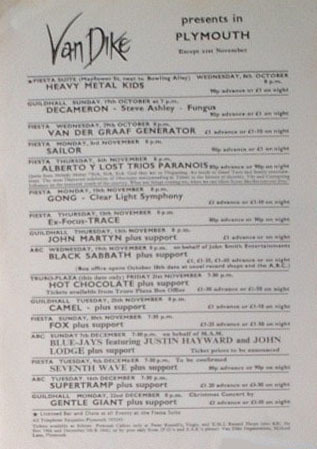 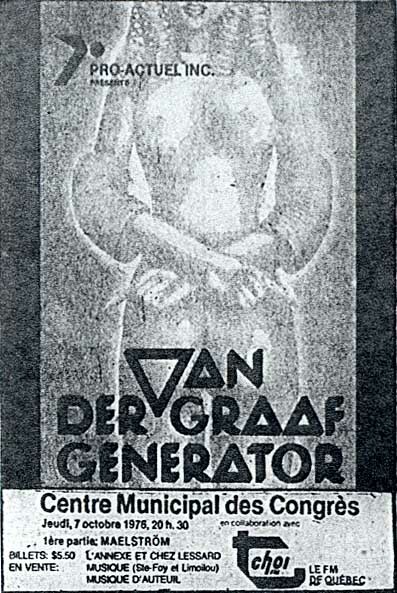 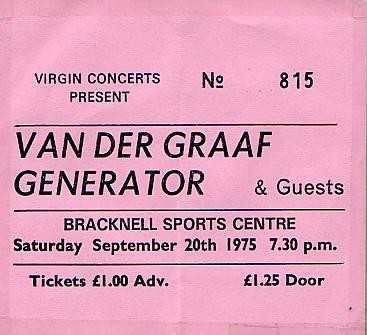 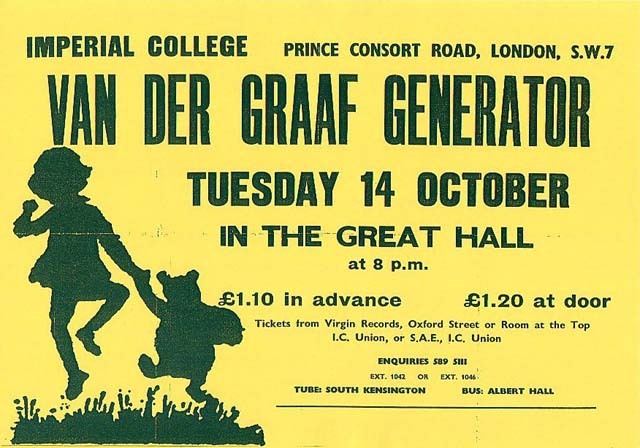 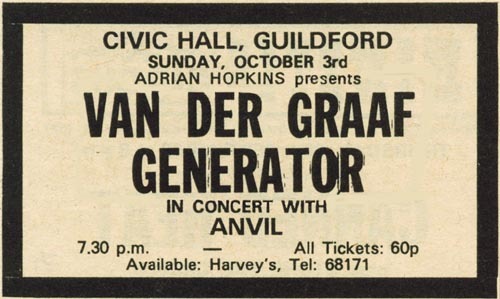 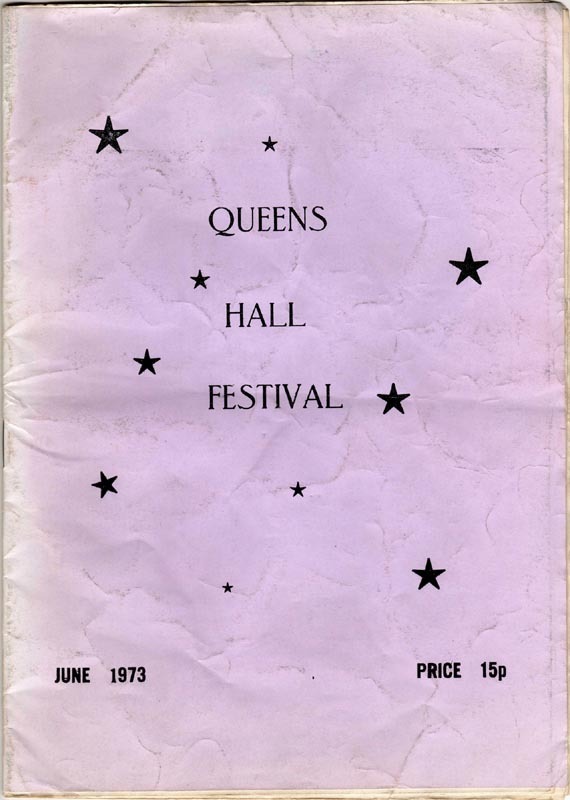 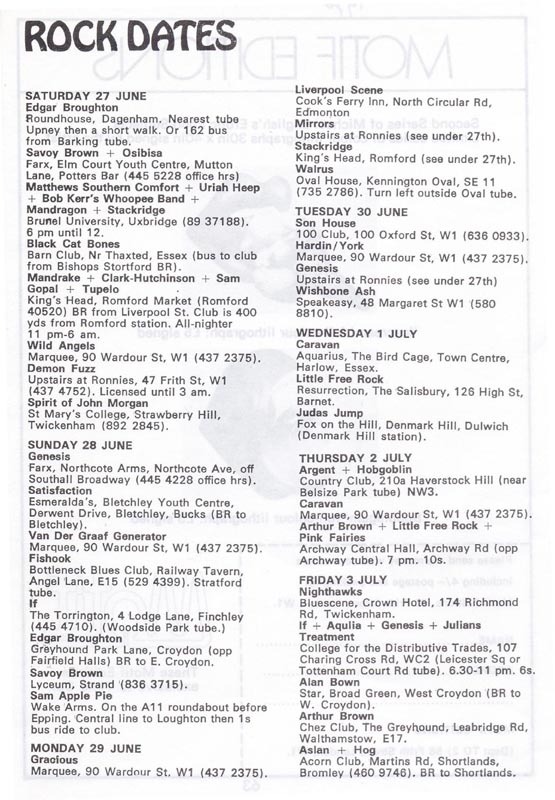 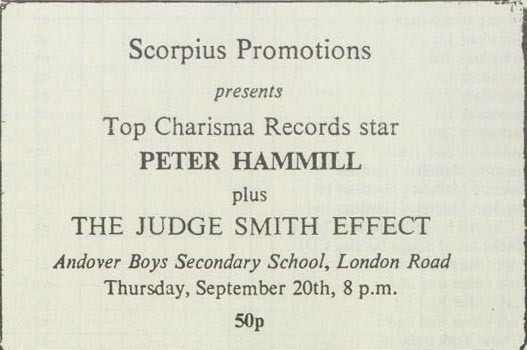 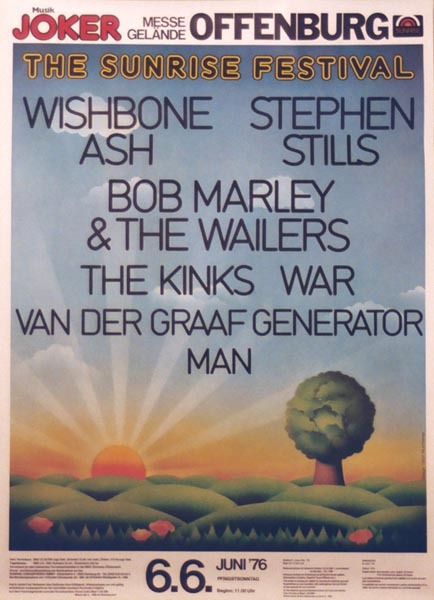 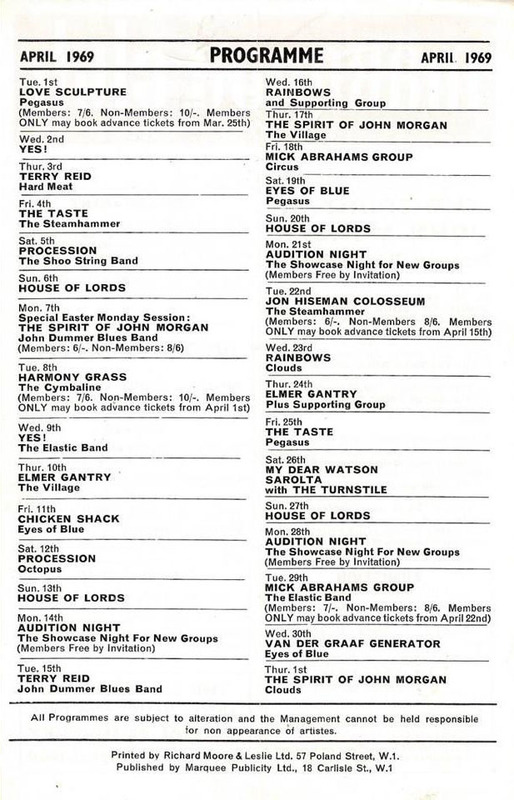 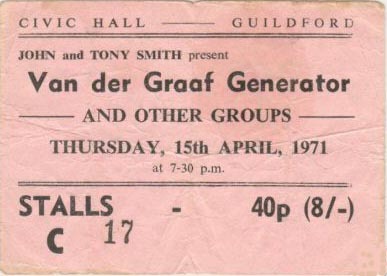 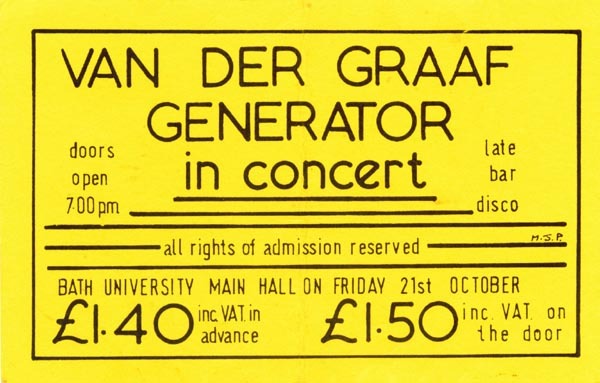 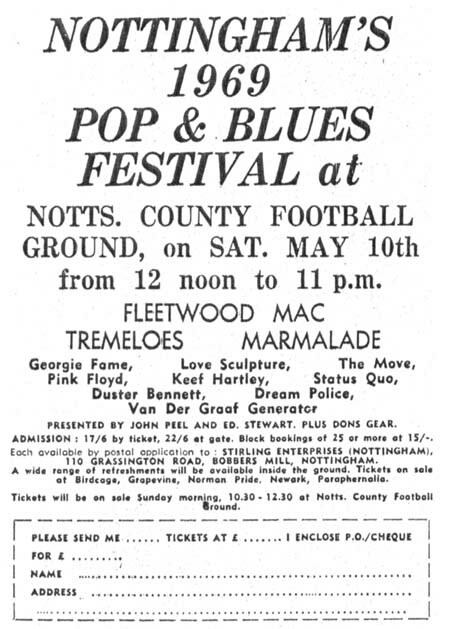 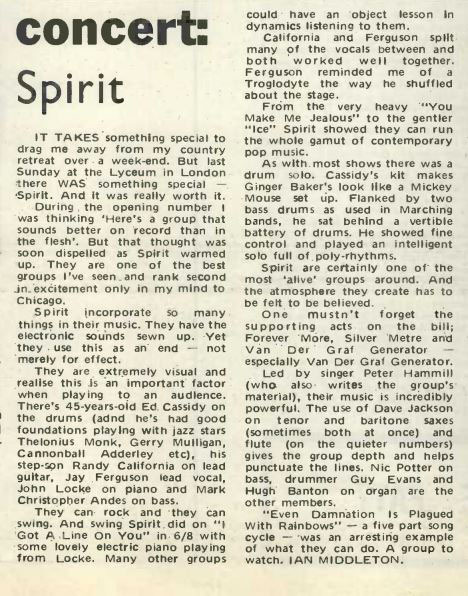 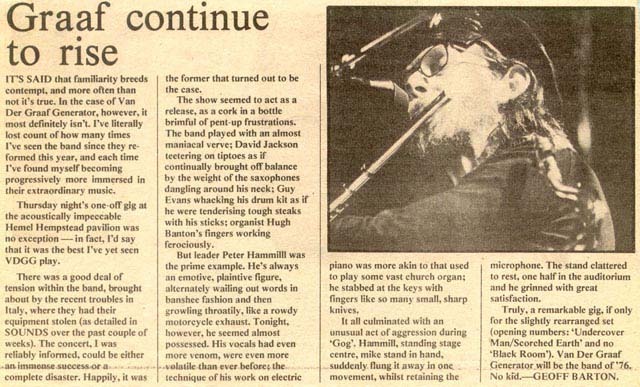 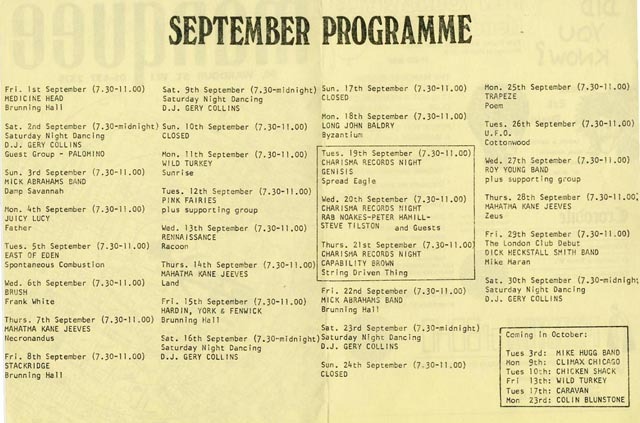 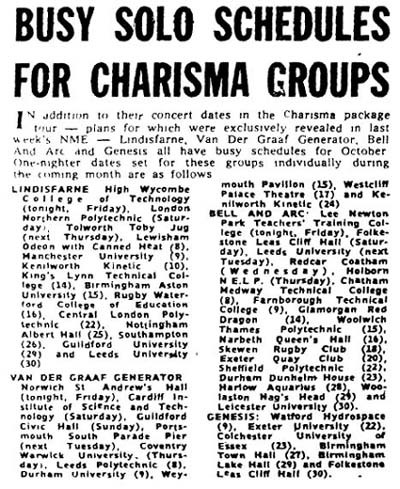 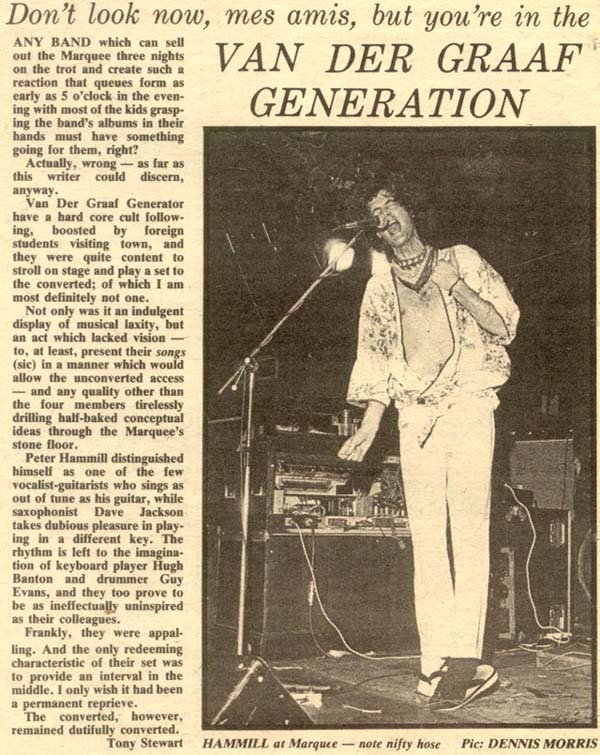 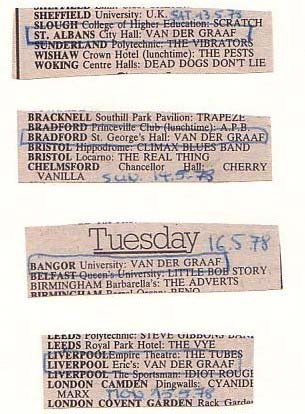 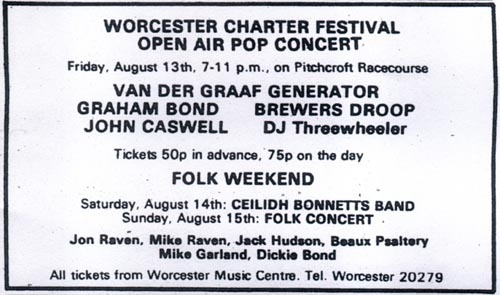 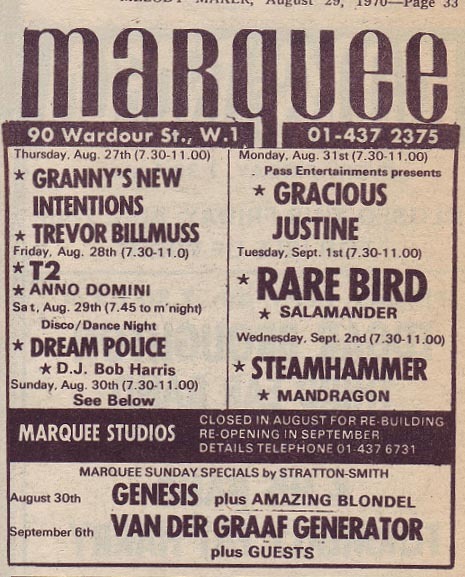 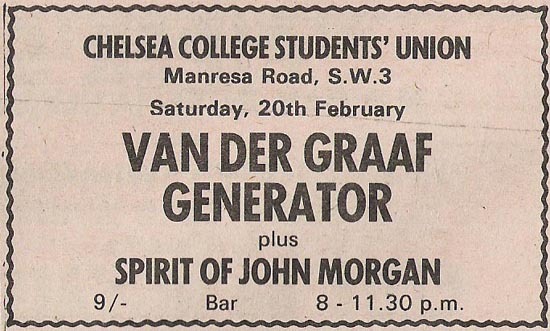 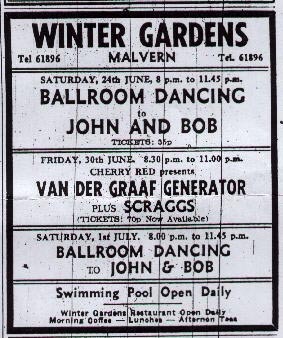 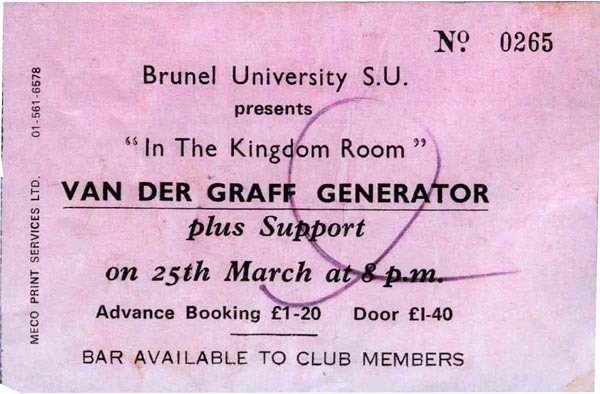 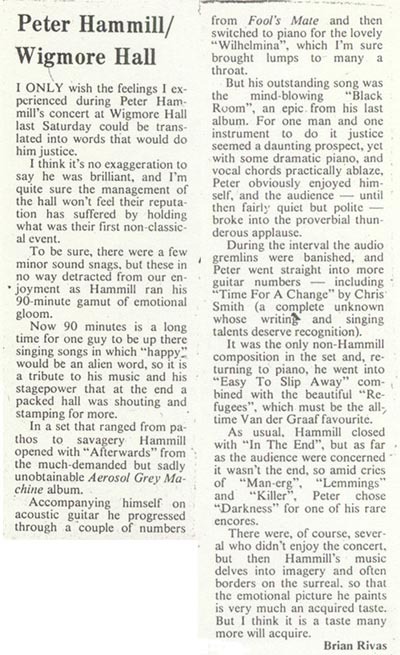 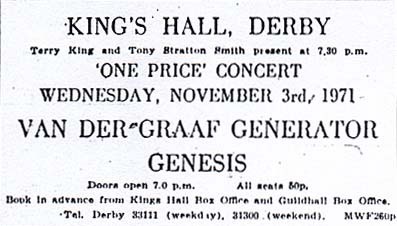 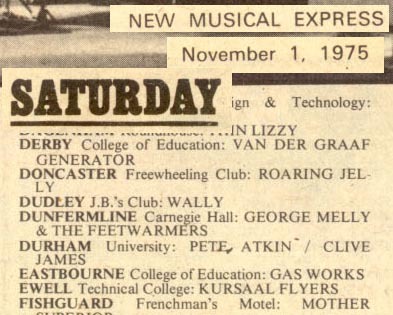 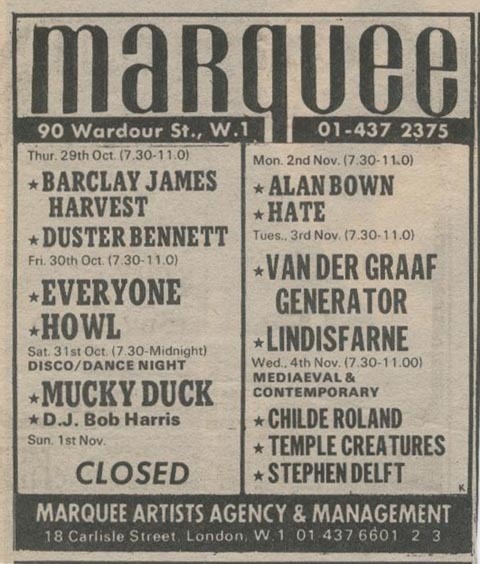 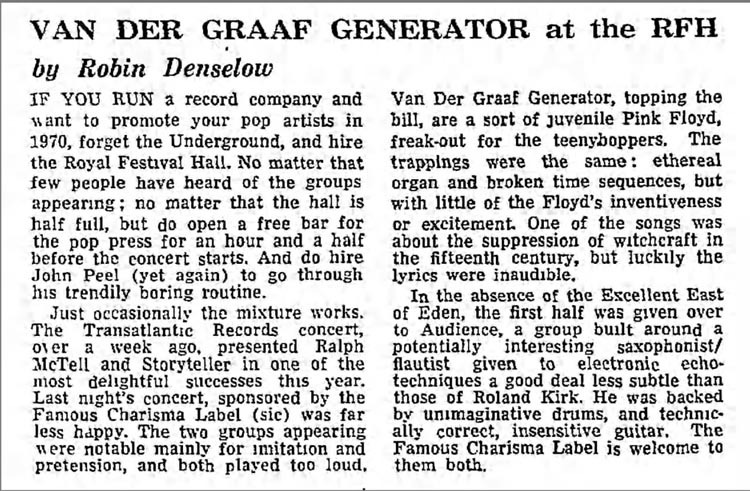 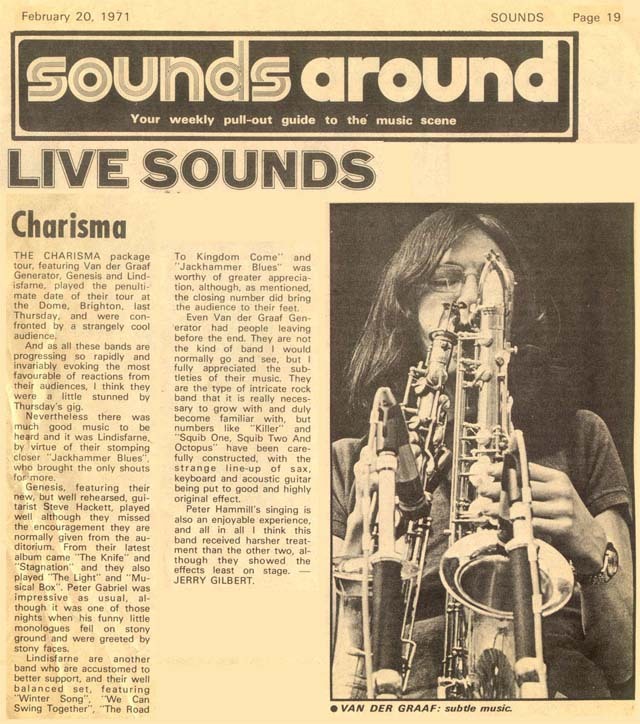 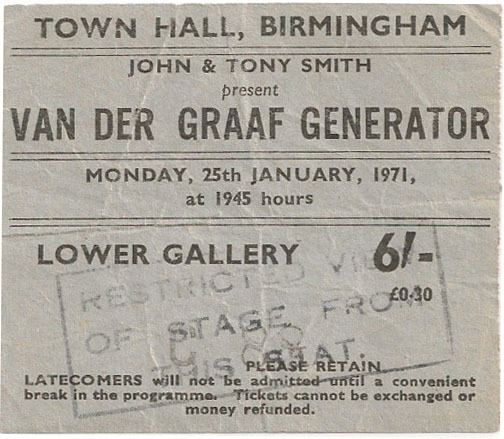 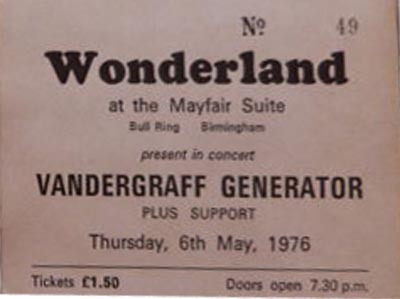 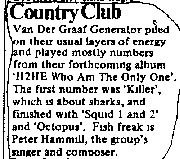 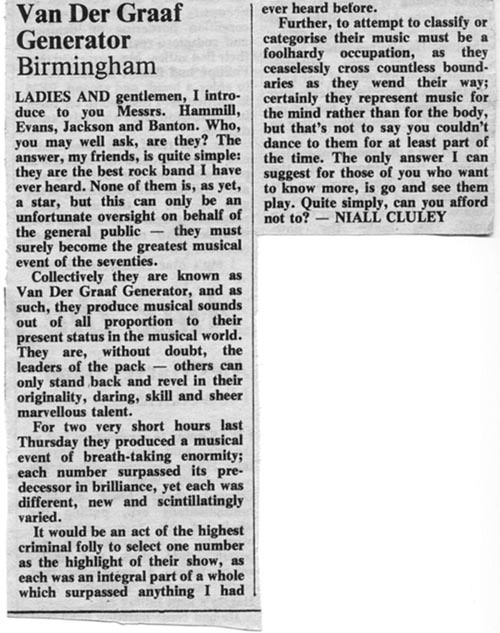 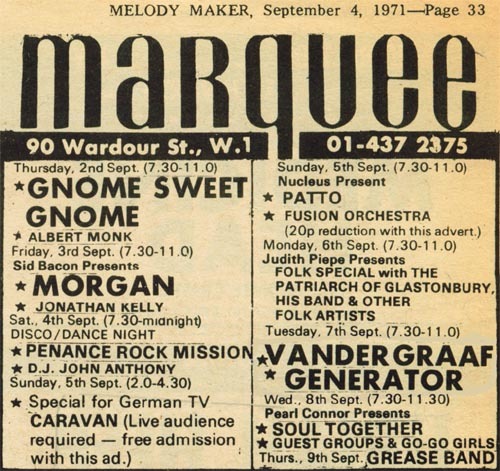 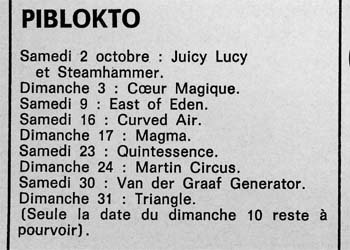 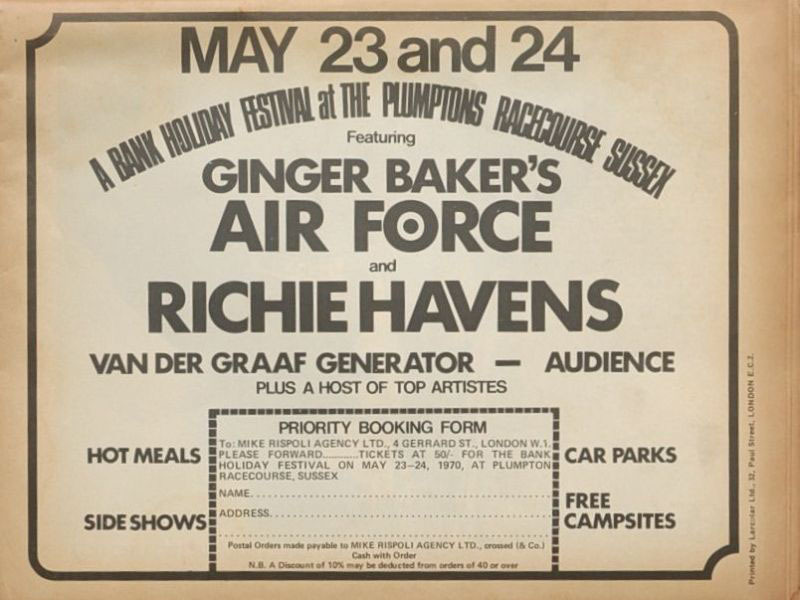 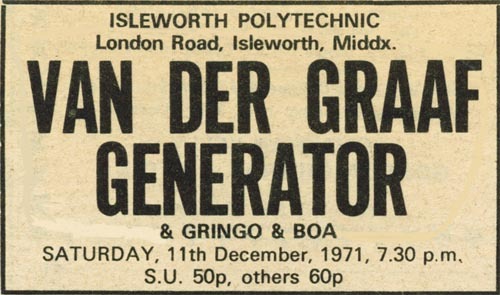 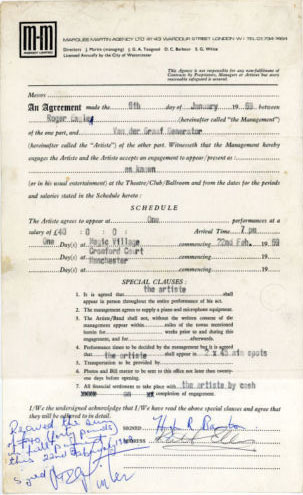 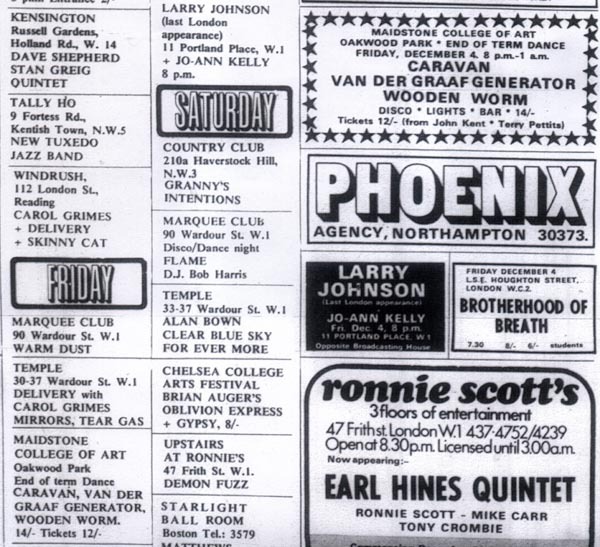 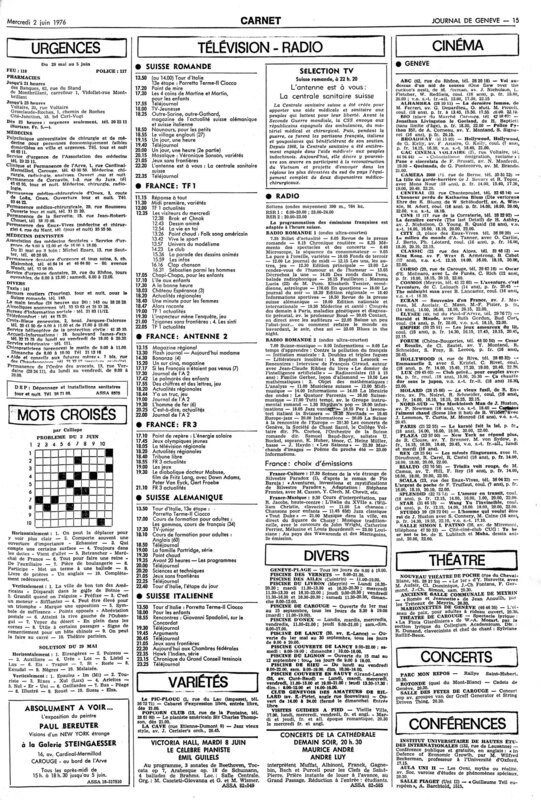 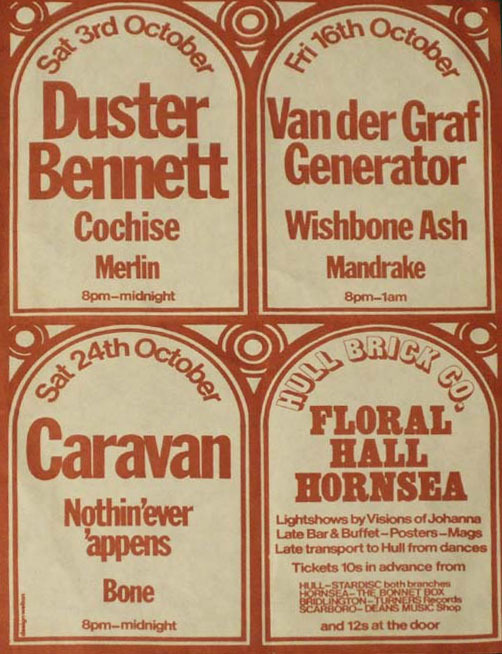 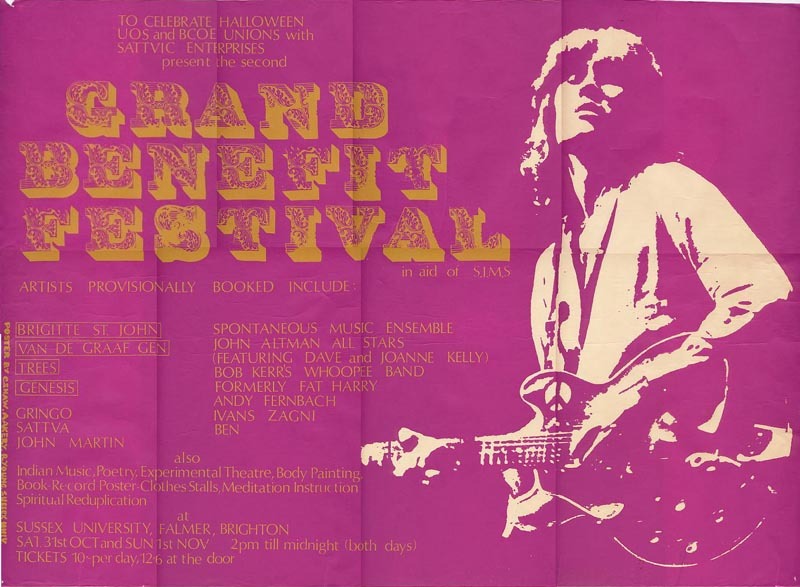 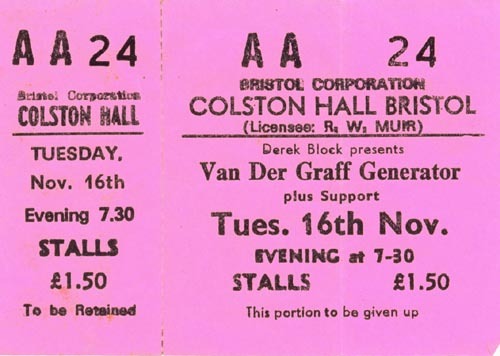 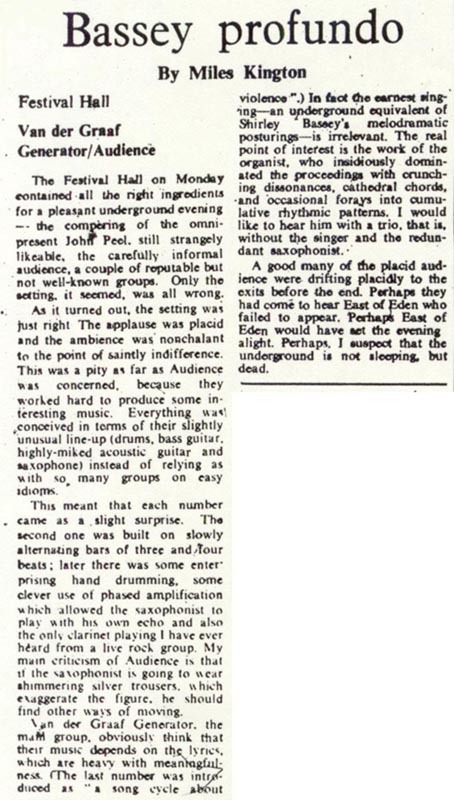 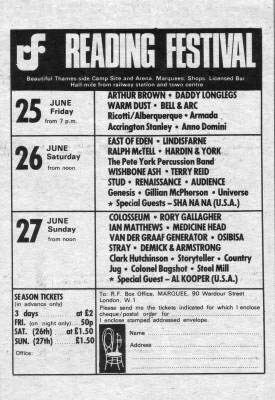 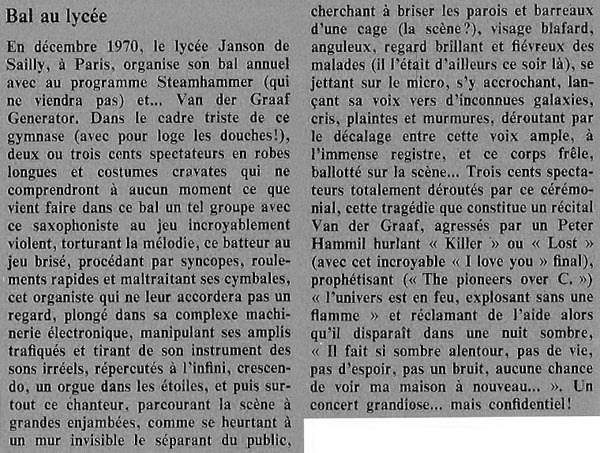 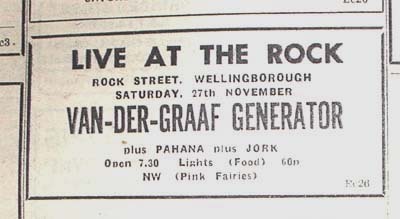 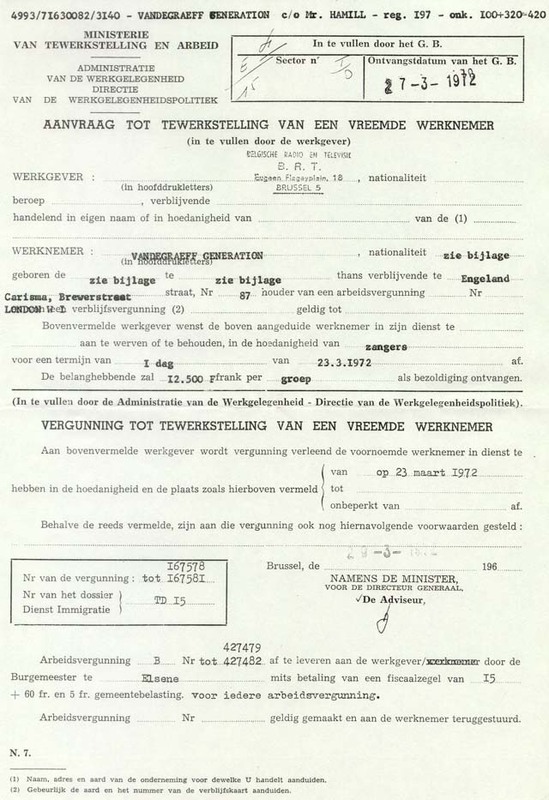 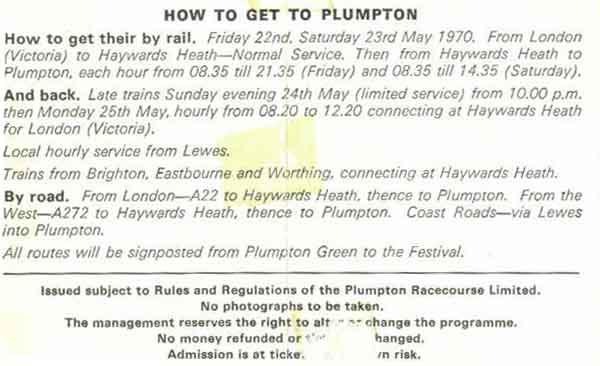 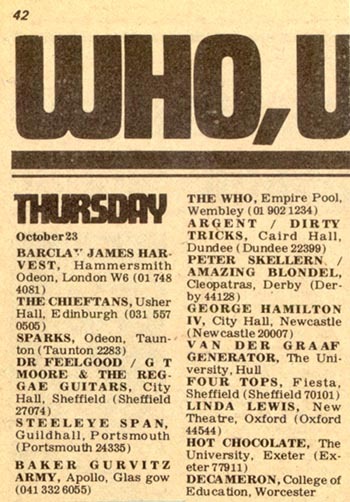 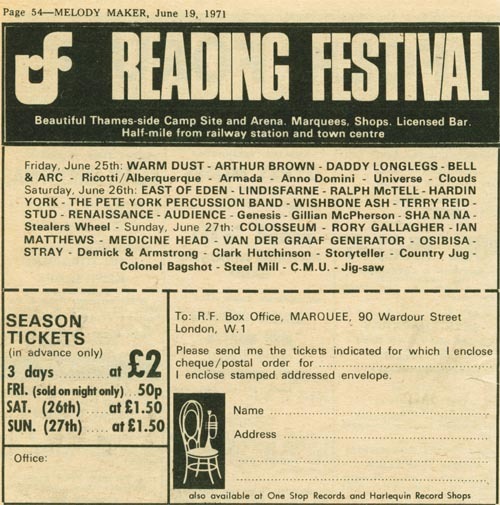 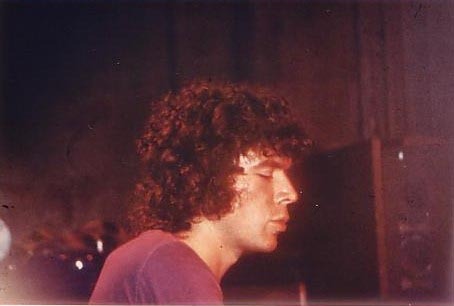 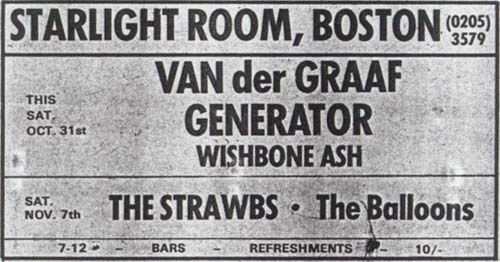 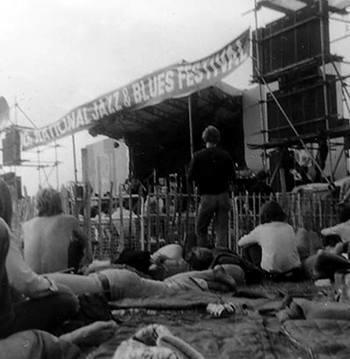 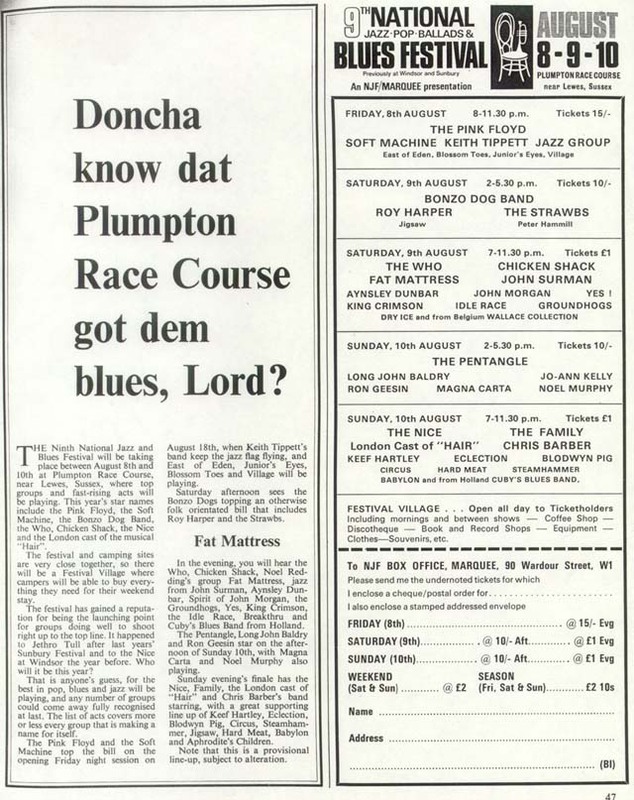 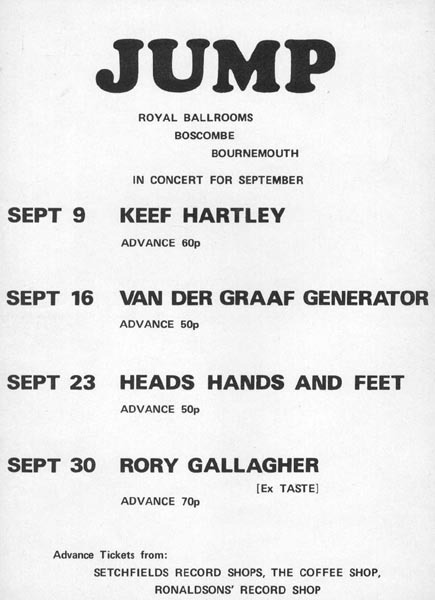 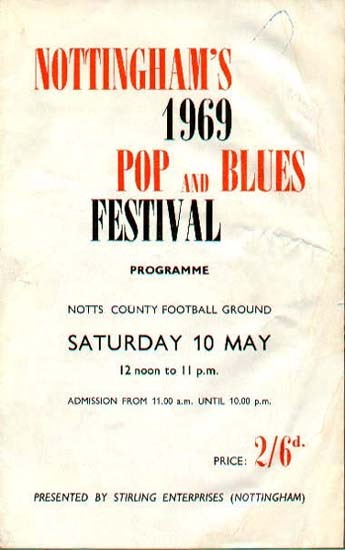 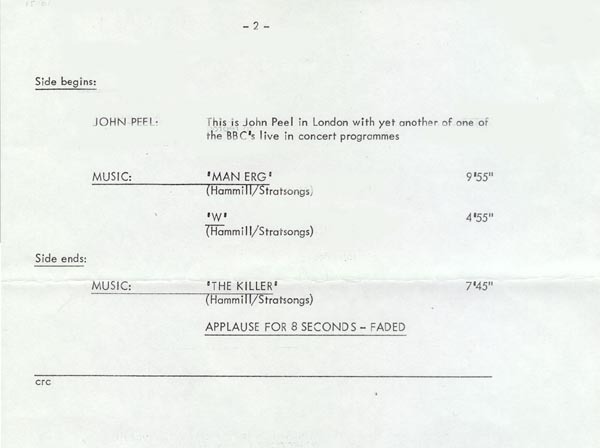 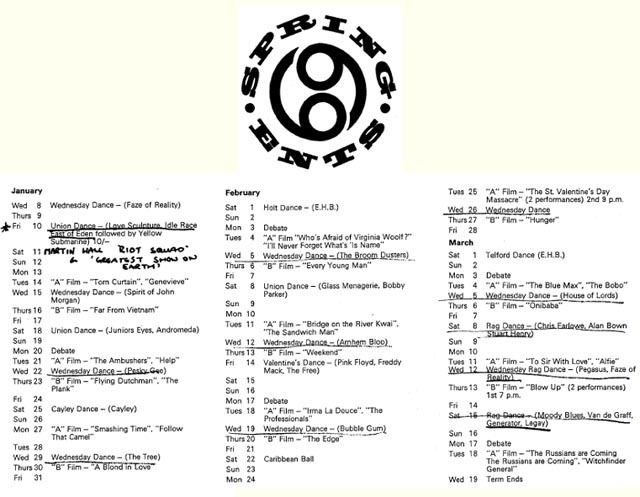 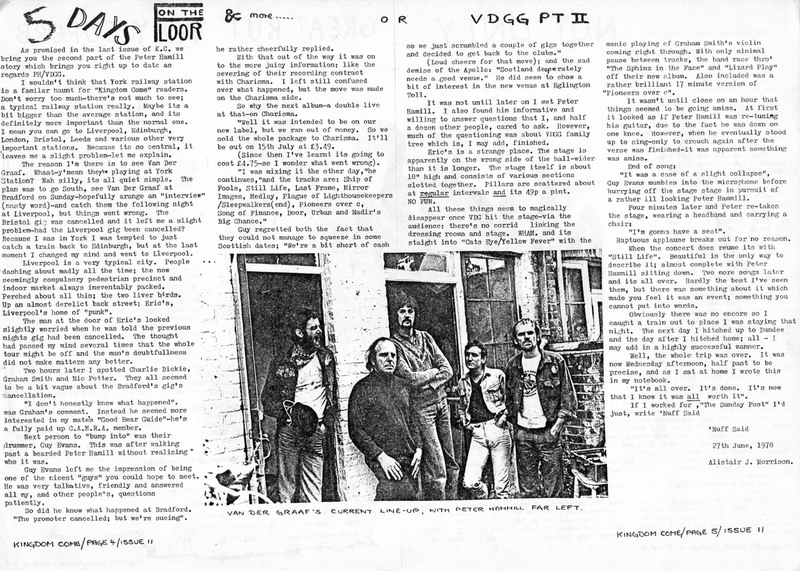 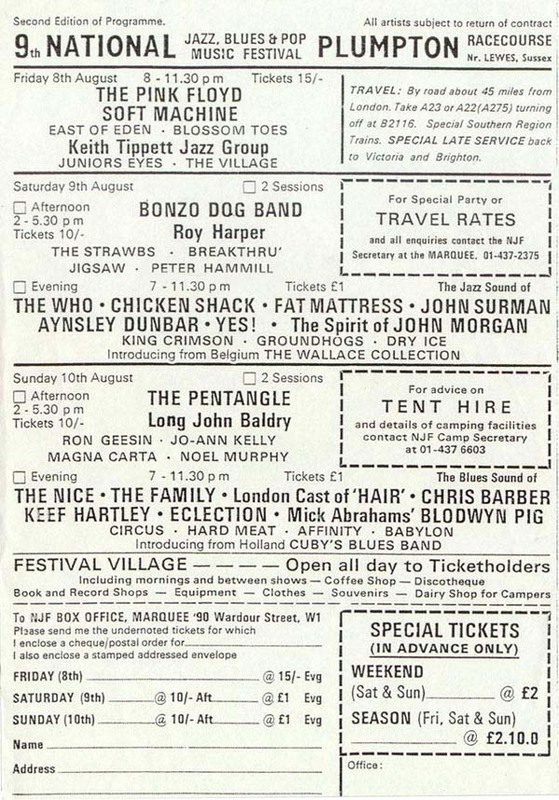 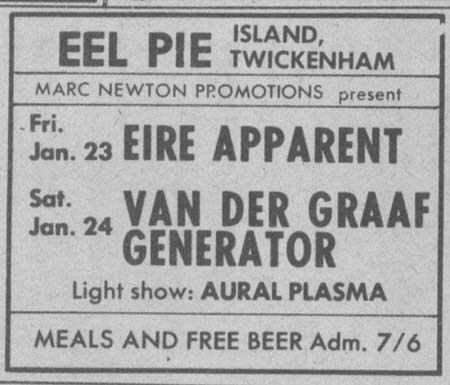 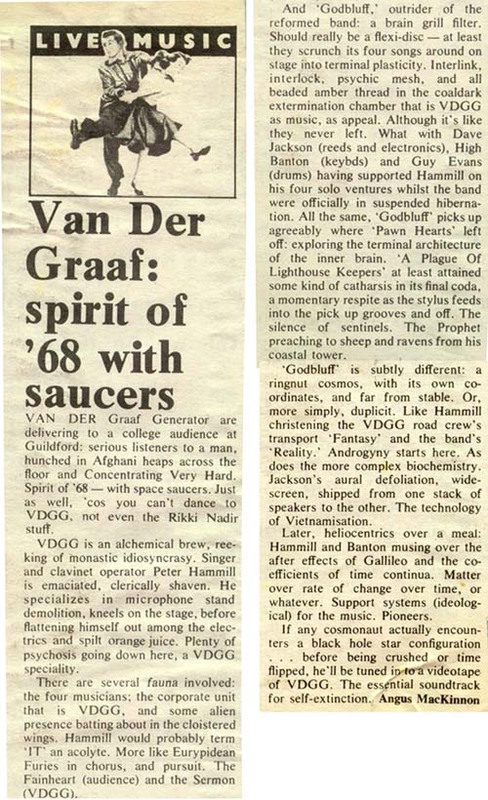 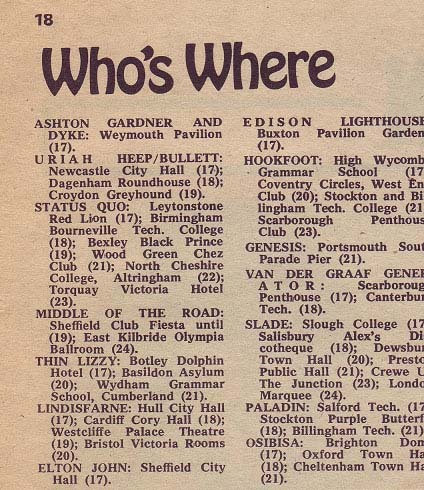 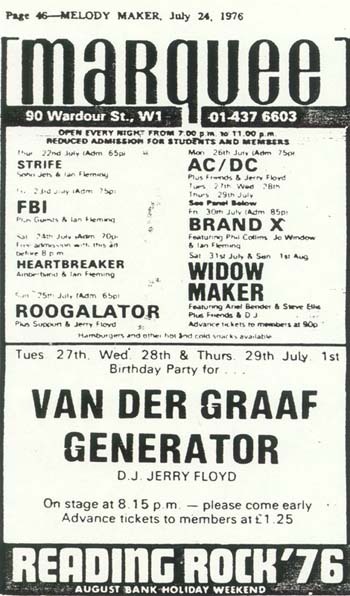 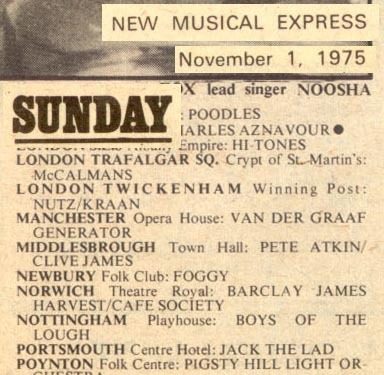 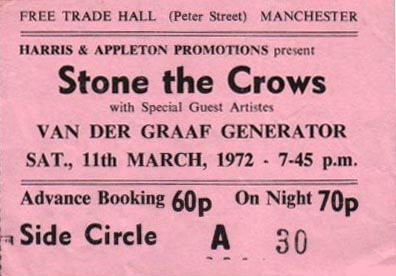 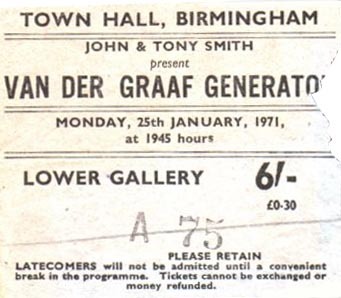 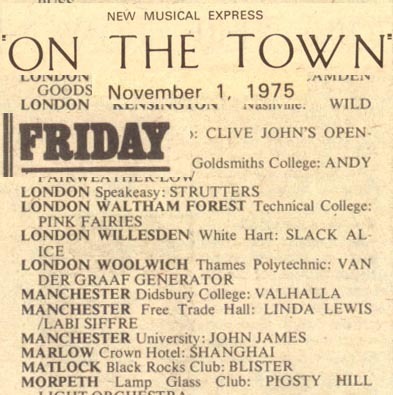 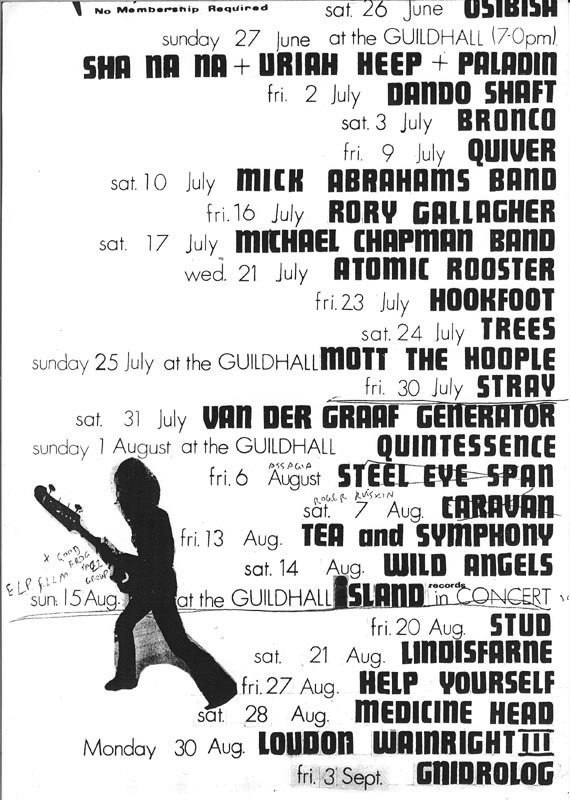 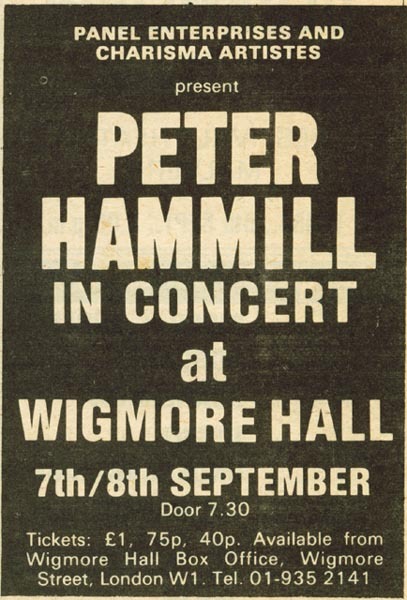 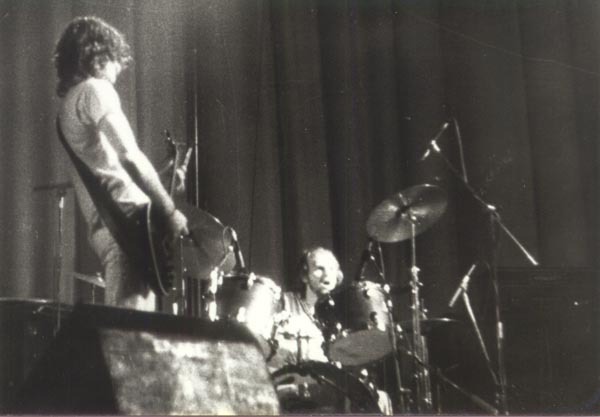 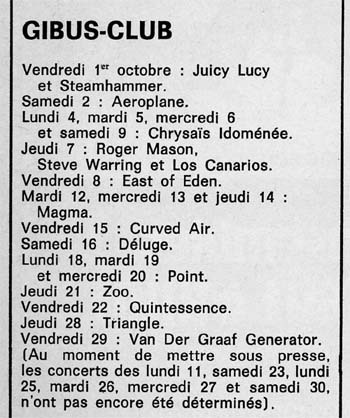 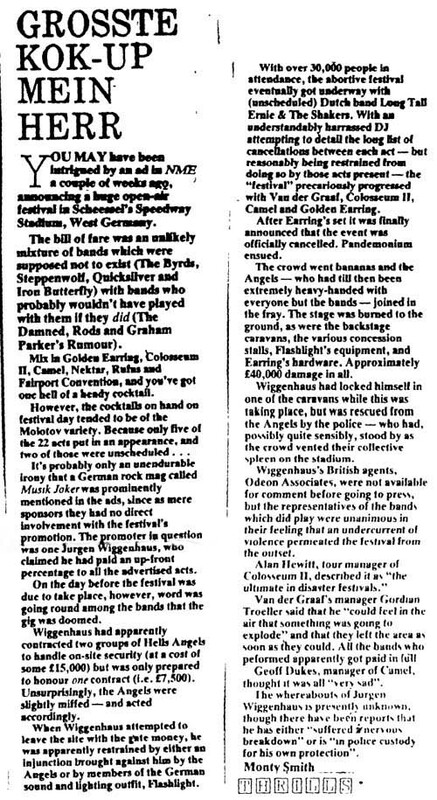 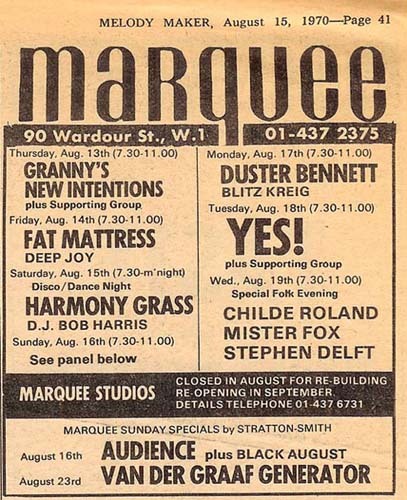 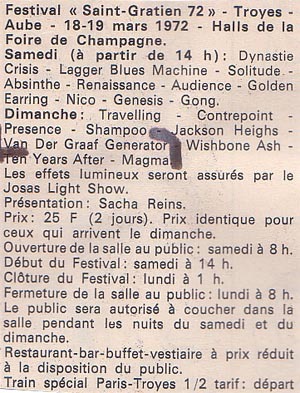 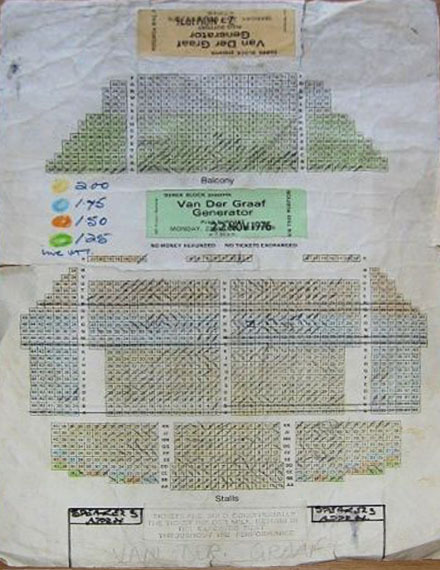 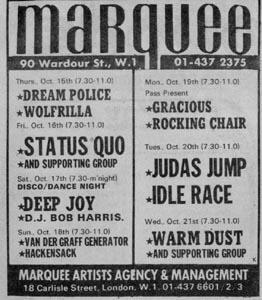 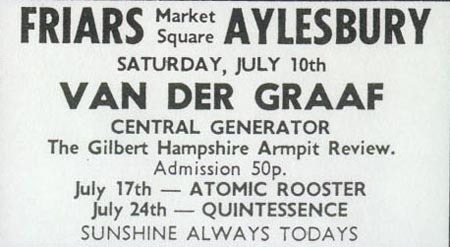 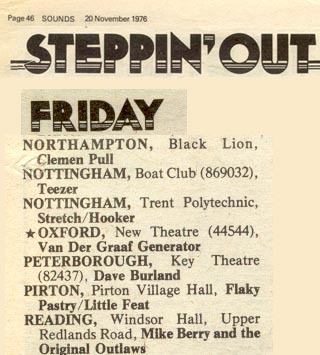 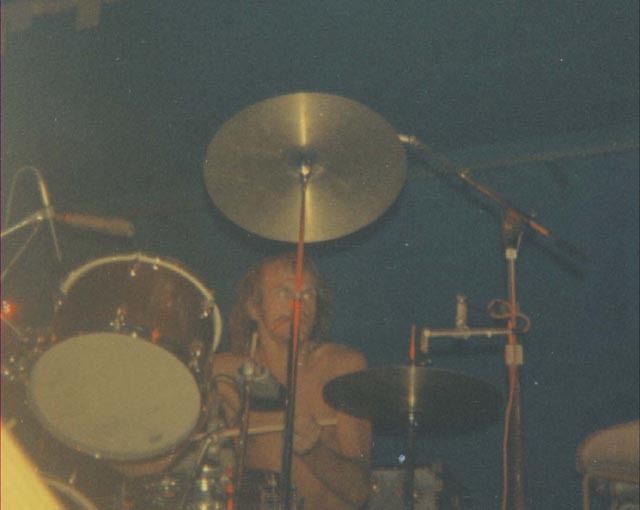 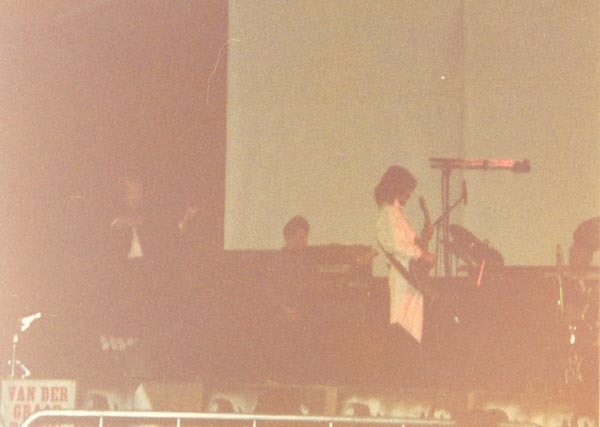 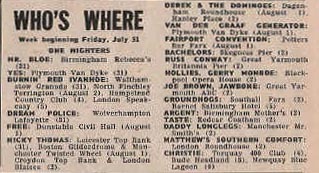 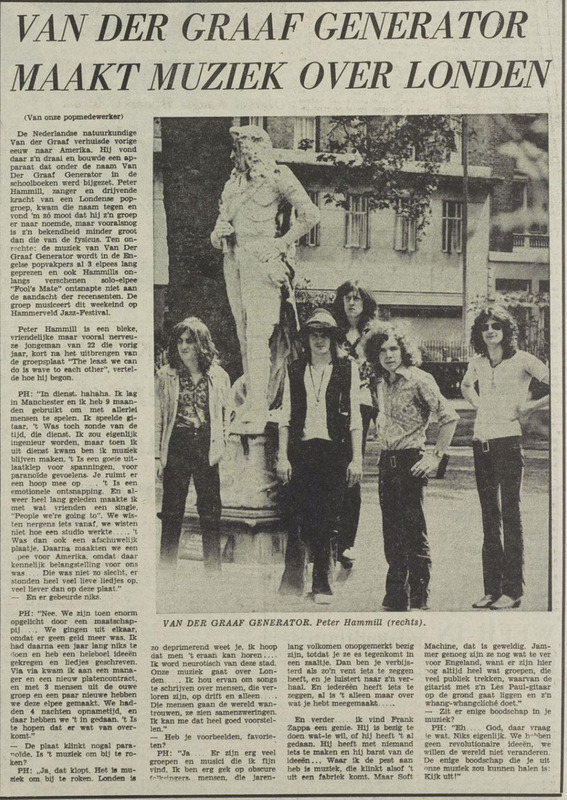 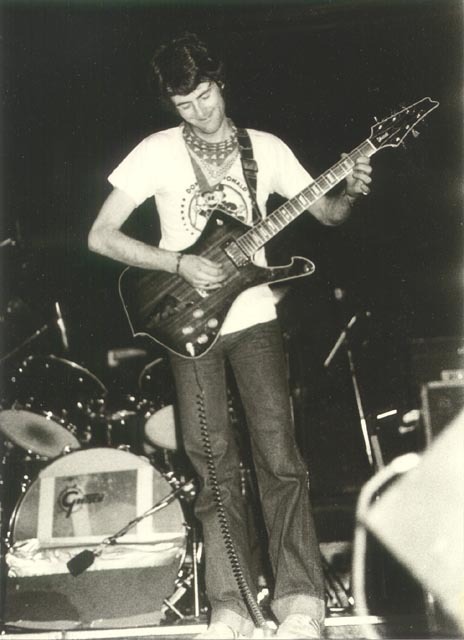 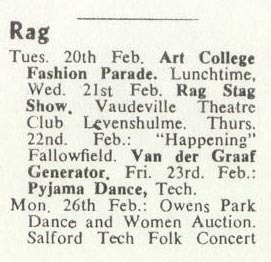 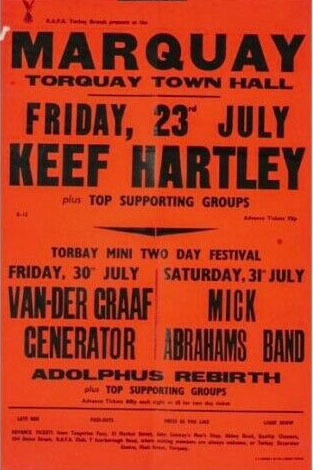 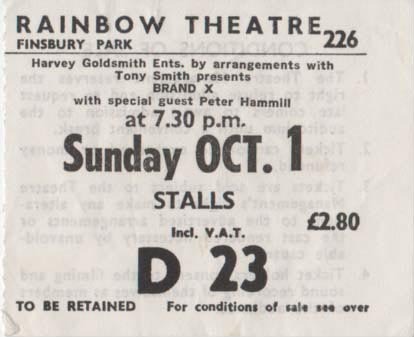 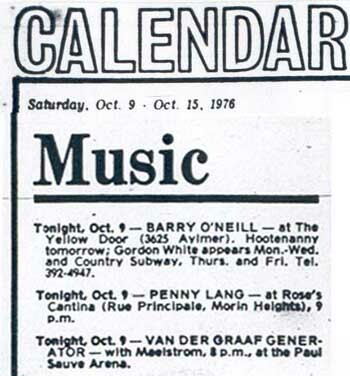 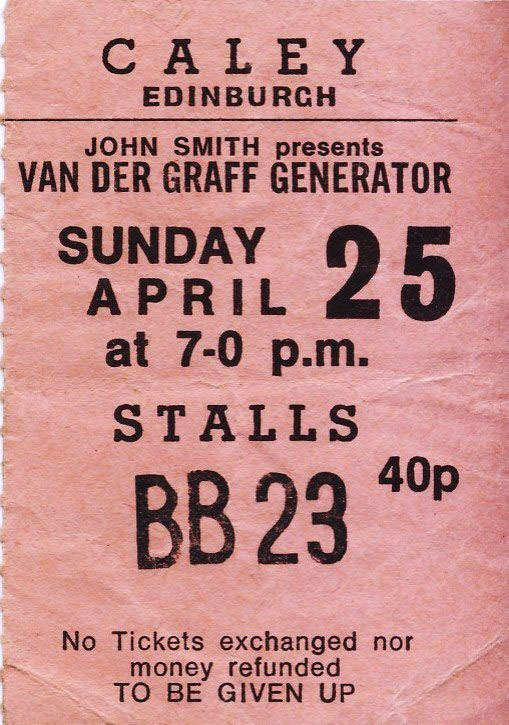 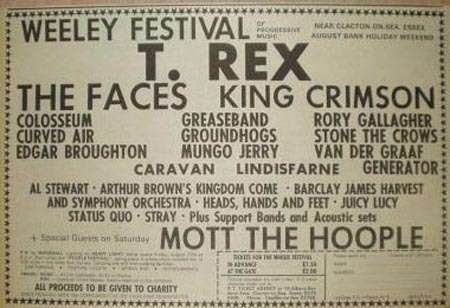 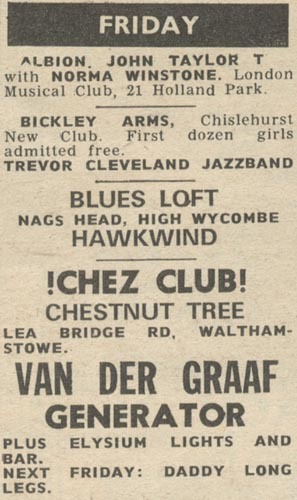 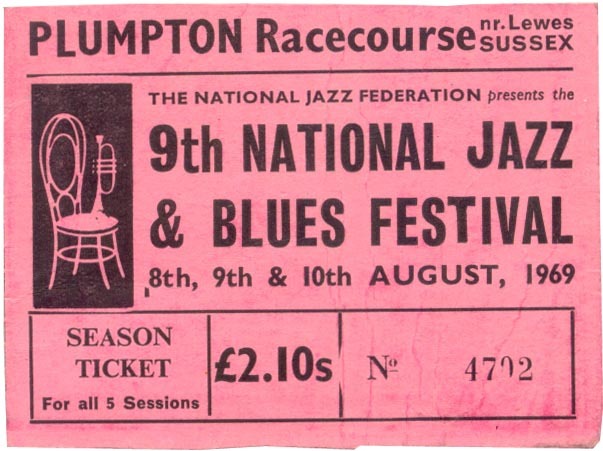 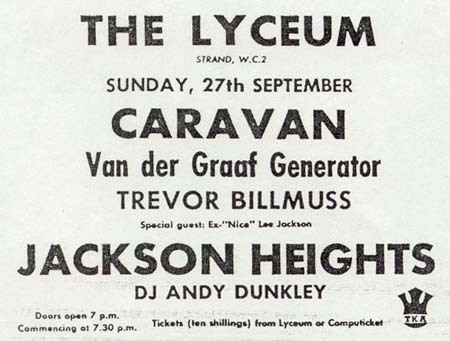 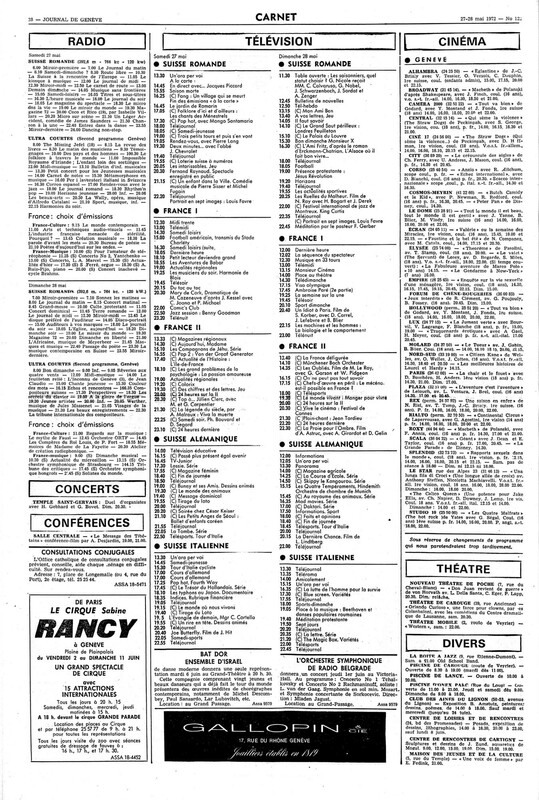 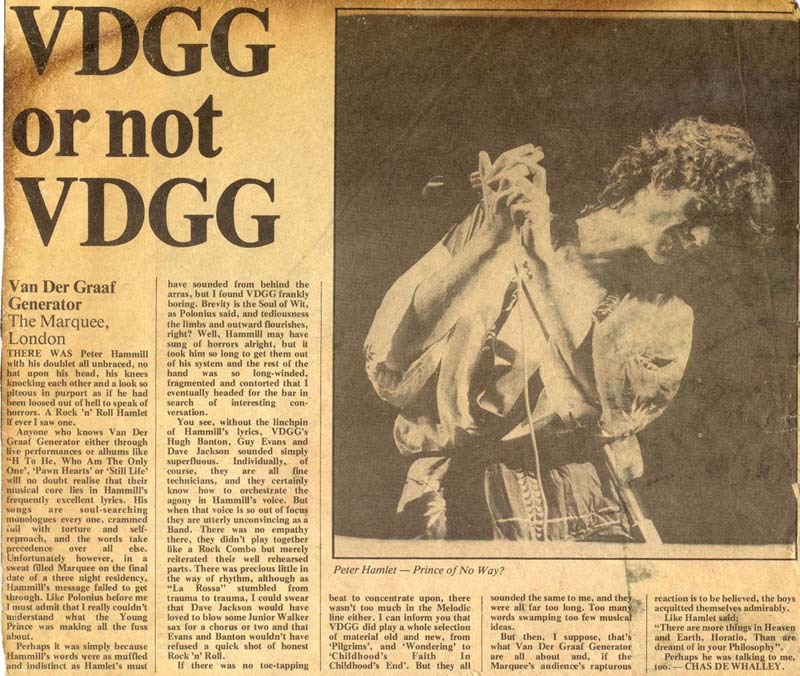 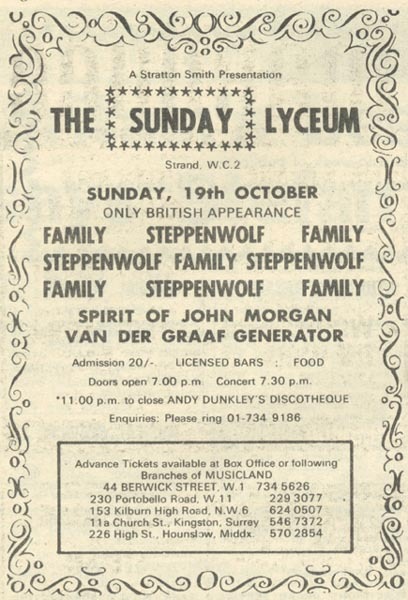 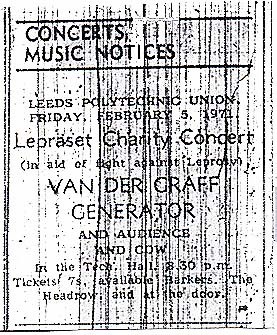 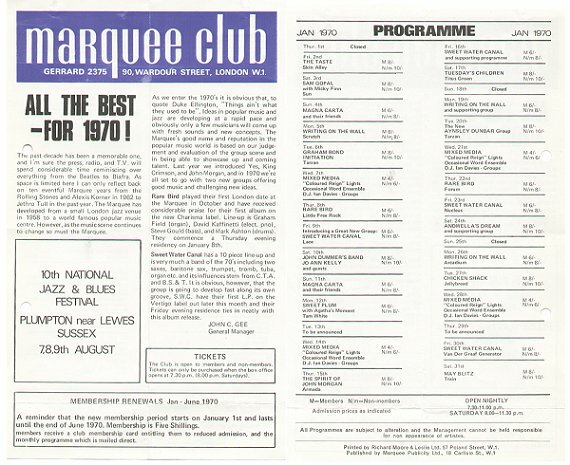 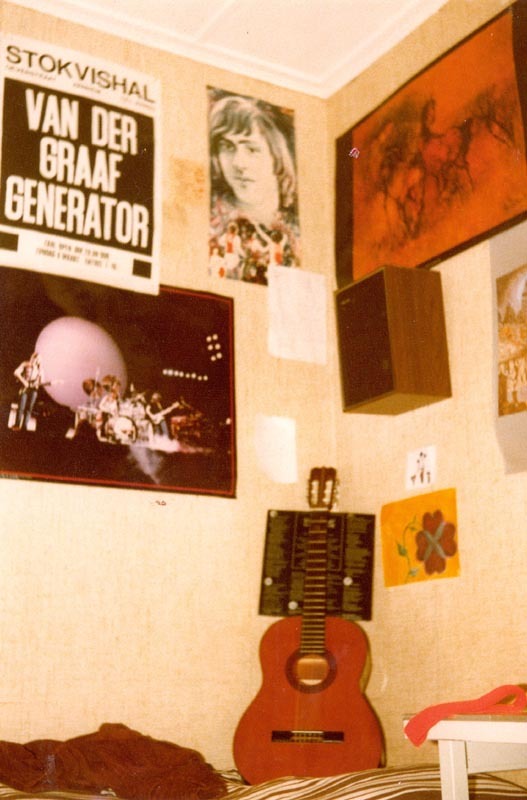 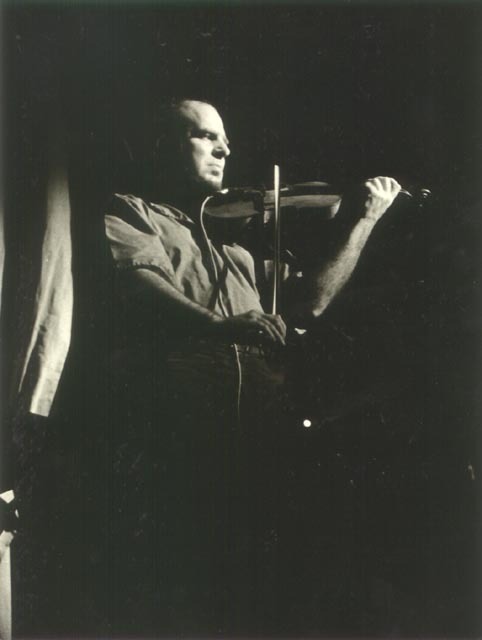 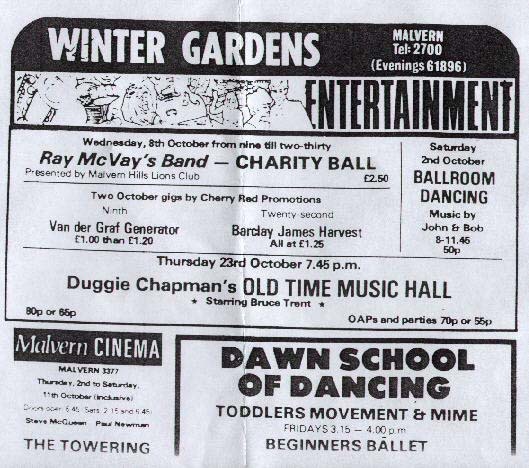 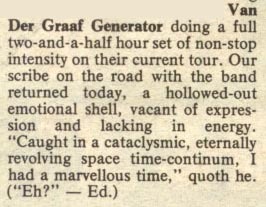 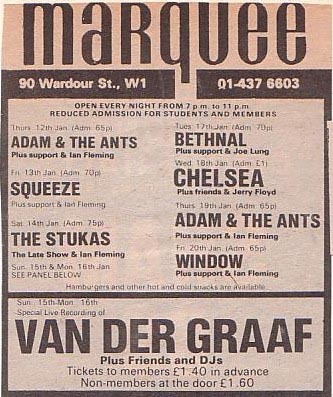 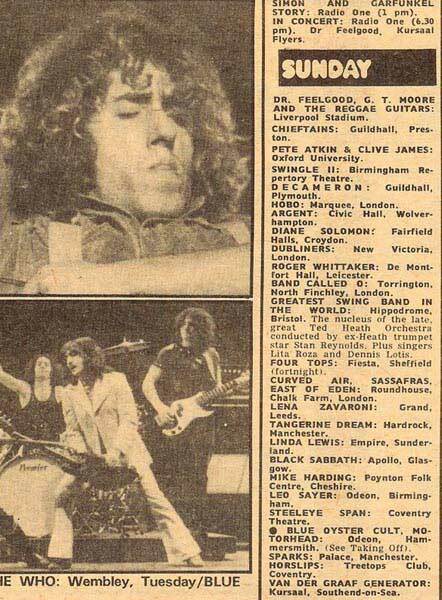 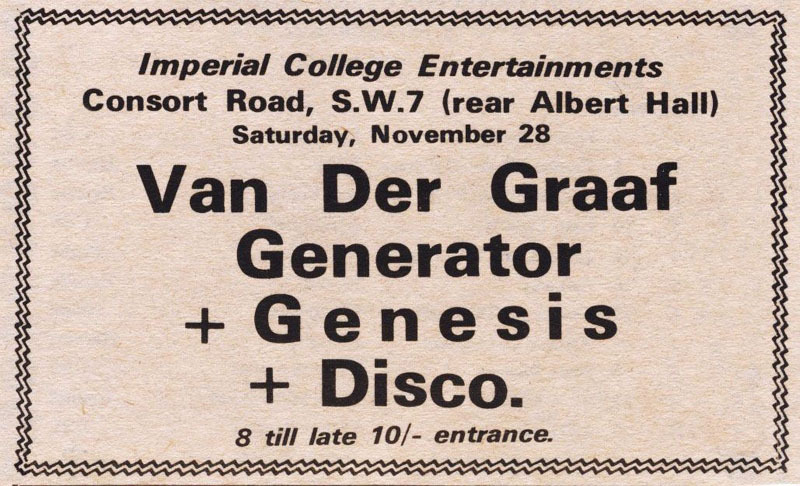 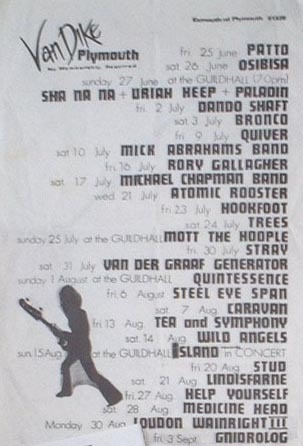 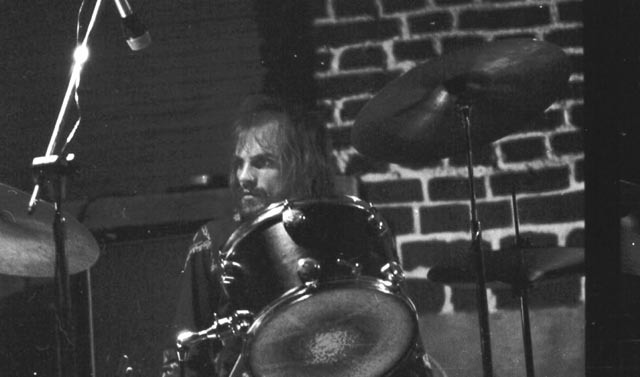 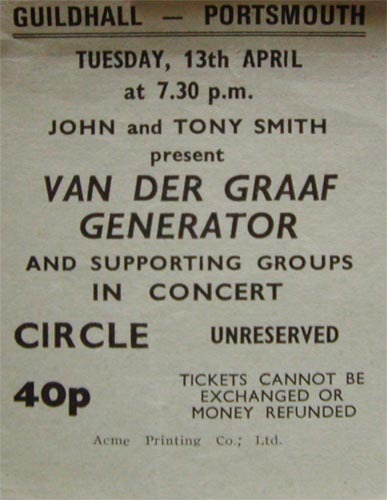 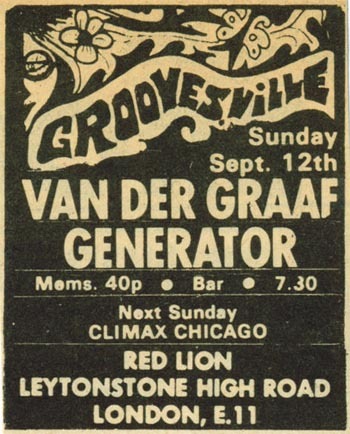 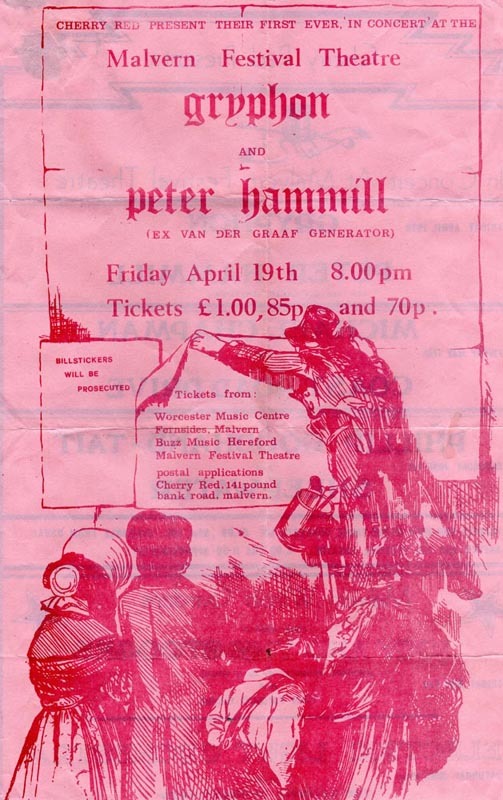 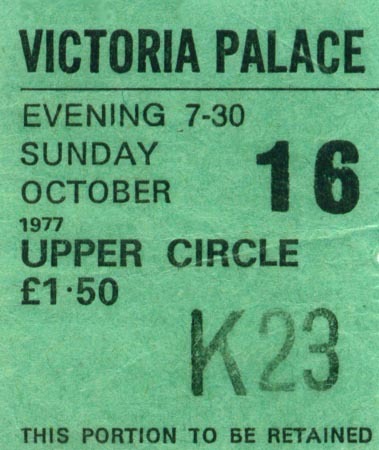 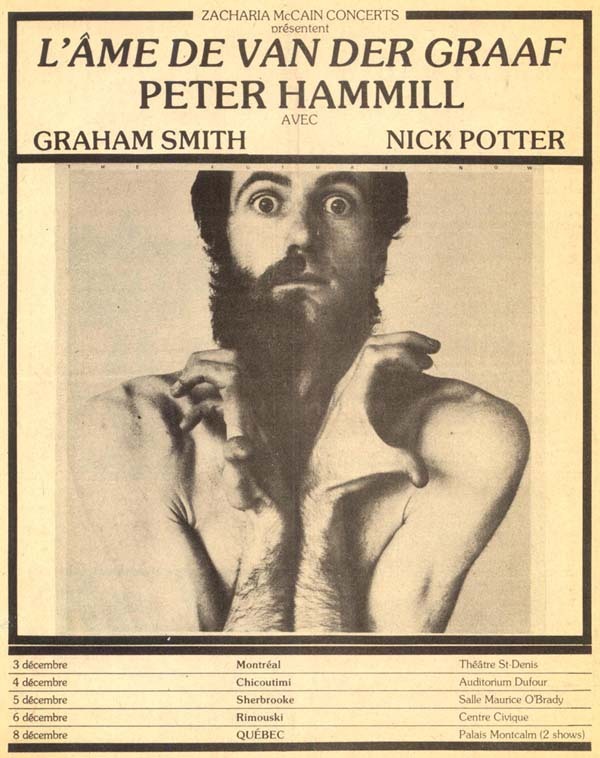 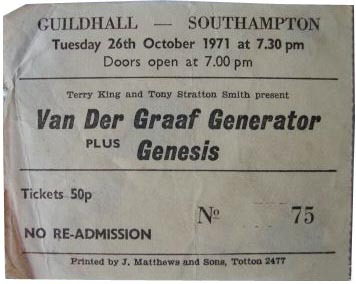 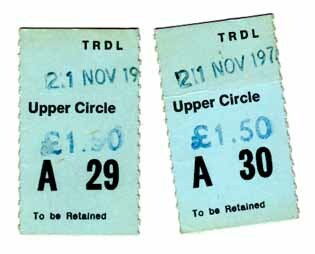 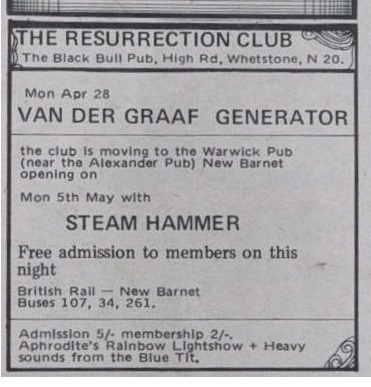 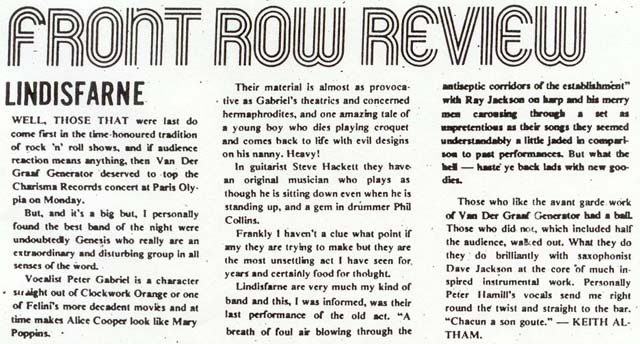 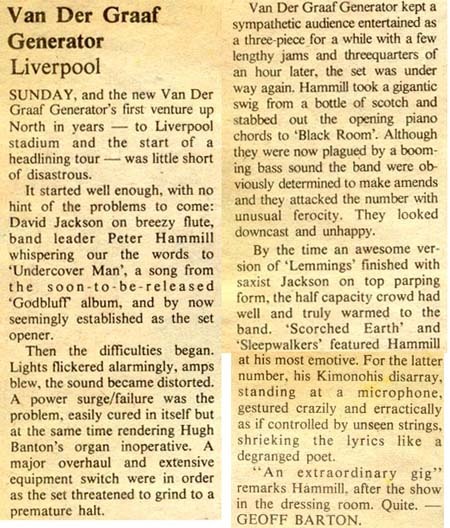 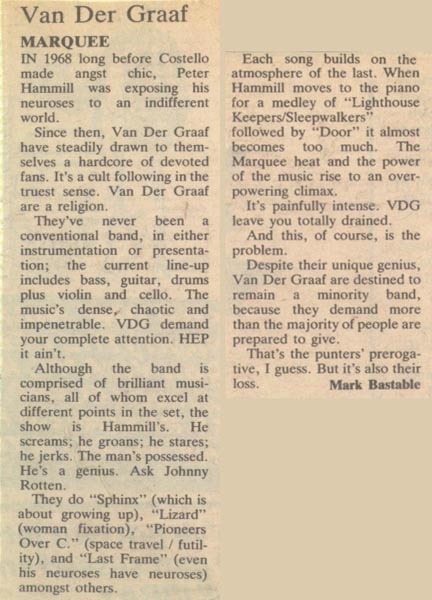 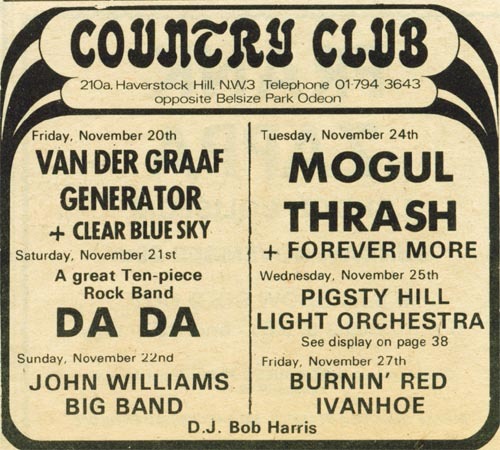 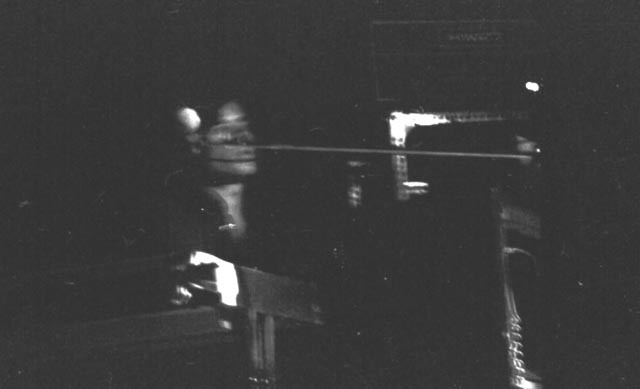 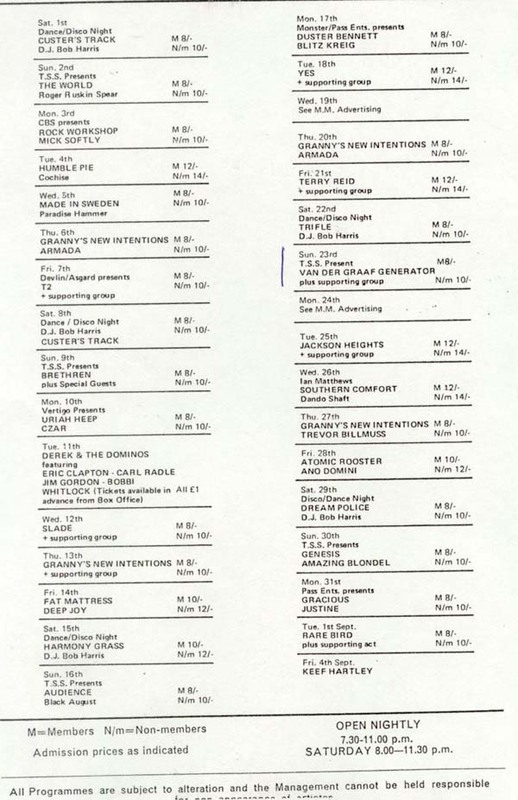 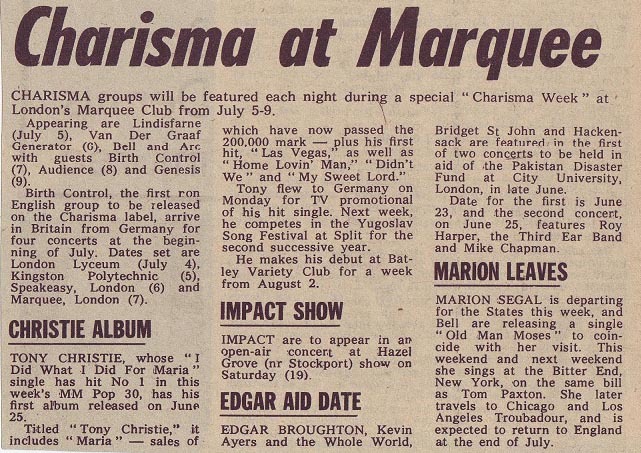 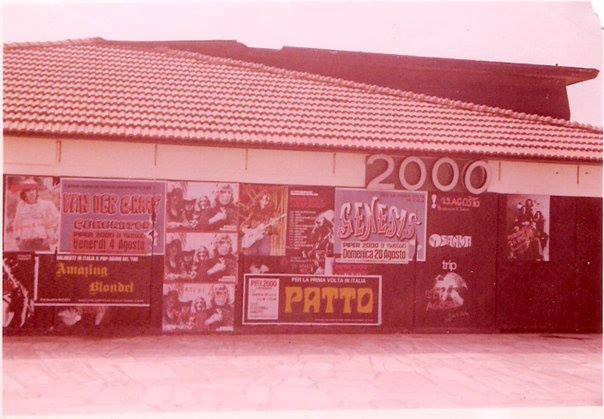 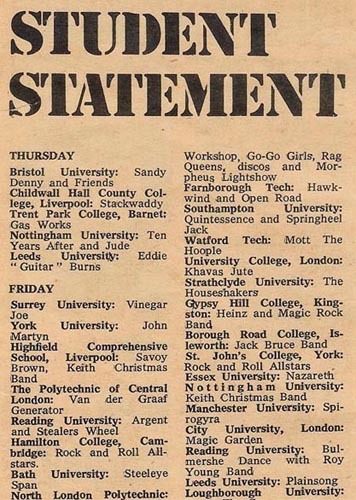 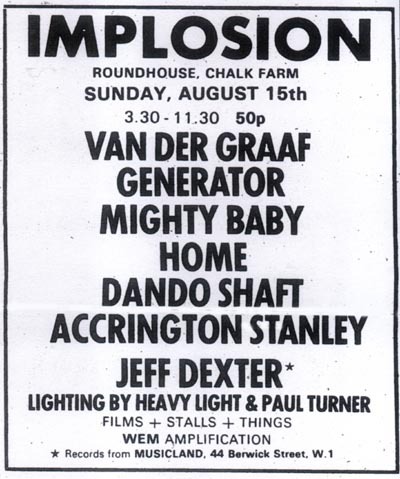 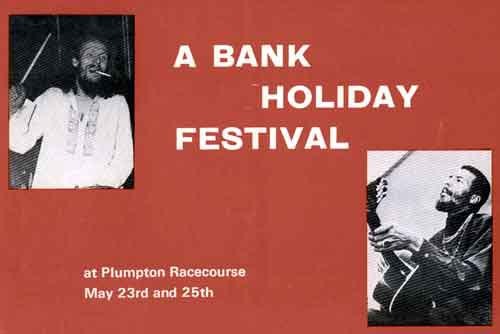 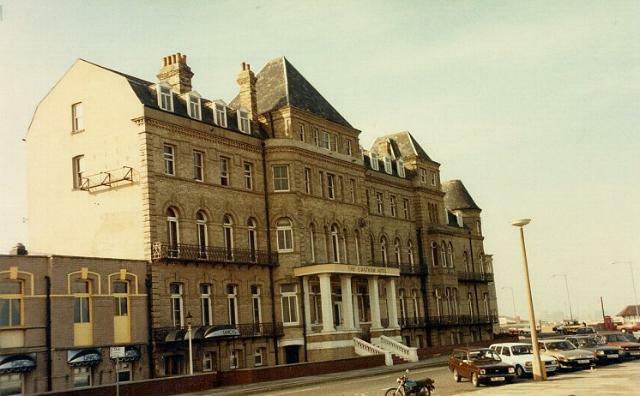 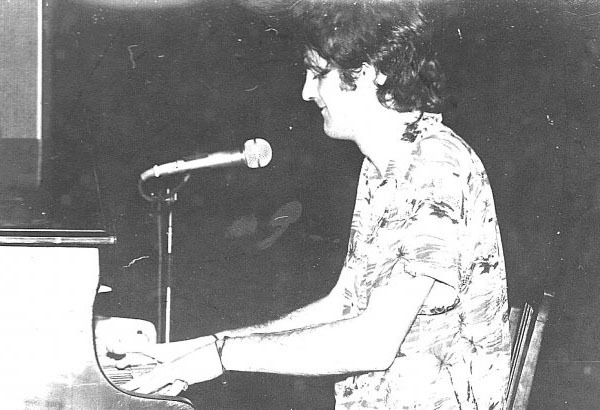 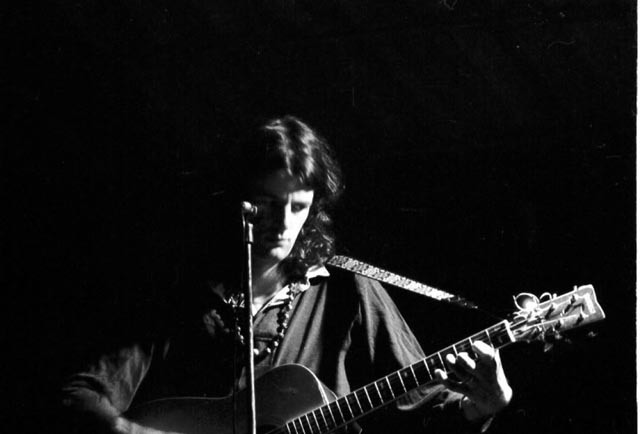 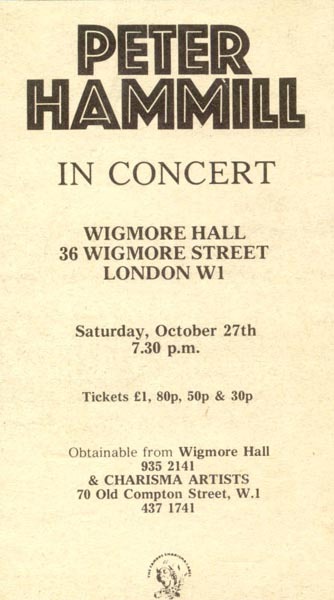 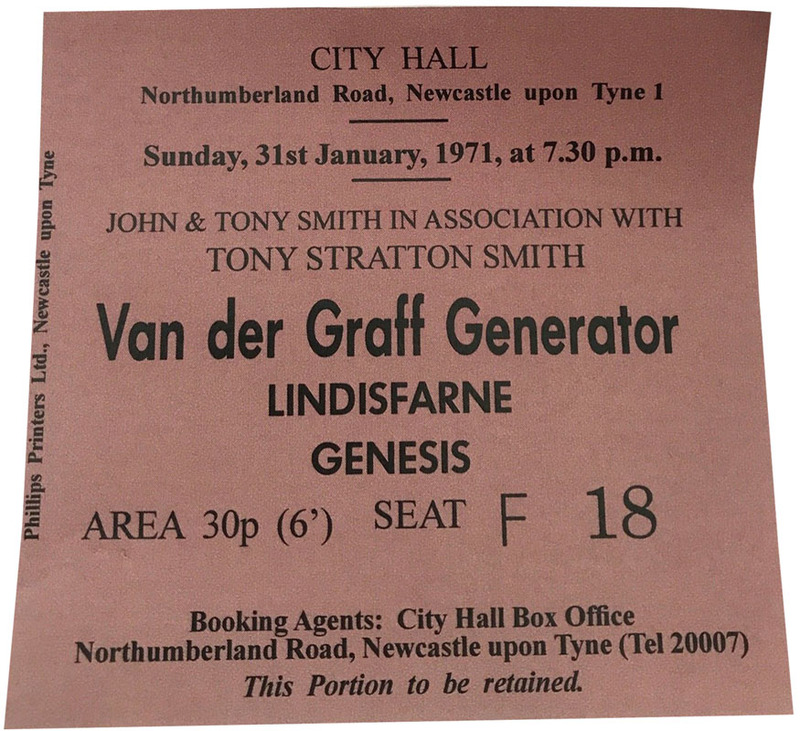 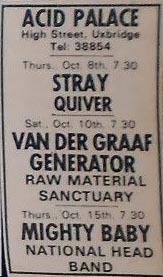 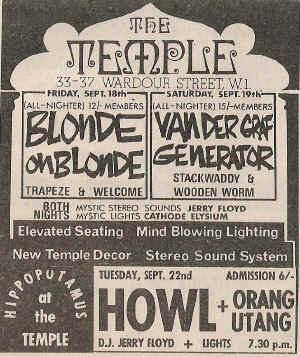 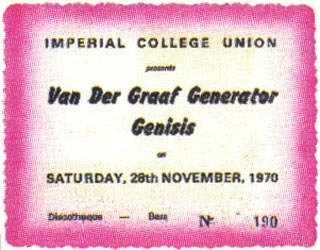 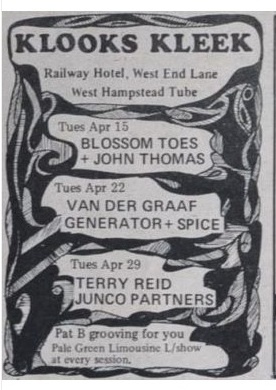 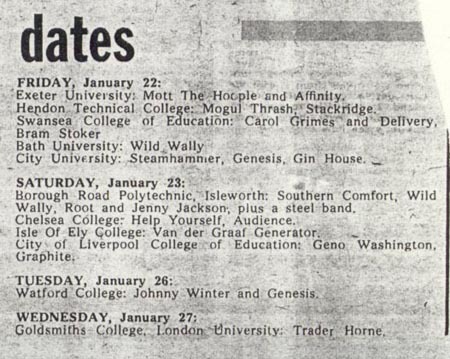 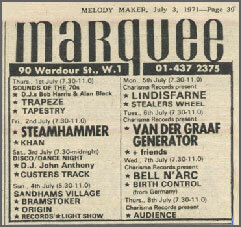 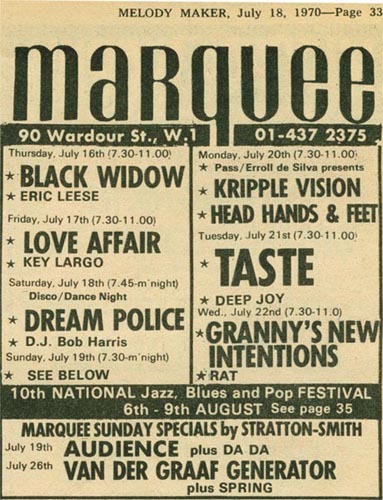 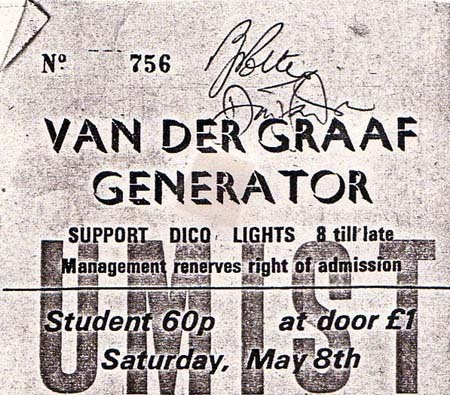 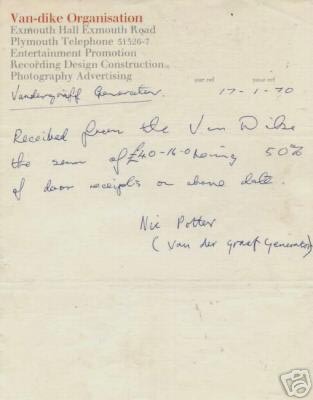 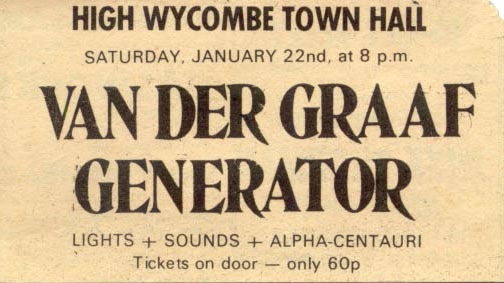 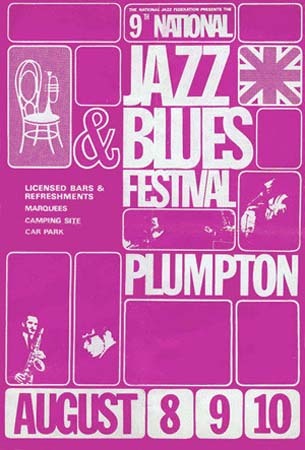 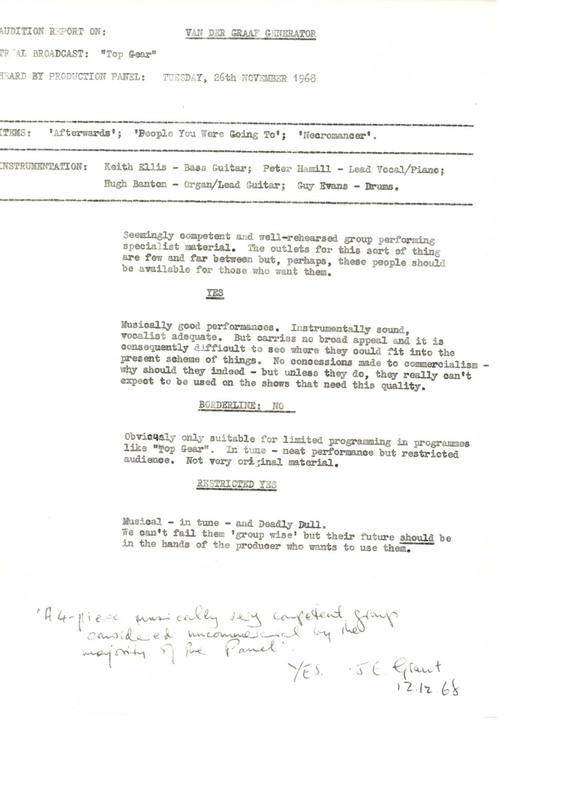 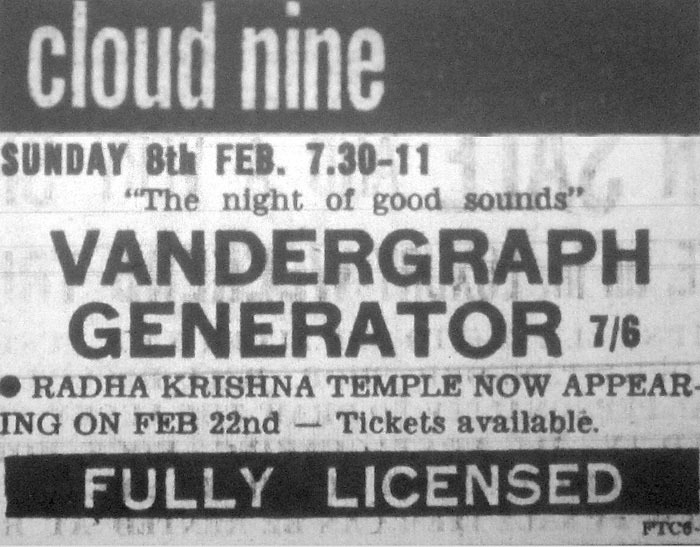 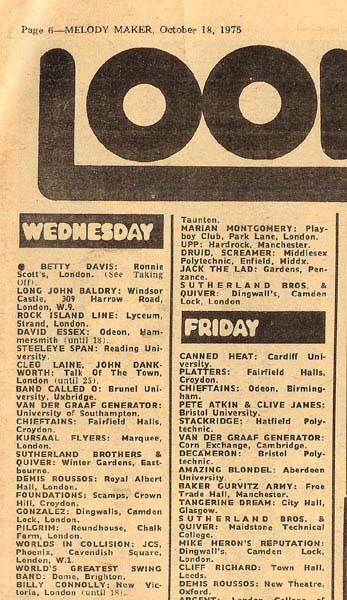 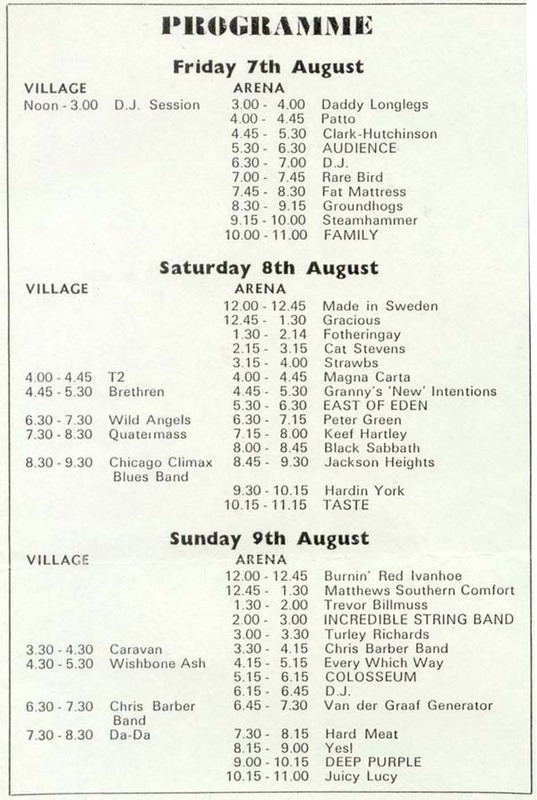 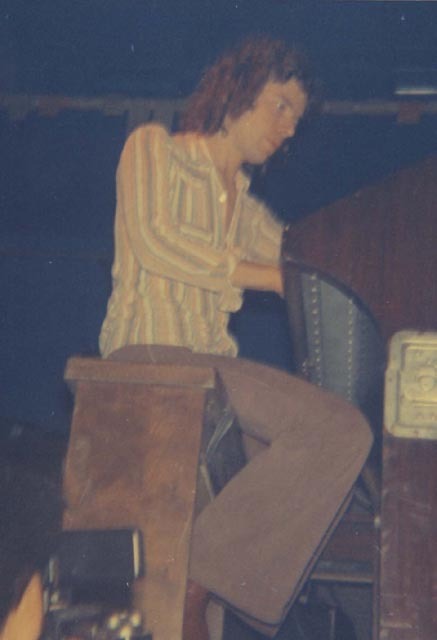 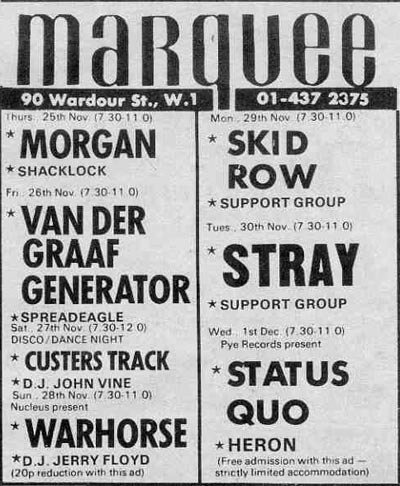 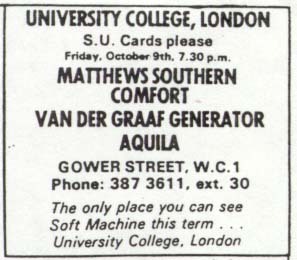 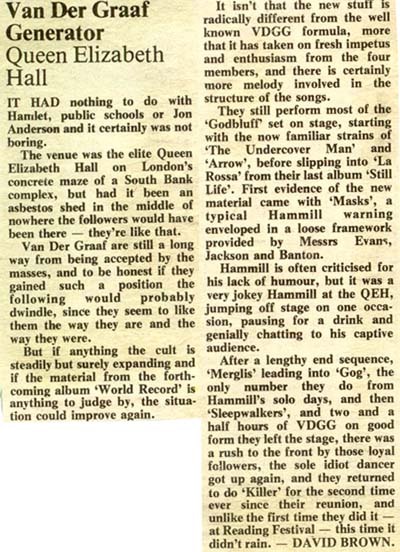 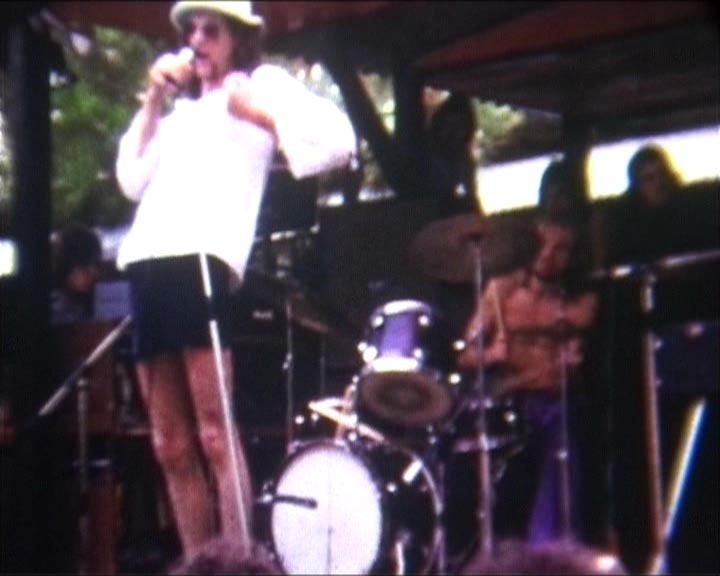 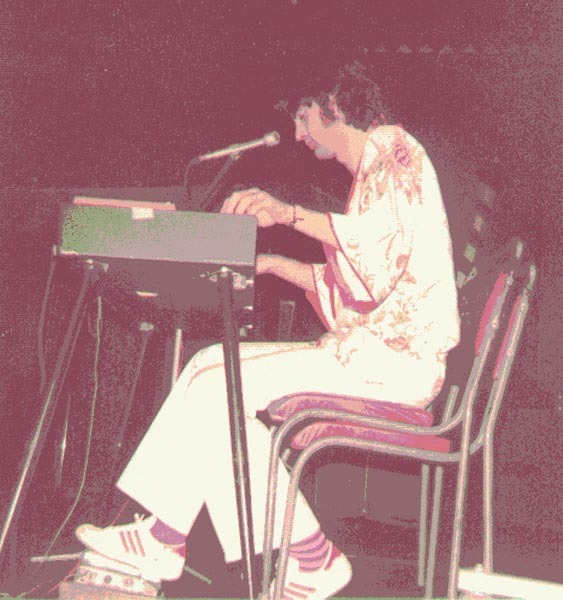 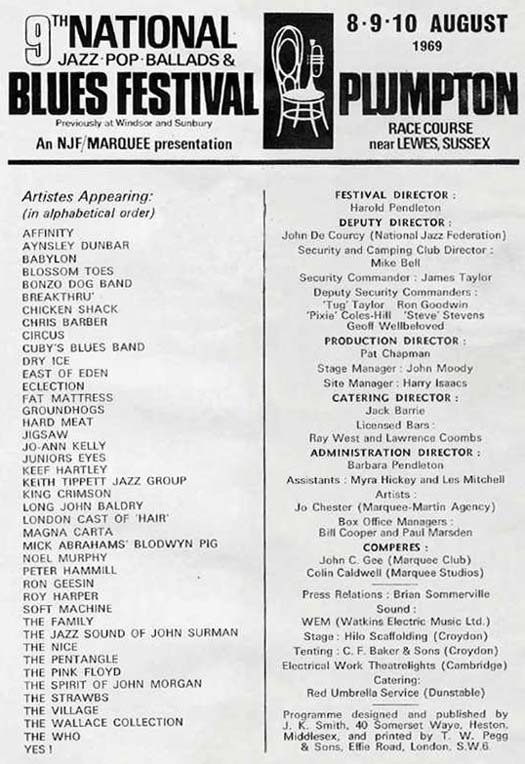 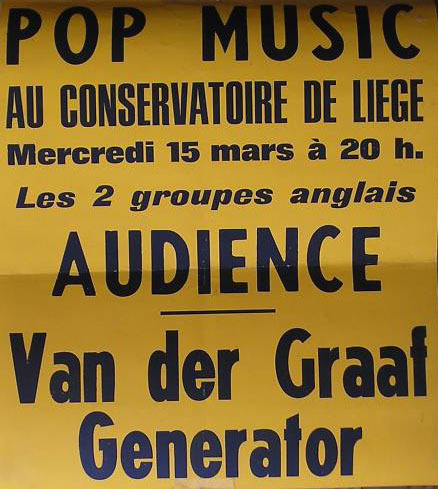 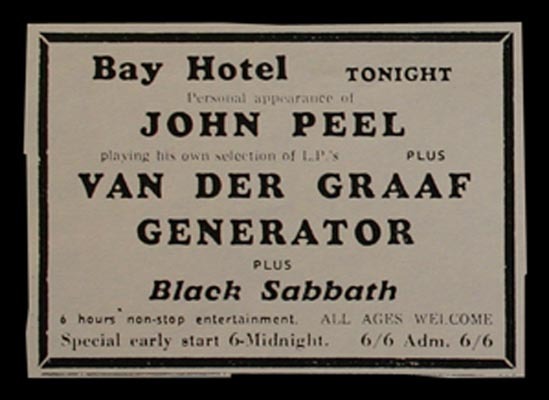 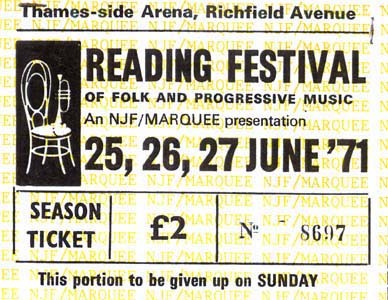 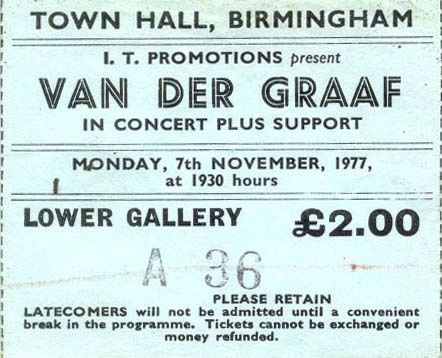 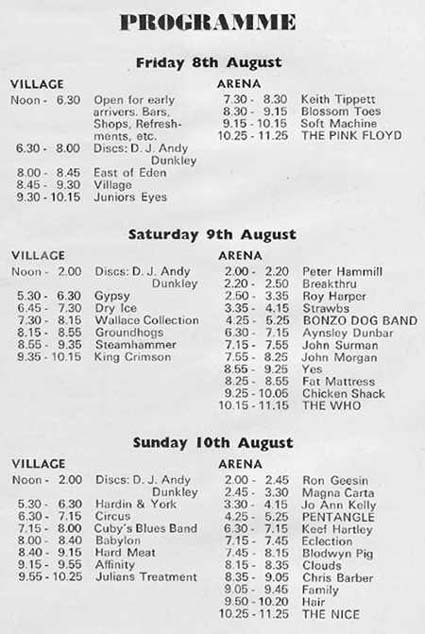 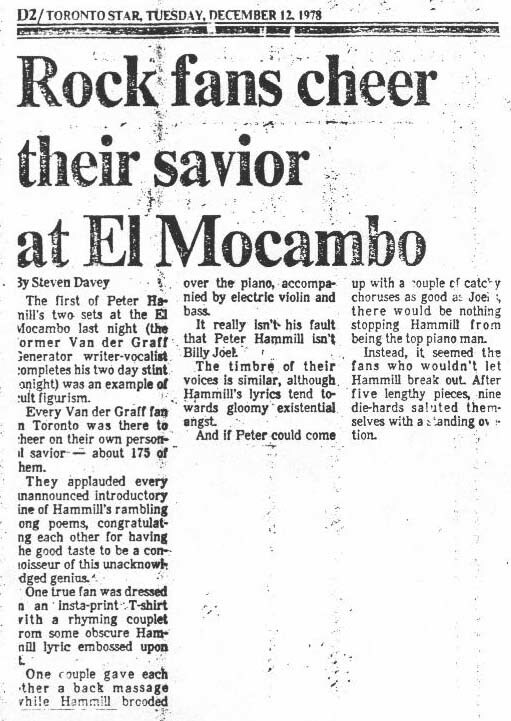 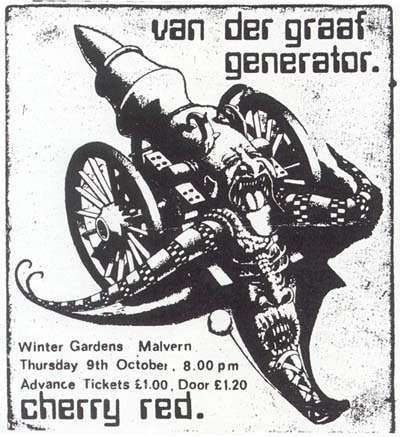 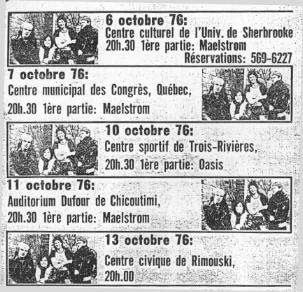 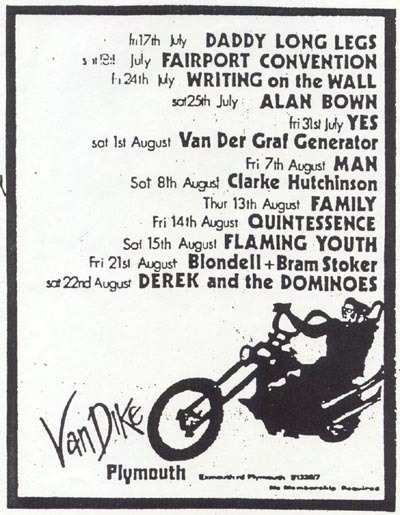 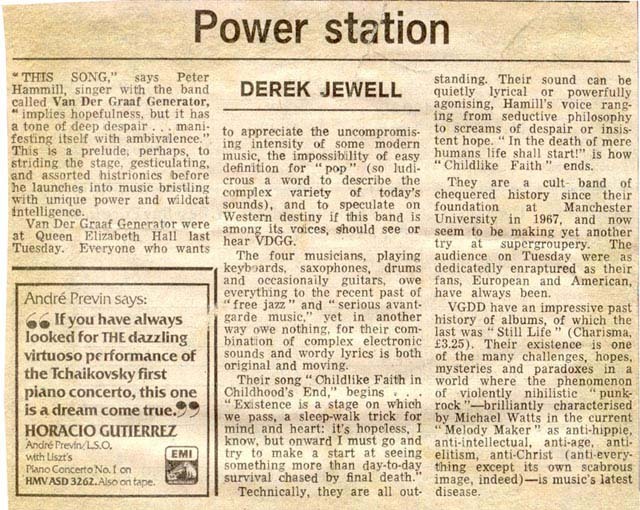 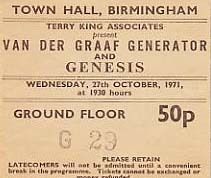 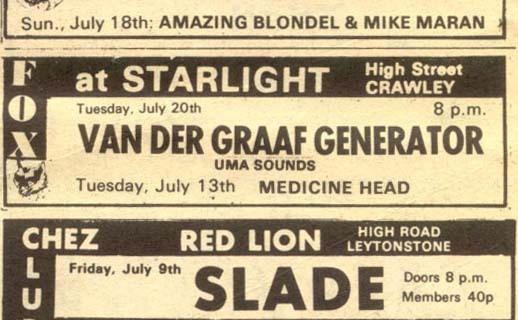 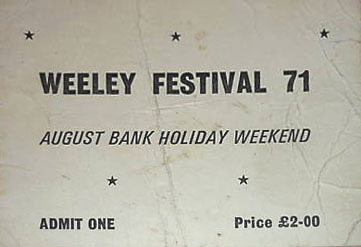 20 SEP 70 England, Blisworth, Helenors Club (Blisworth Hotel), "John Peel invites Van der Graaf Generator and Medicen light show (bar) 8/-"
22 NOV 70 England, Birmingham, Erdington, "Mothers"
04 DEC 70 England, Maidstone, College of Art (Advert) - VdGG didn't appear. 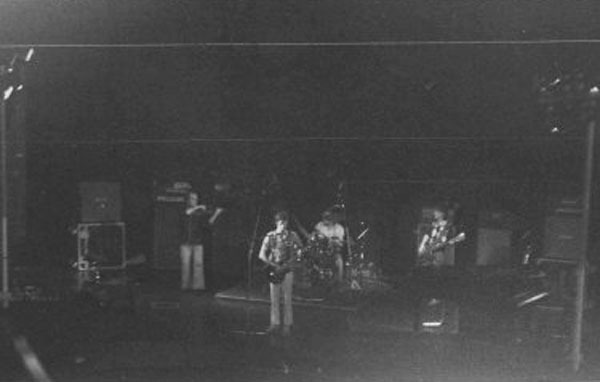 Audience stood in for them at the last minute. 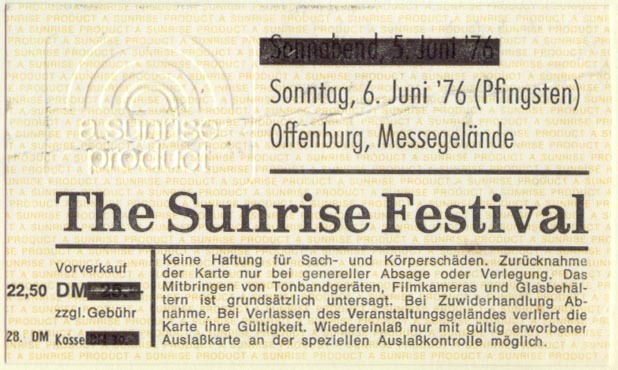 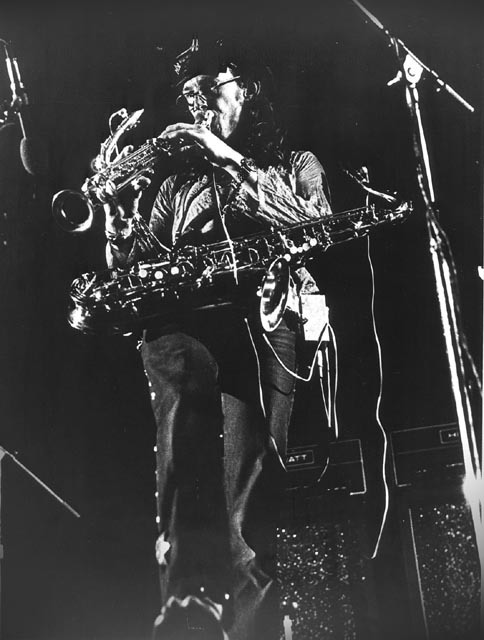 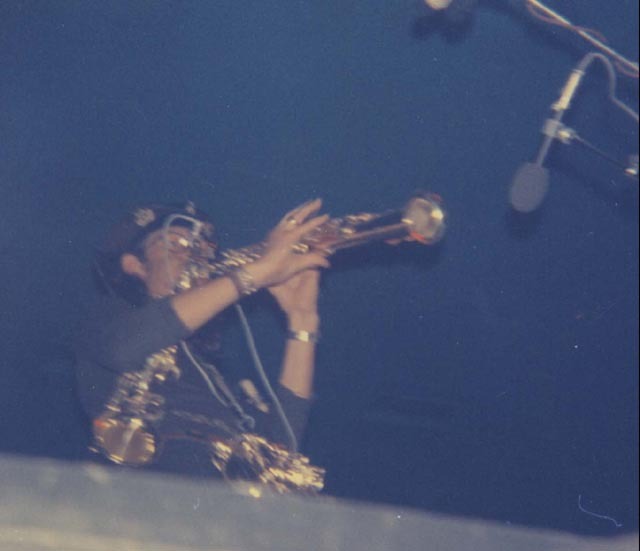 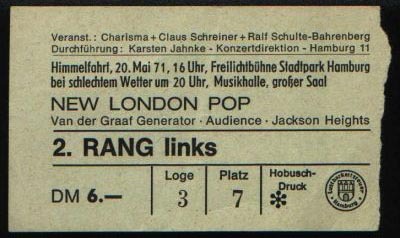 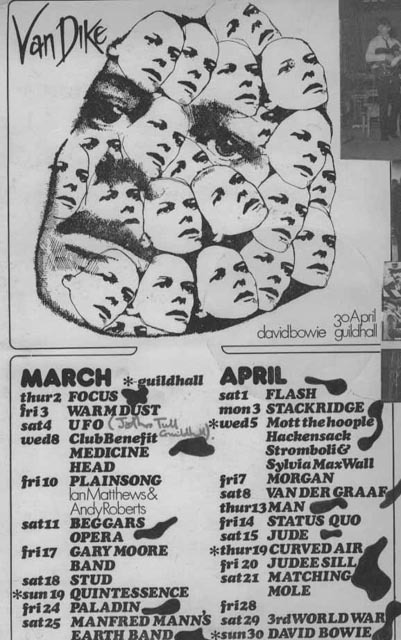 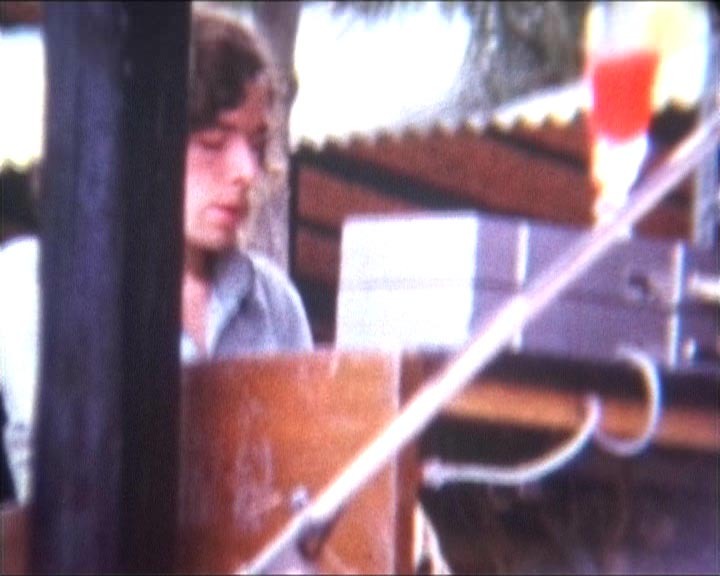 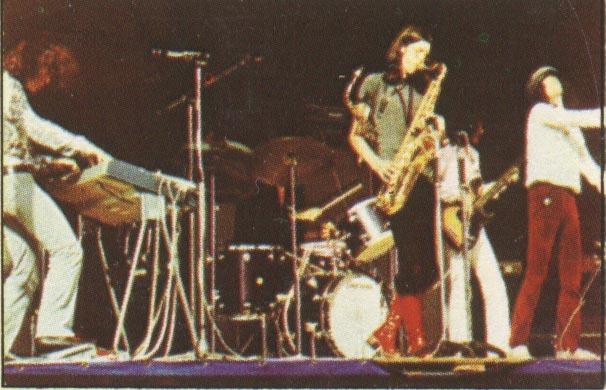 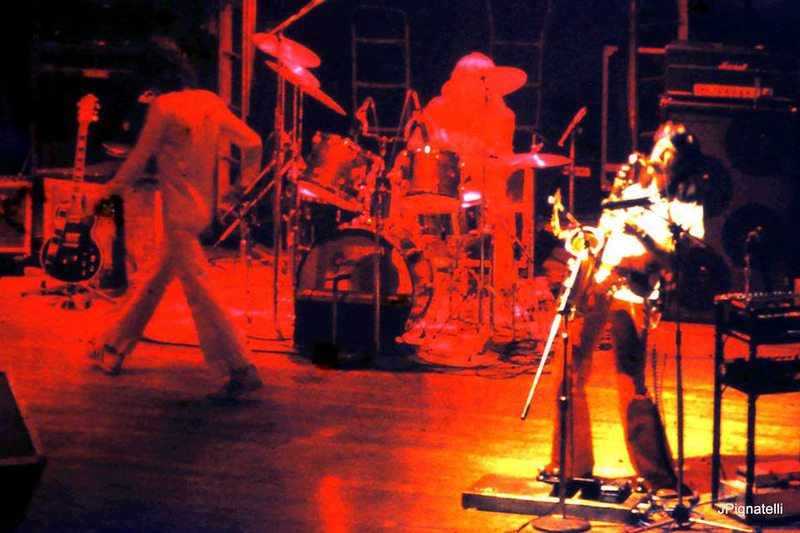 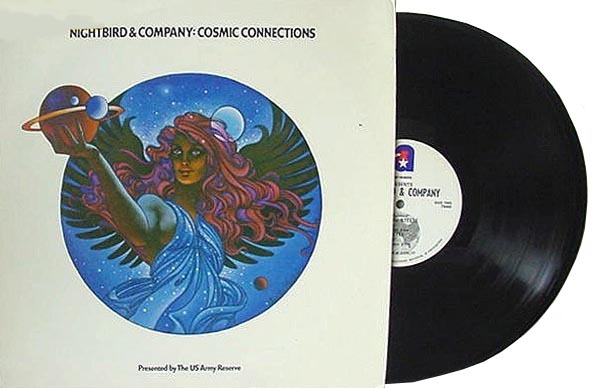 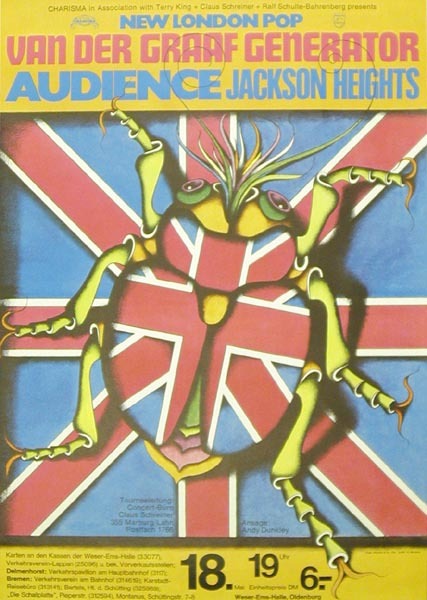 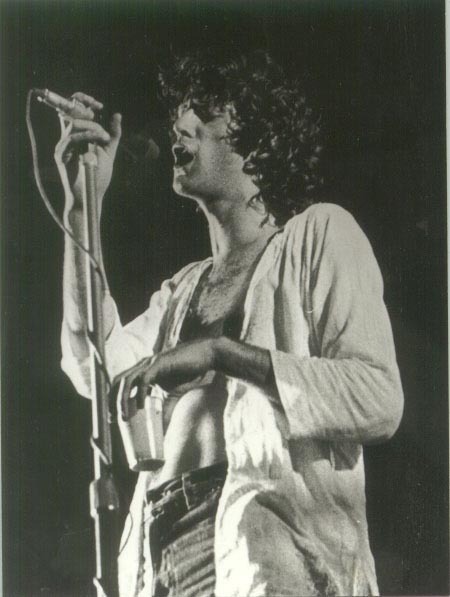 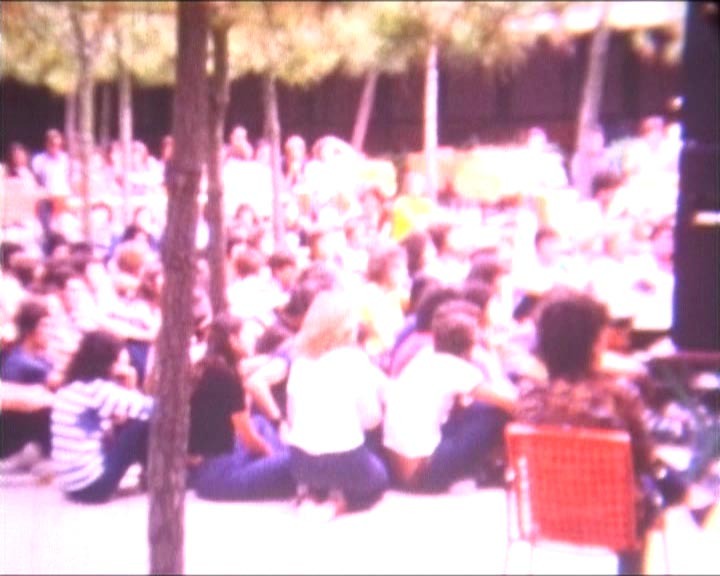 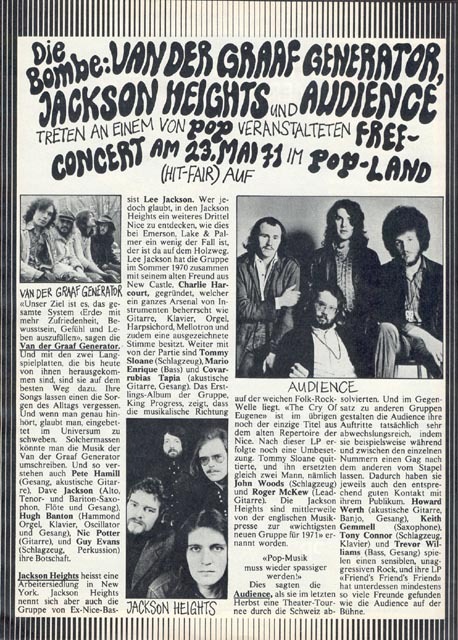 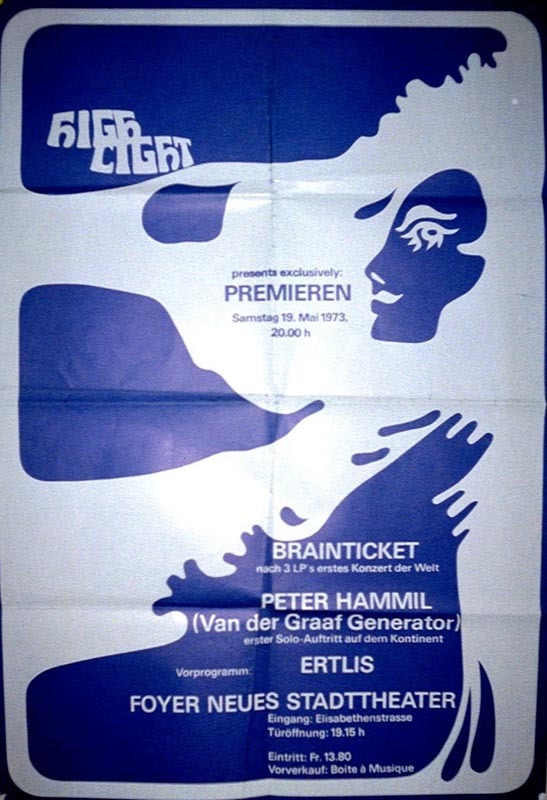 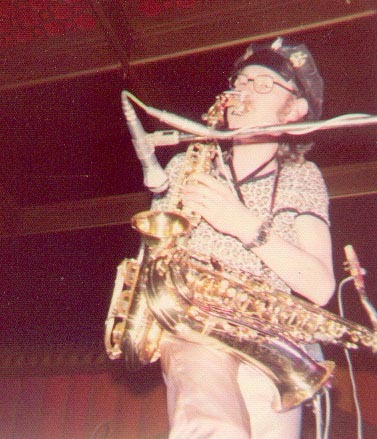 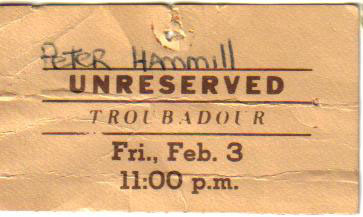 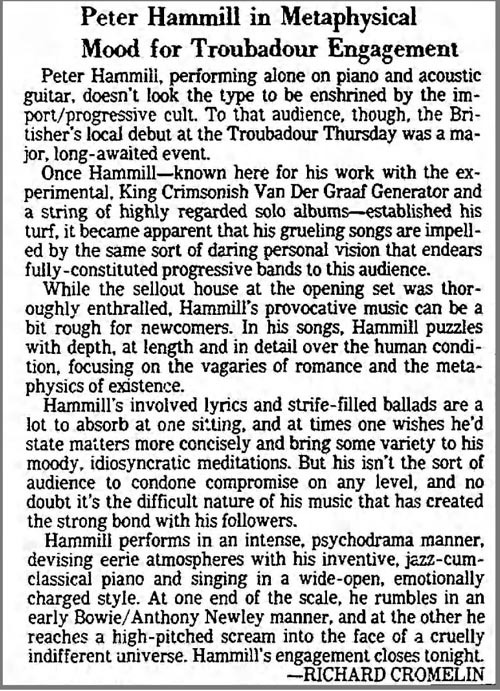 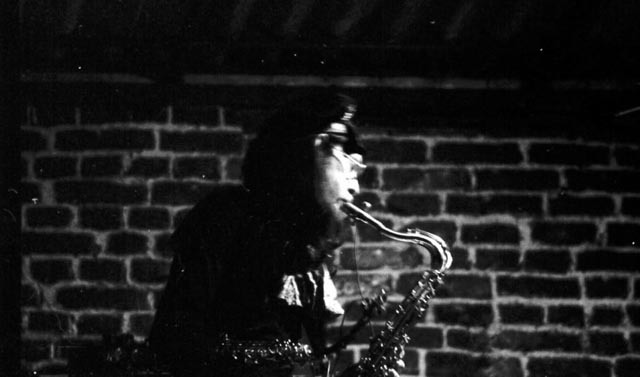 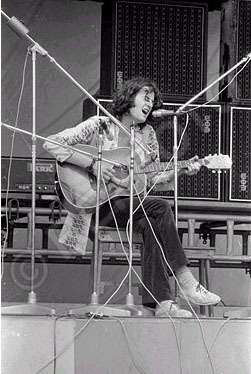 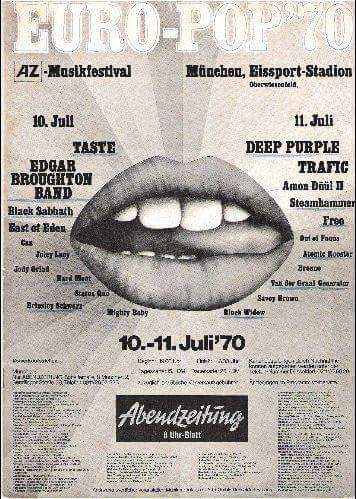 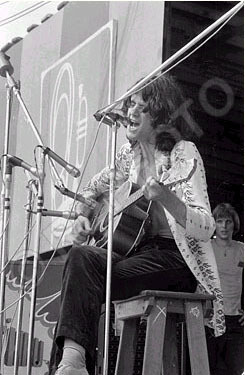 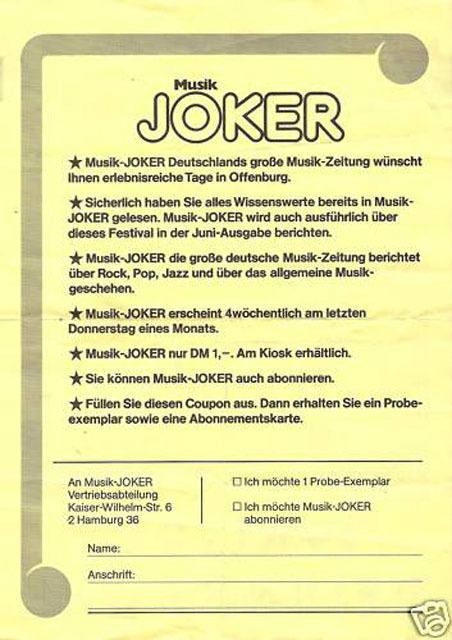 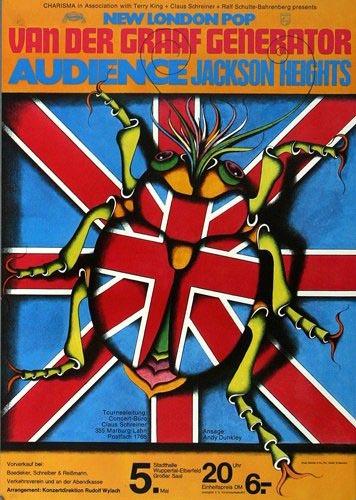 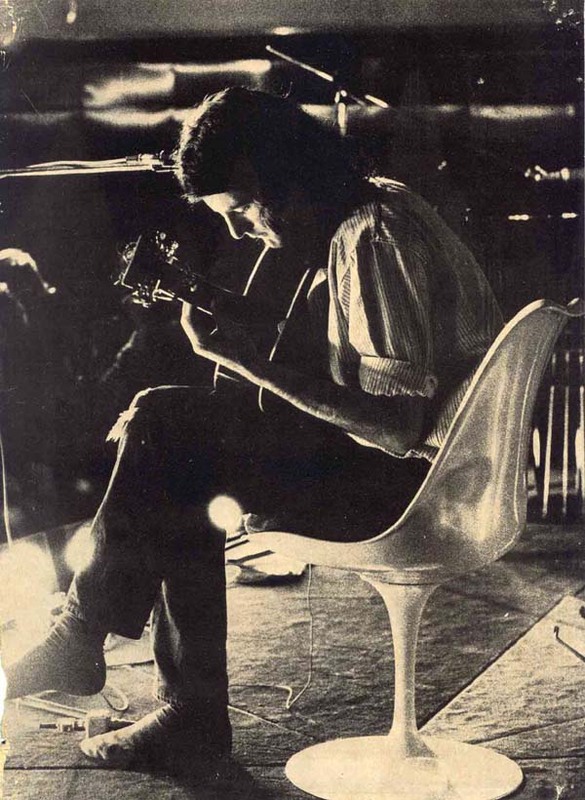 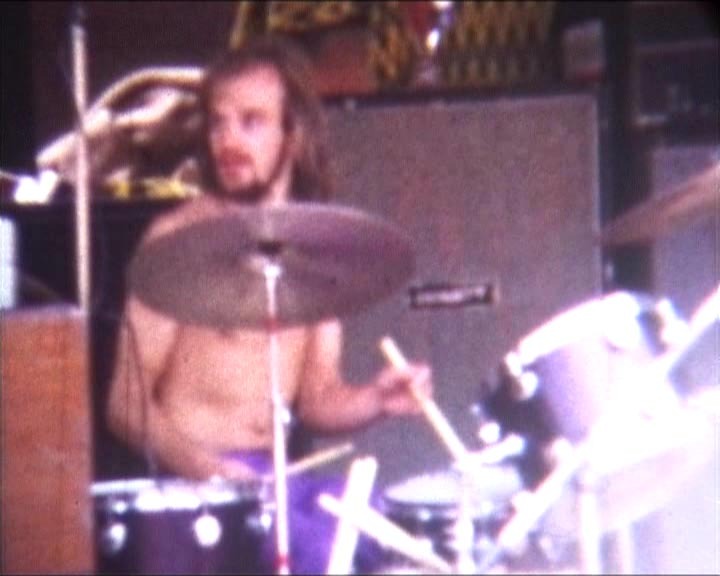 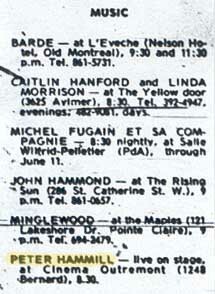 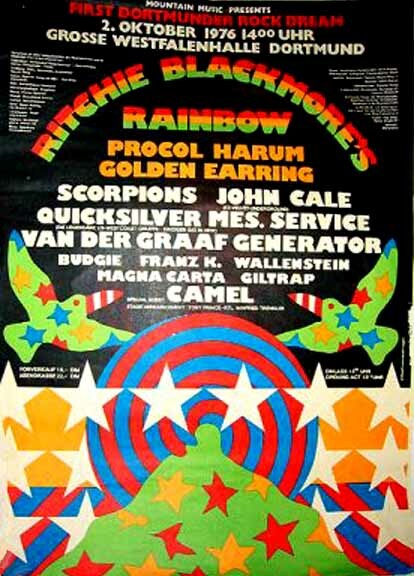 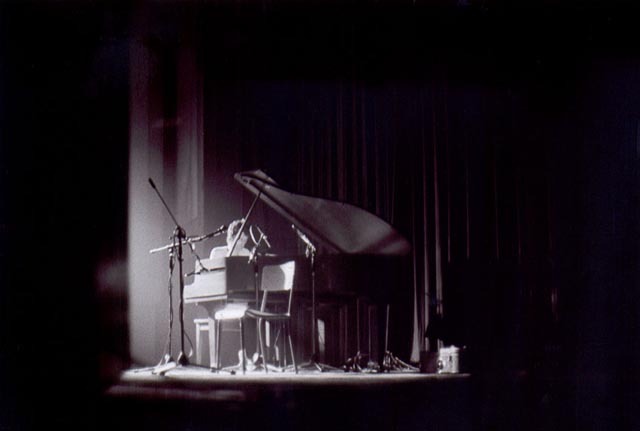 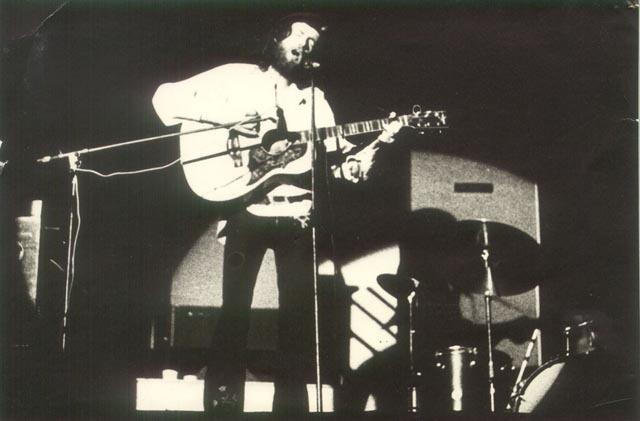 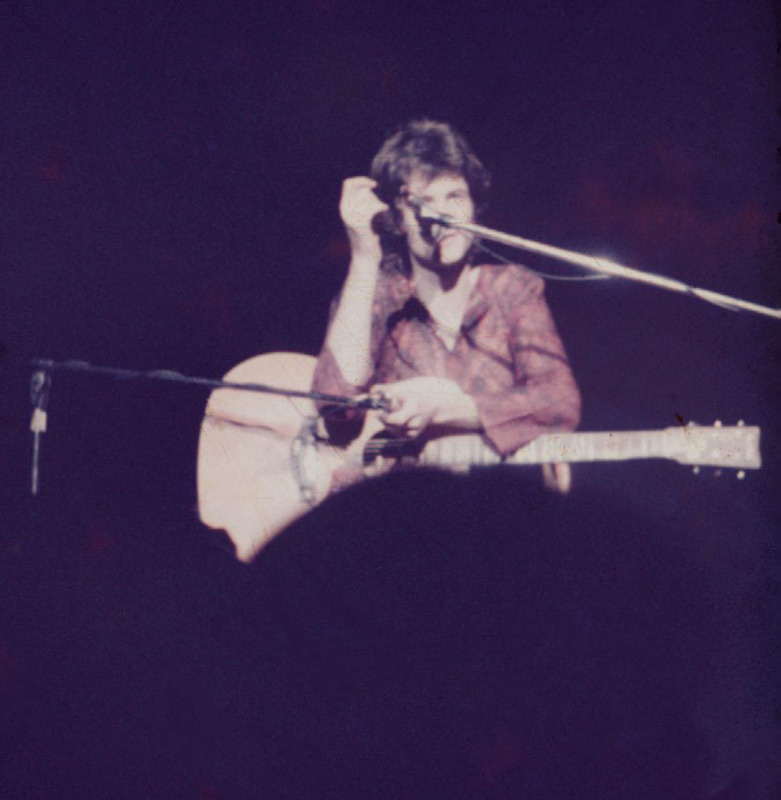 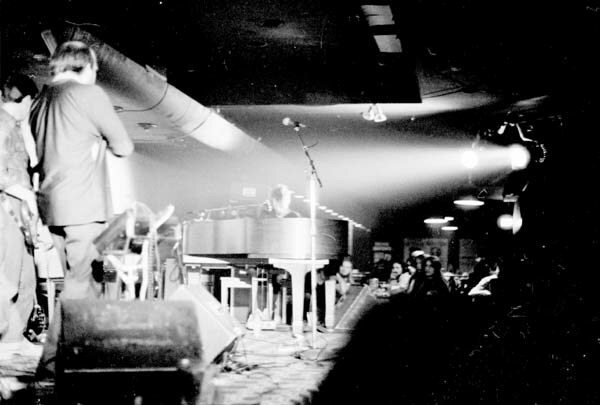 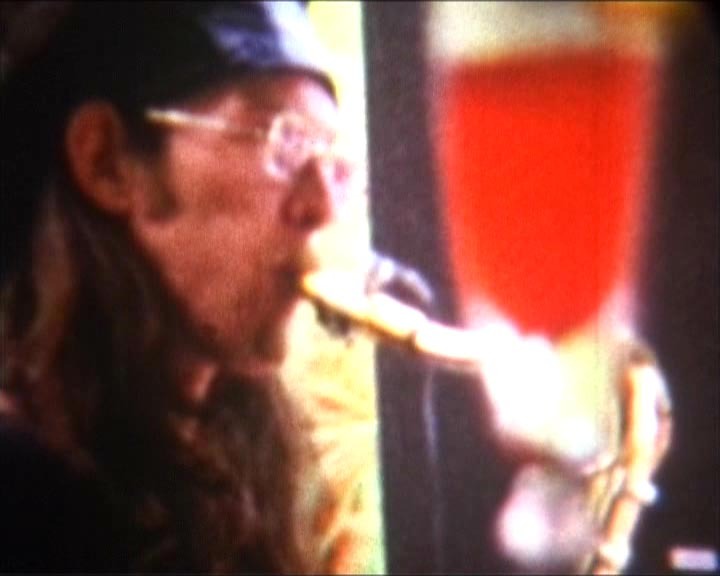 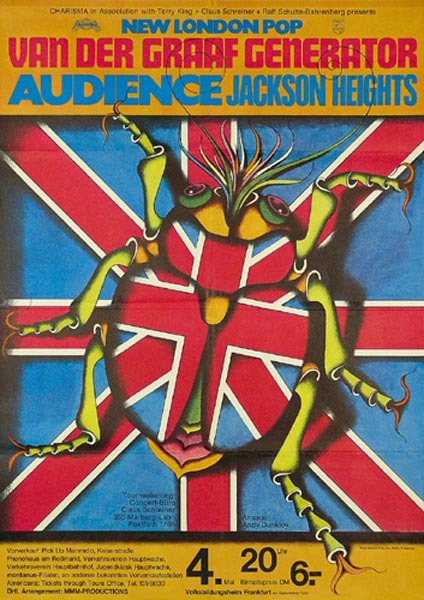 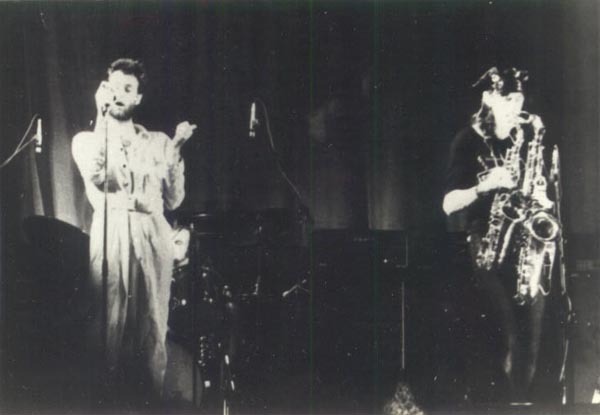 17 FEB 71 England, Harlow, The High, "Aquarius"
08 MAY 71 Germany, Ulm, Halle 2 d. Aust. 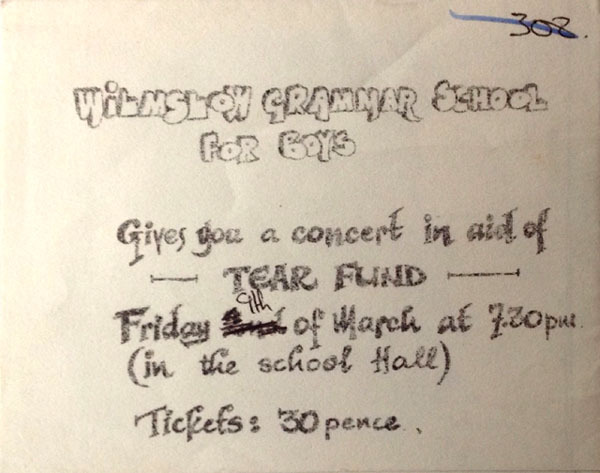 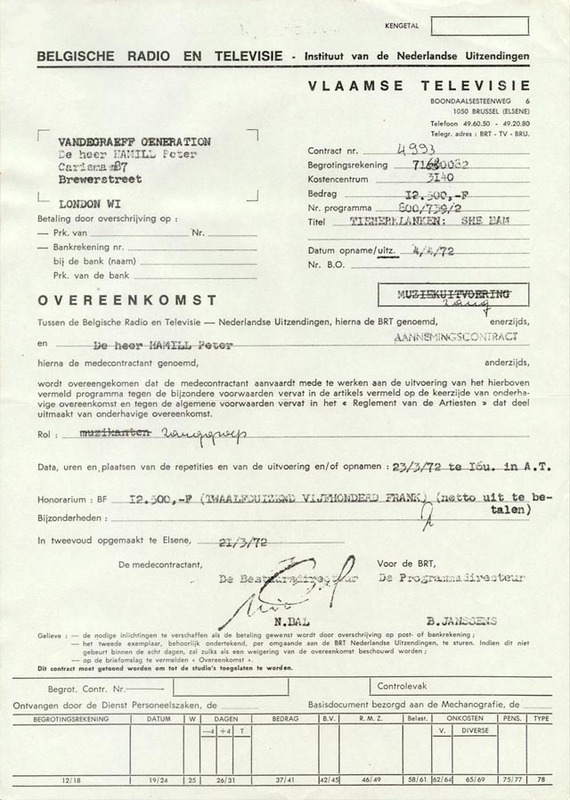 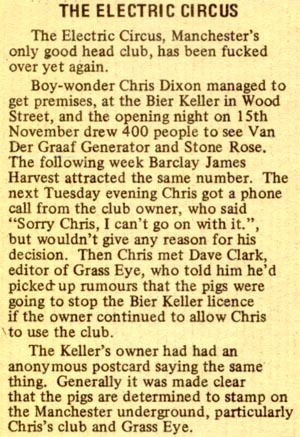 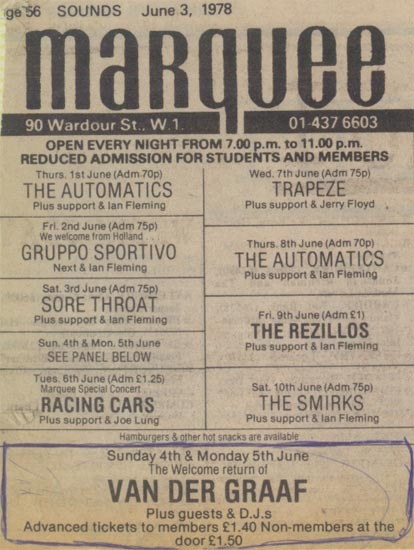 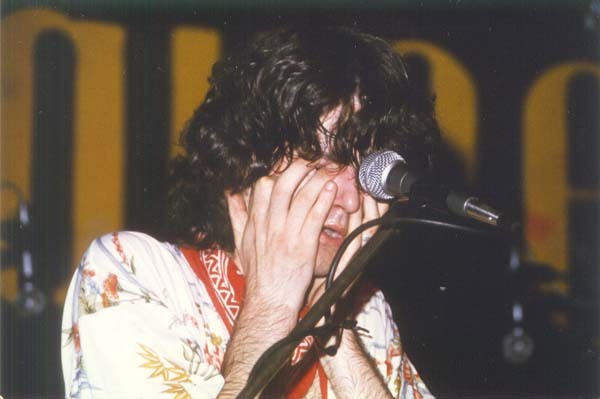 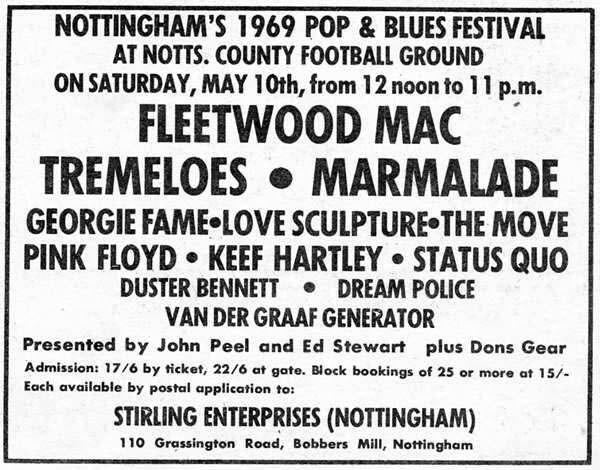 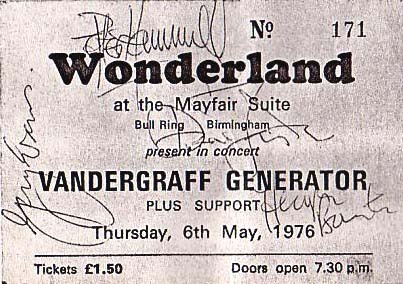 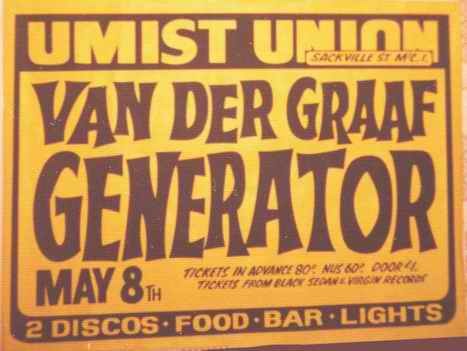 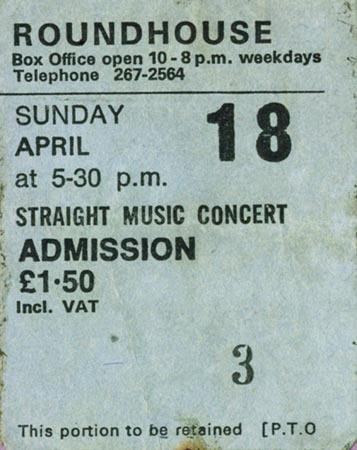 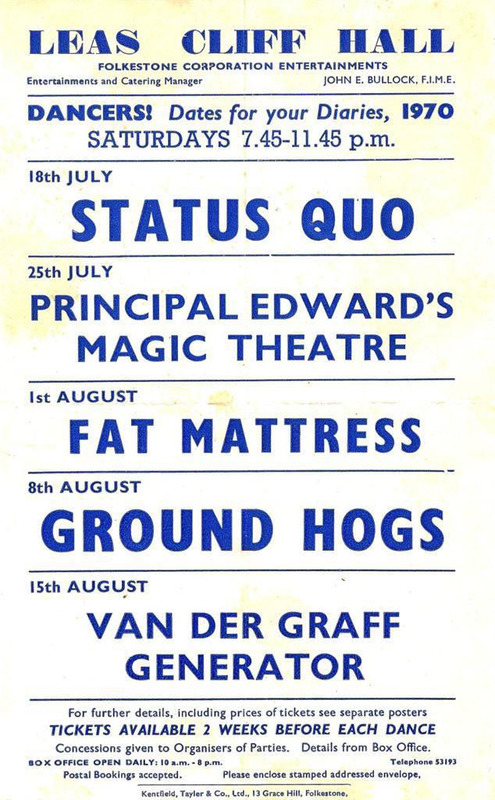 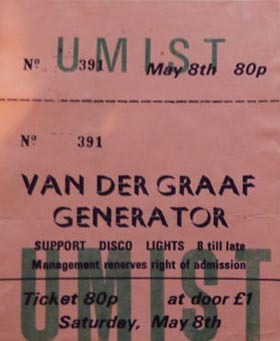 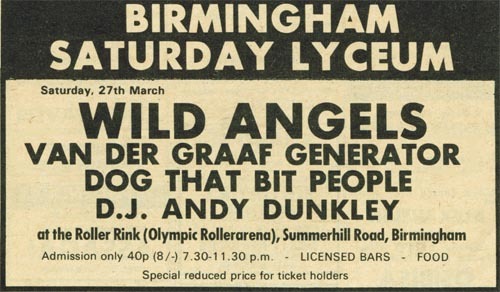 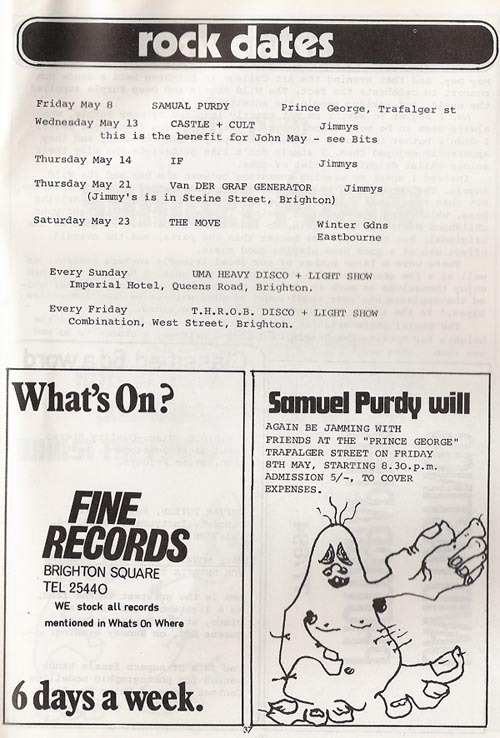 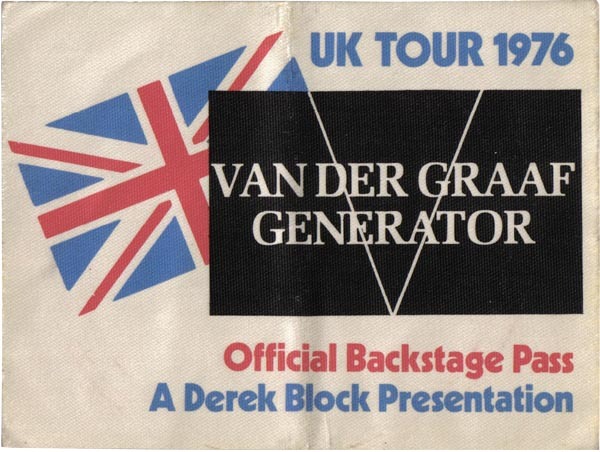 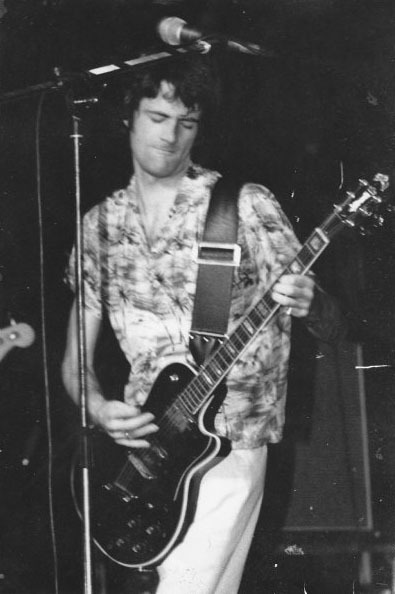 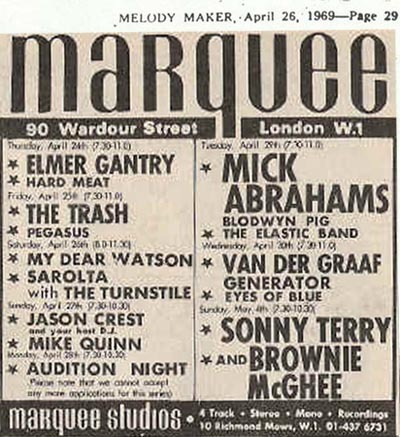 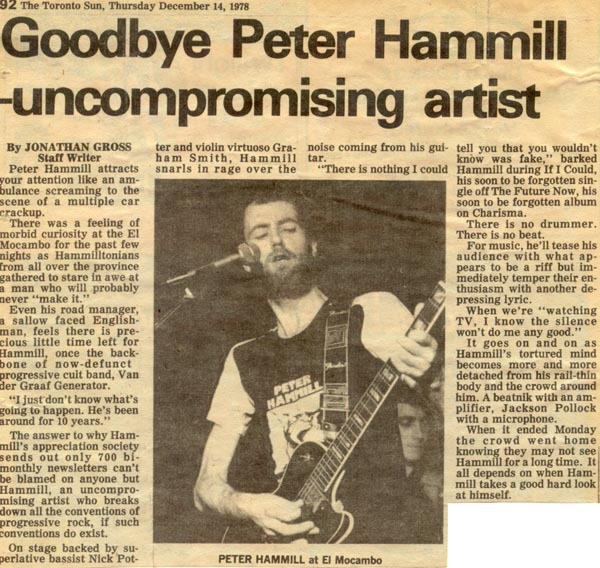 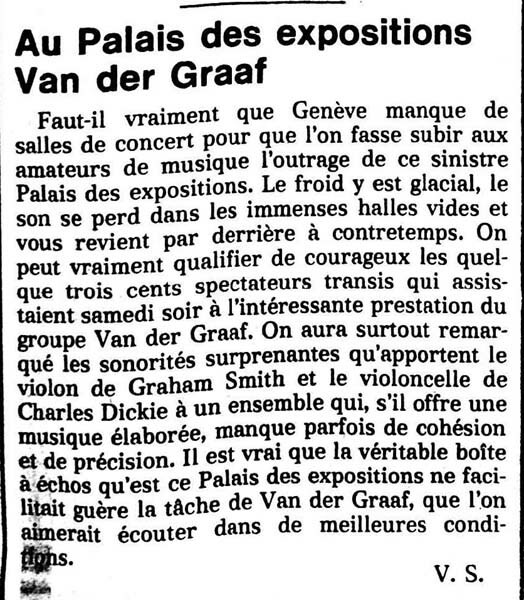 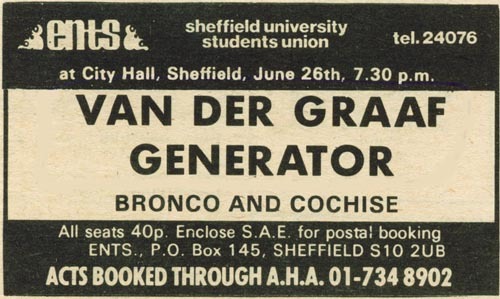 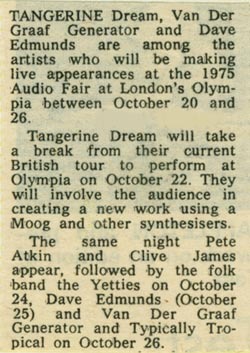 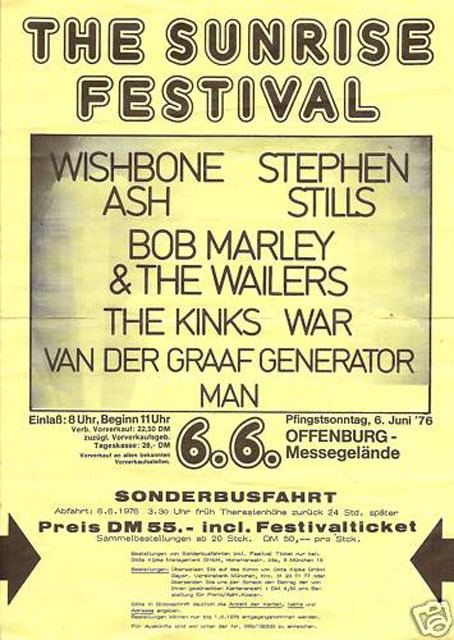 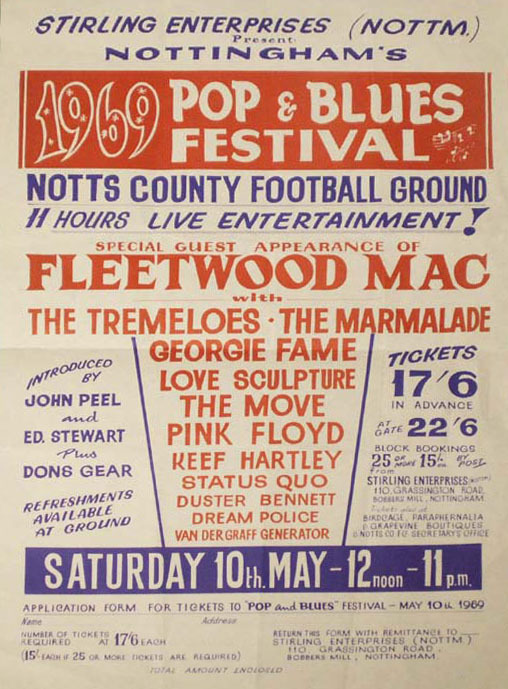 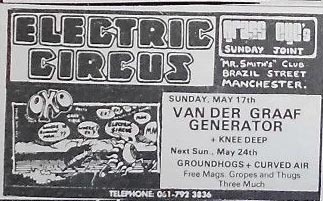 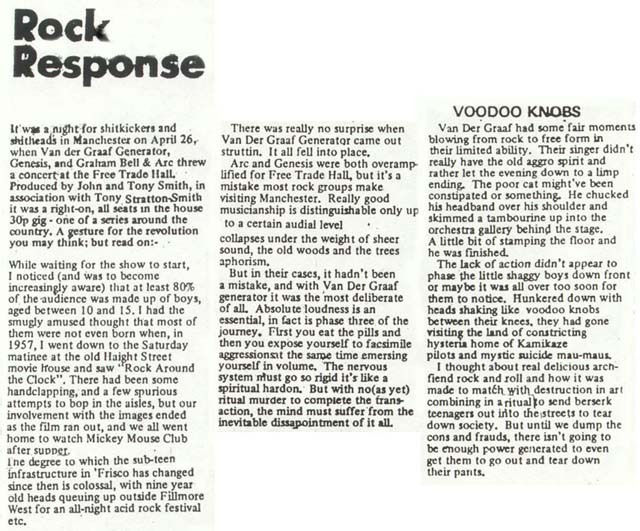 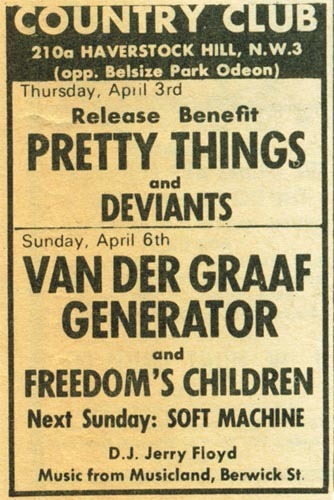 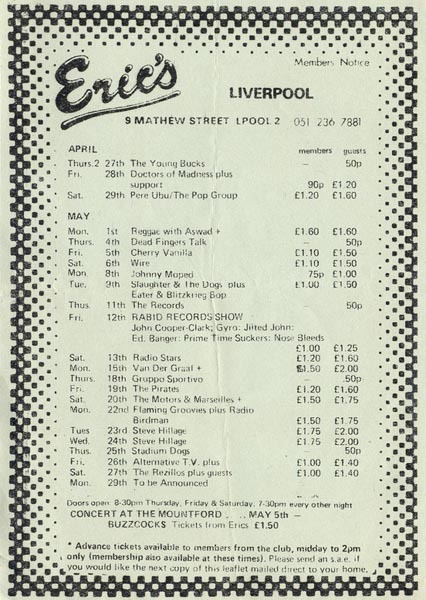 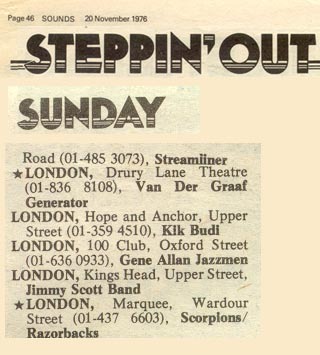 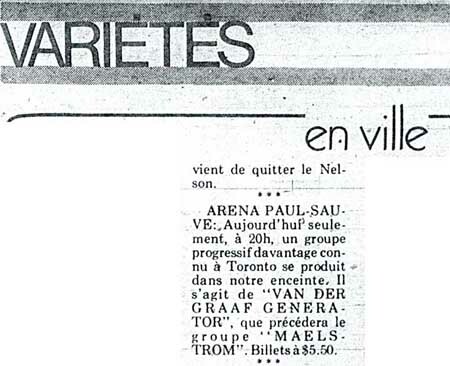 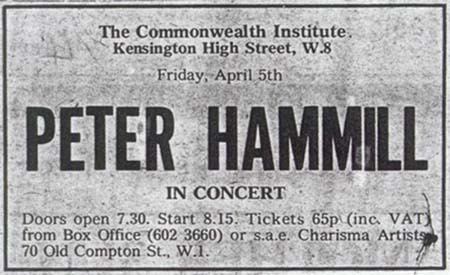 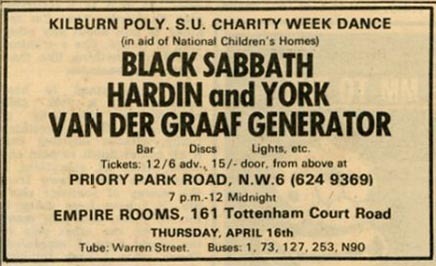 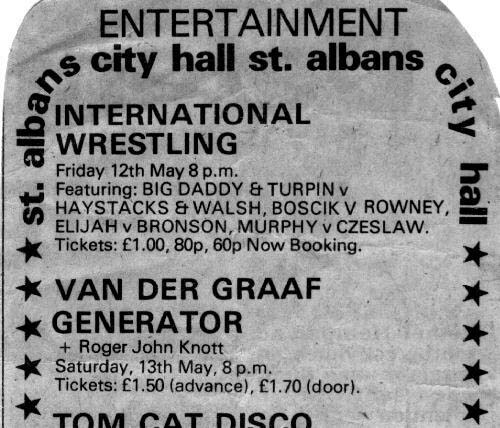 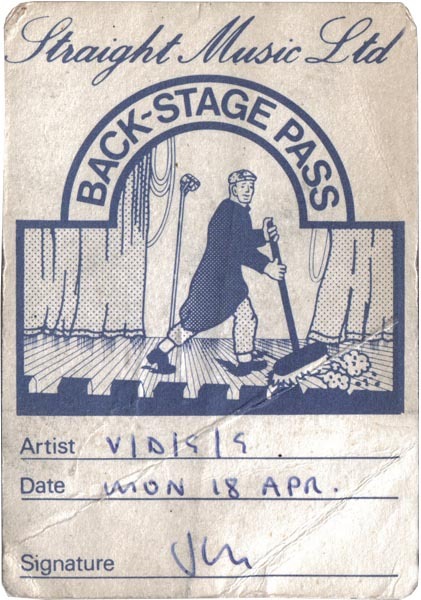 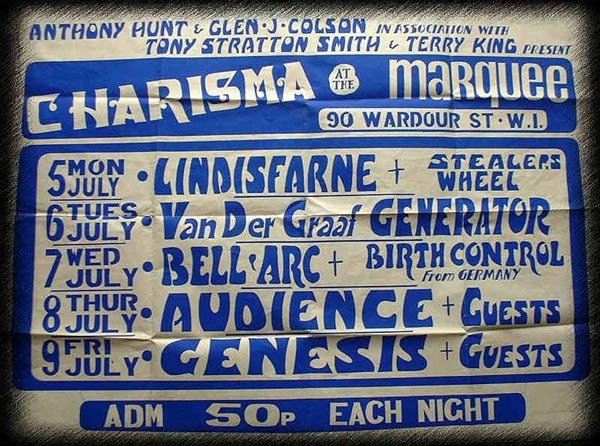 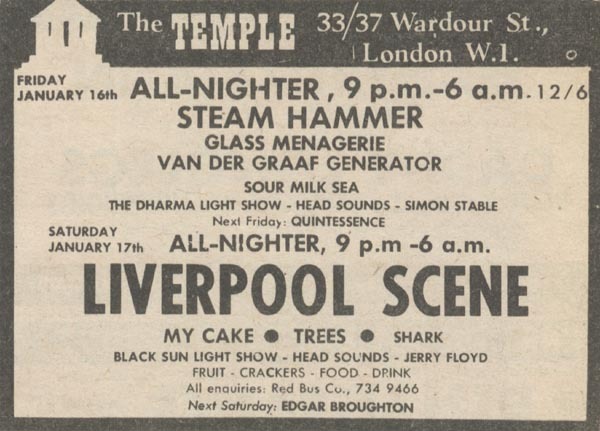 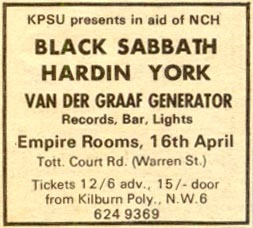 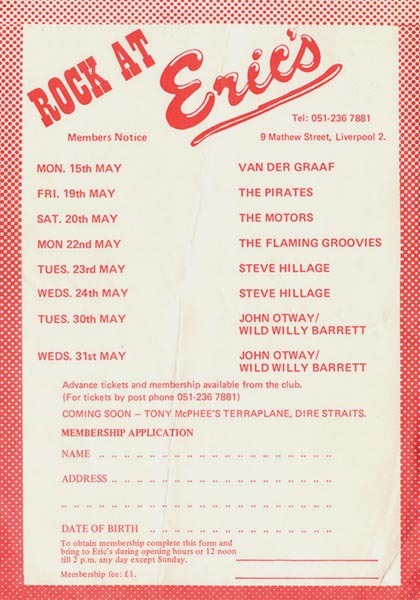 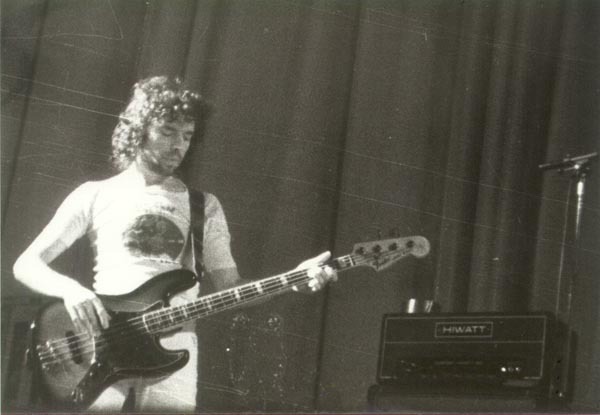 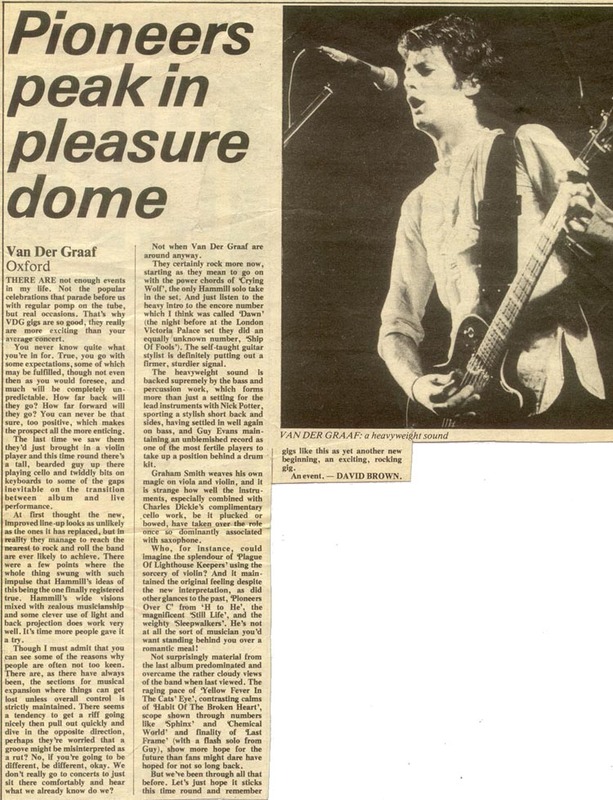 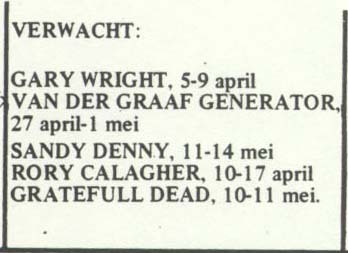 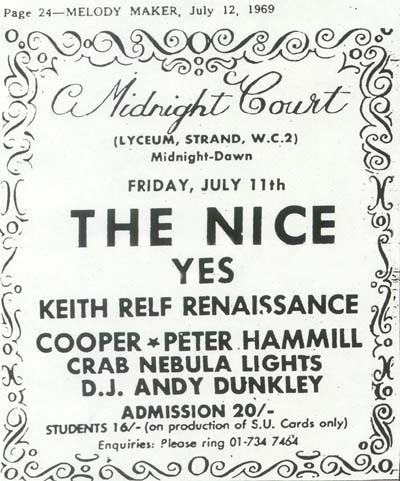 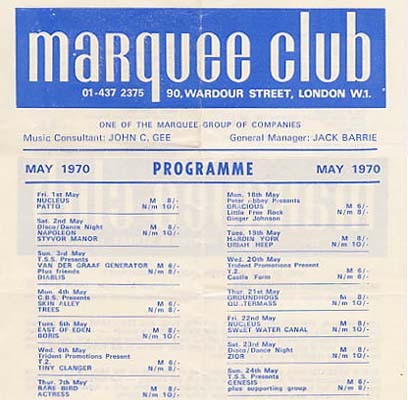 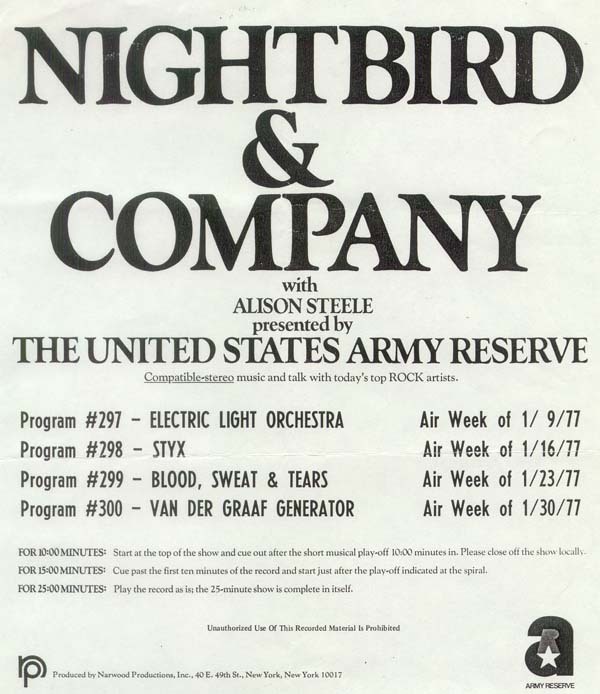 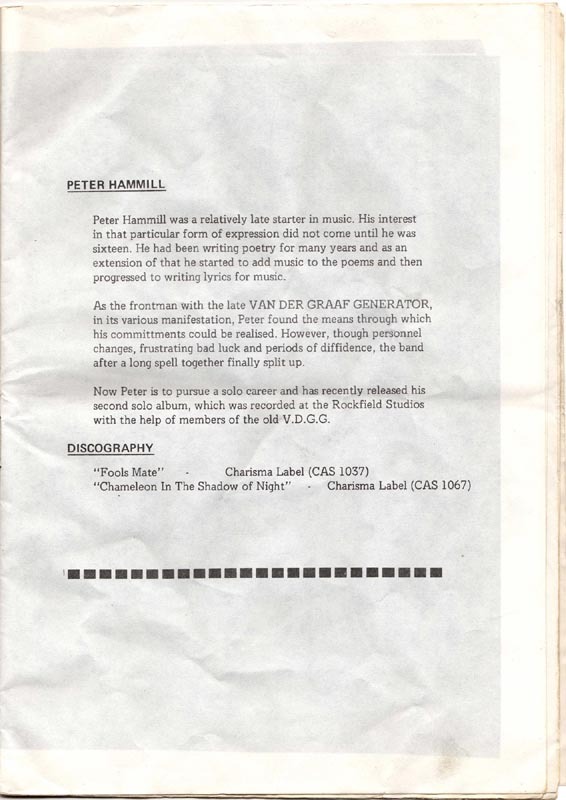 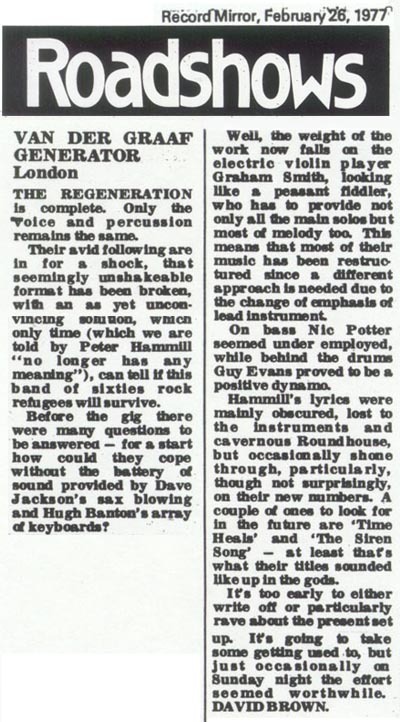 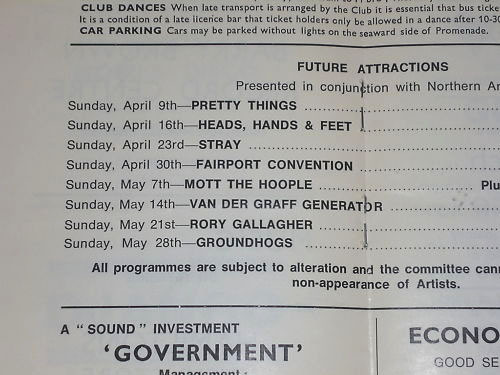 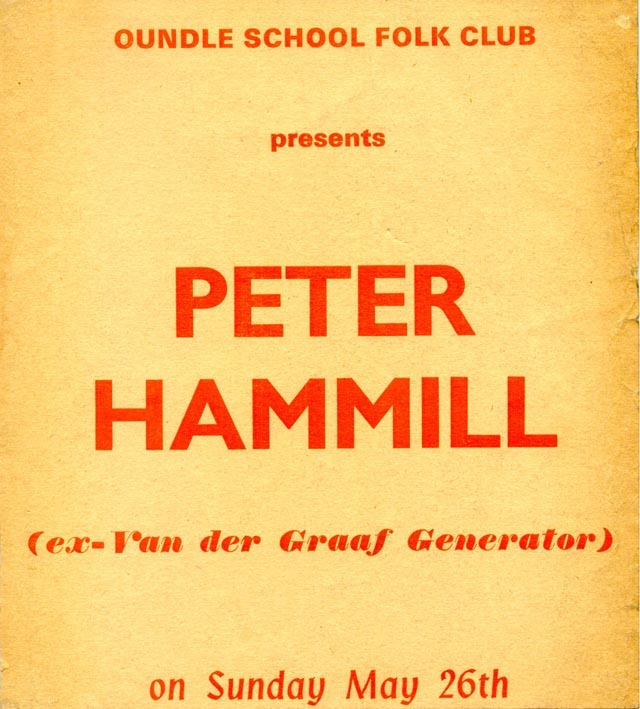 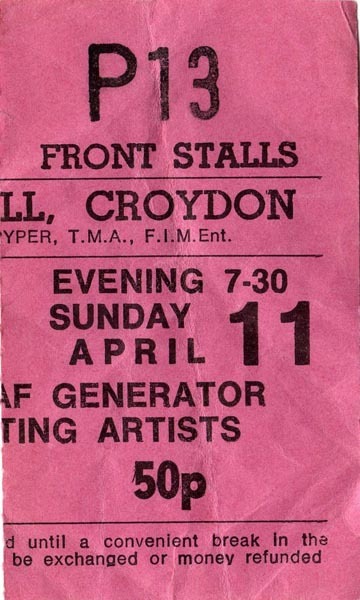 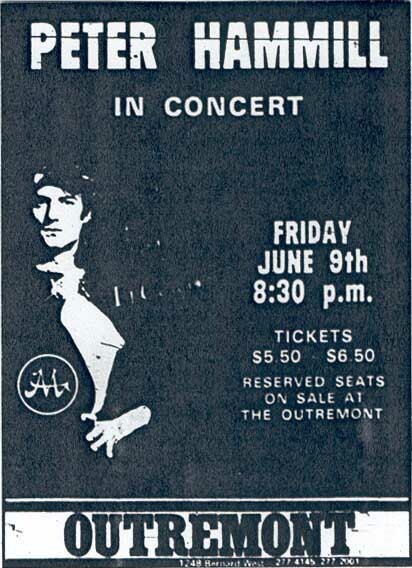 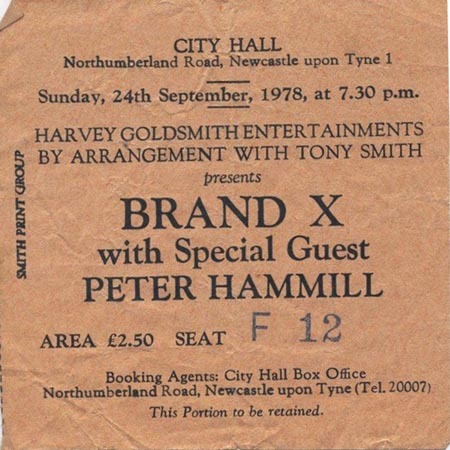 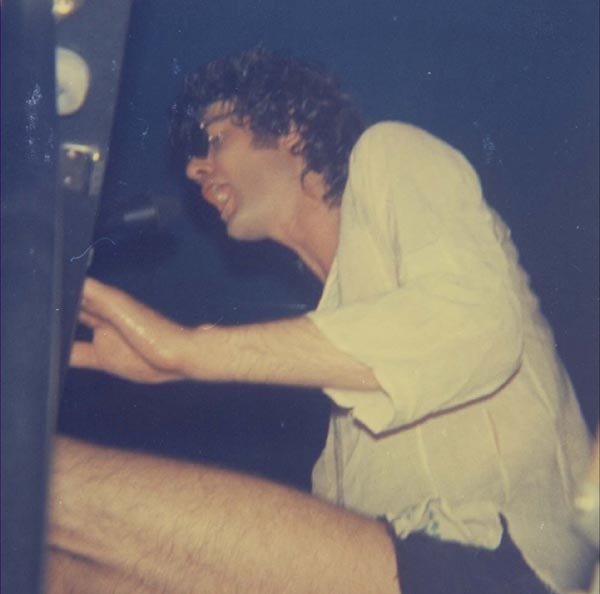 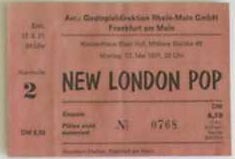 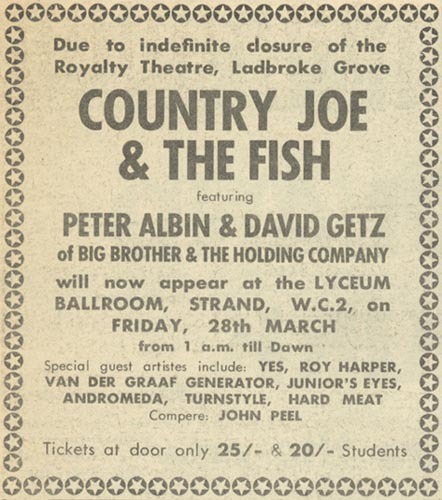 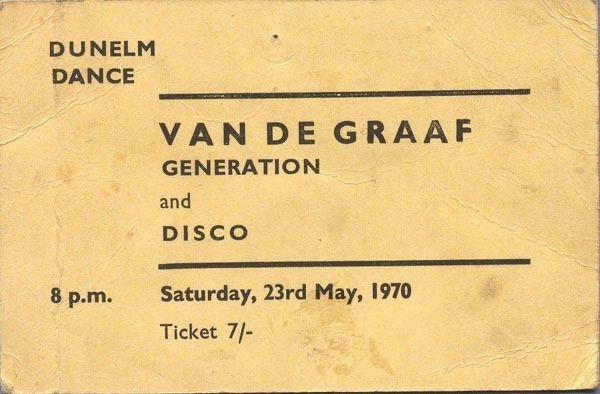 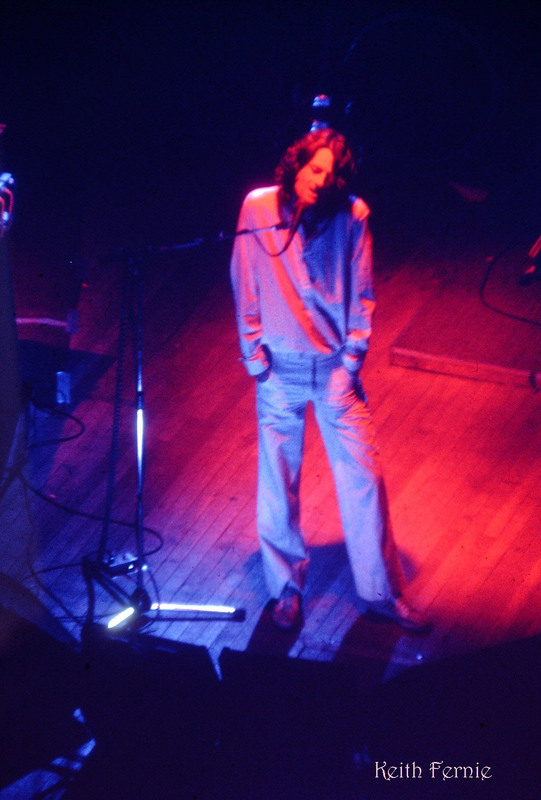 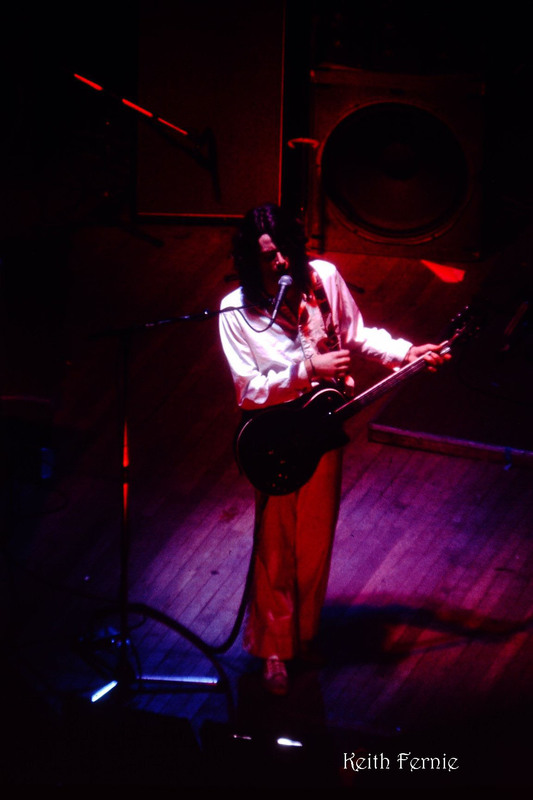 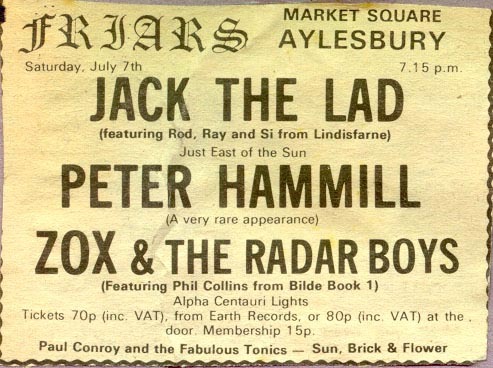 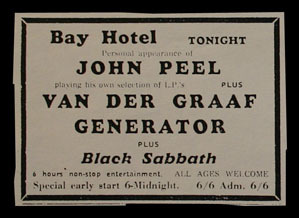 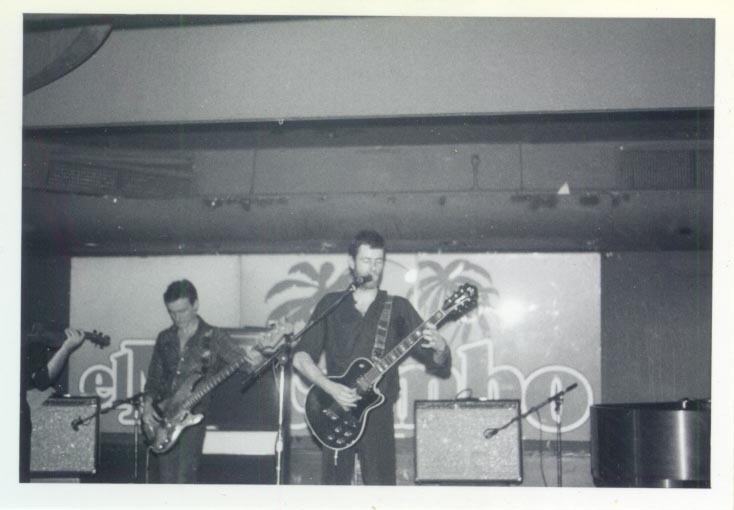 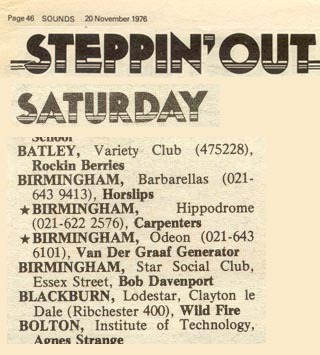 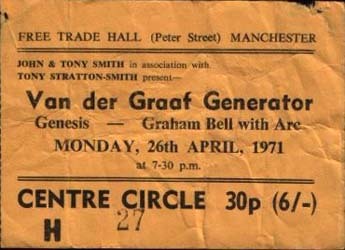 27 MAY 71 England, Preston, Amethyst Club - Cancelled because the van with gear broke down in Germany. 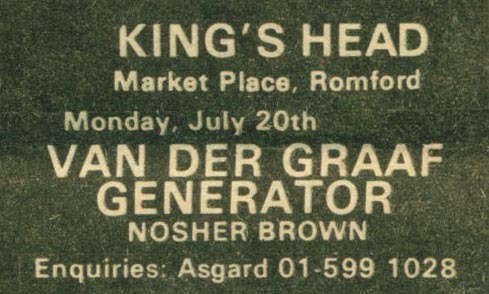 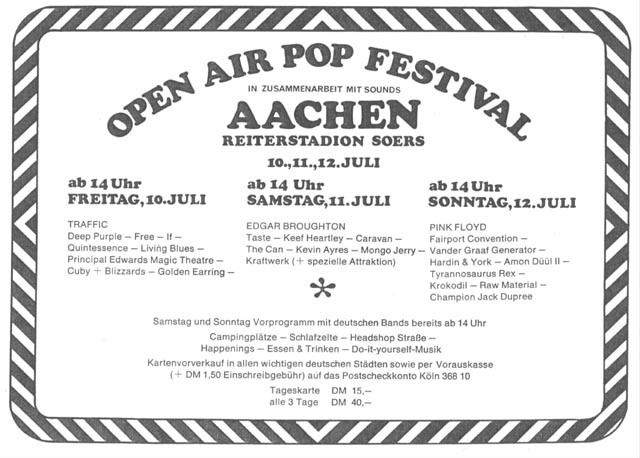 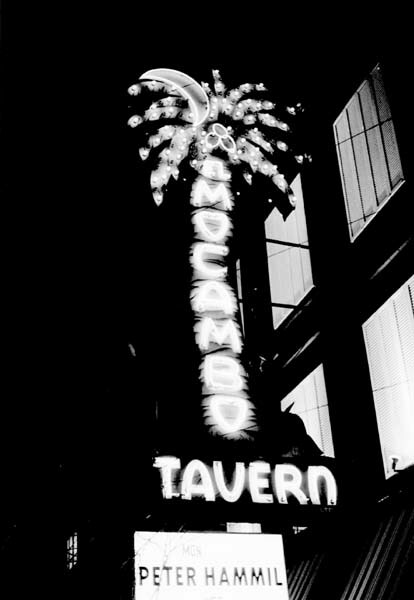 Gig re-scheduled for August 19th. 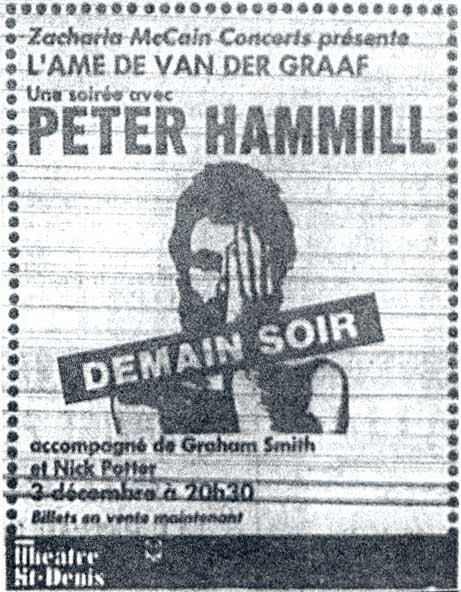 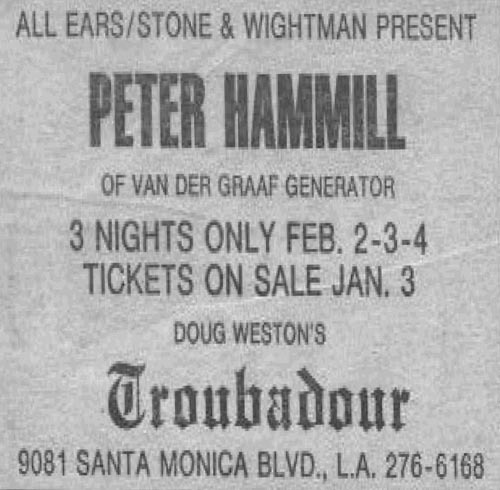 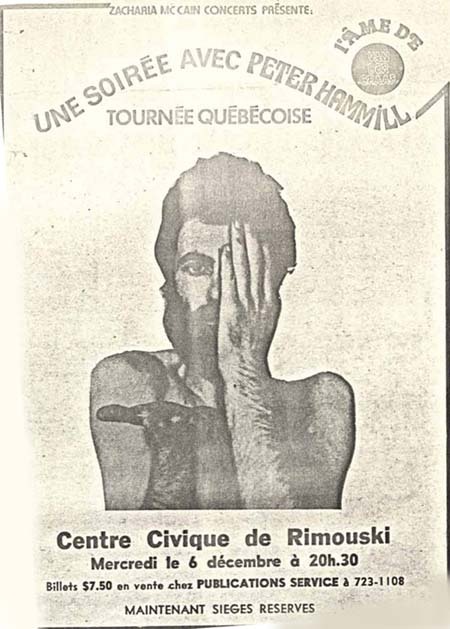 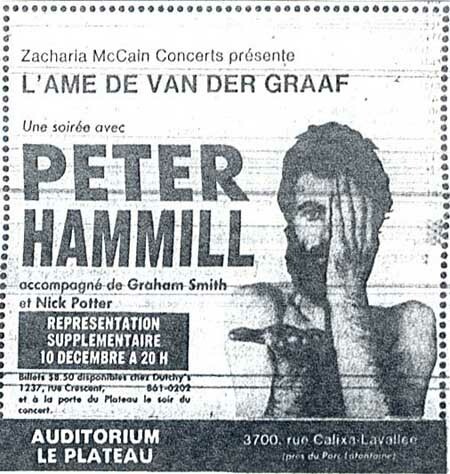 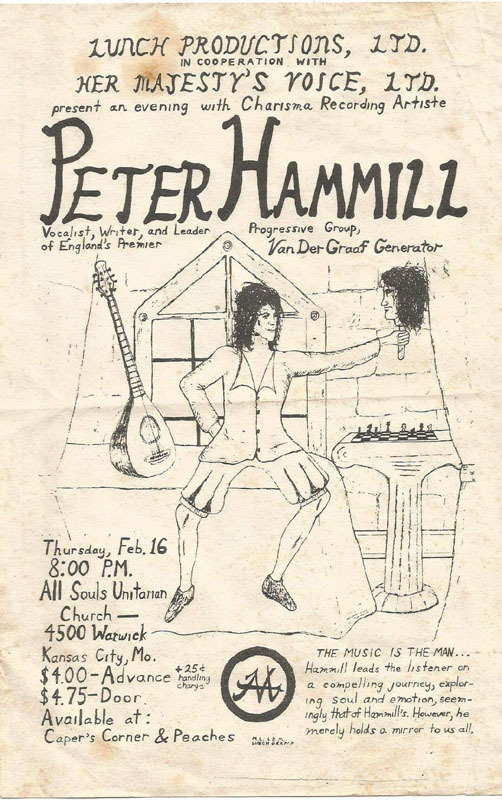 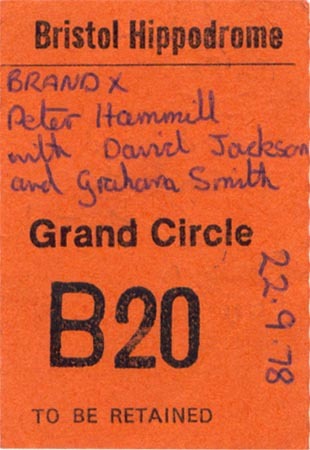 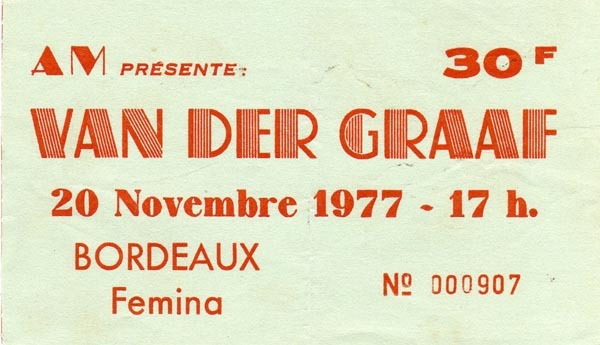 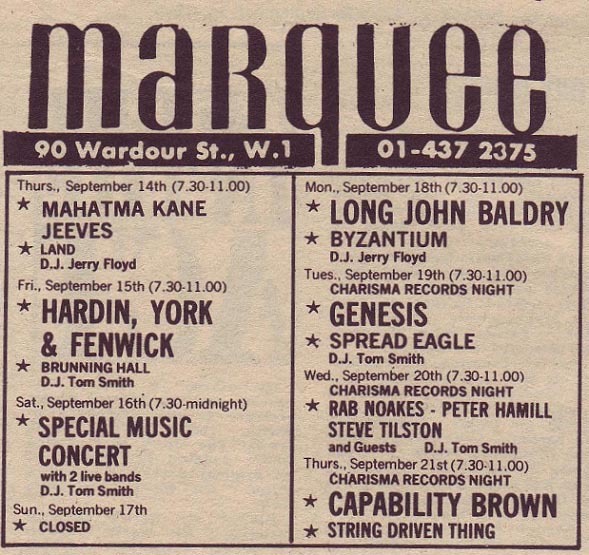 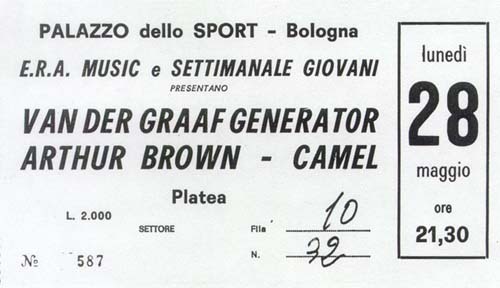 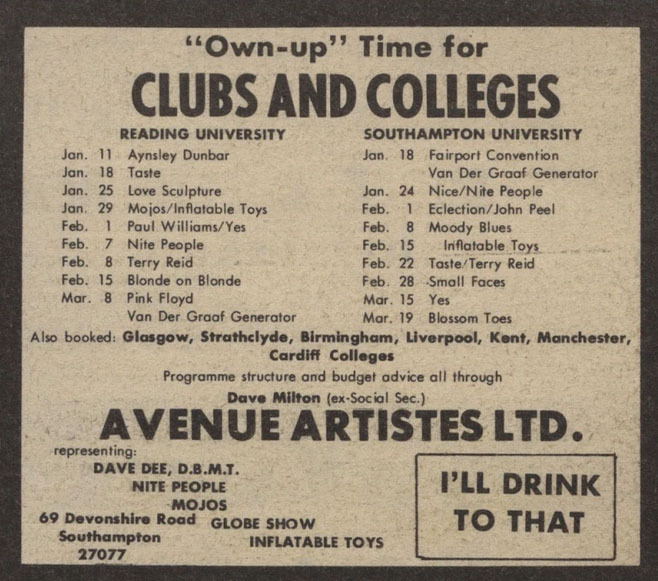 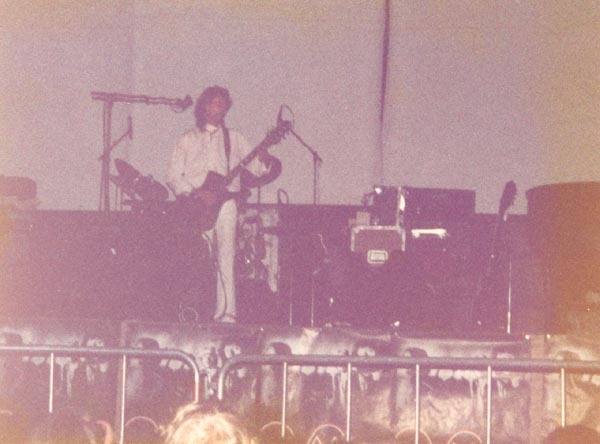 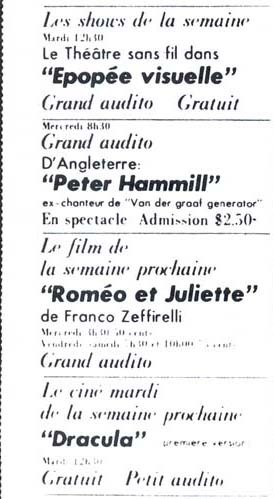 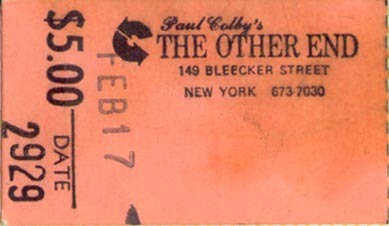 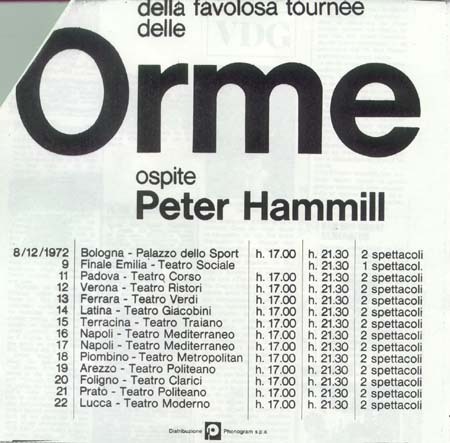 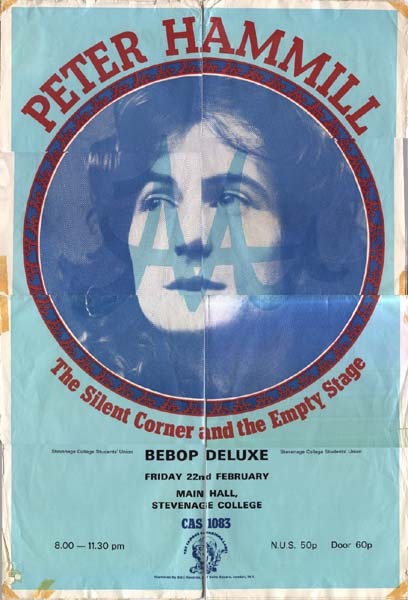 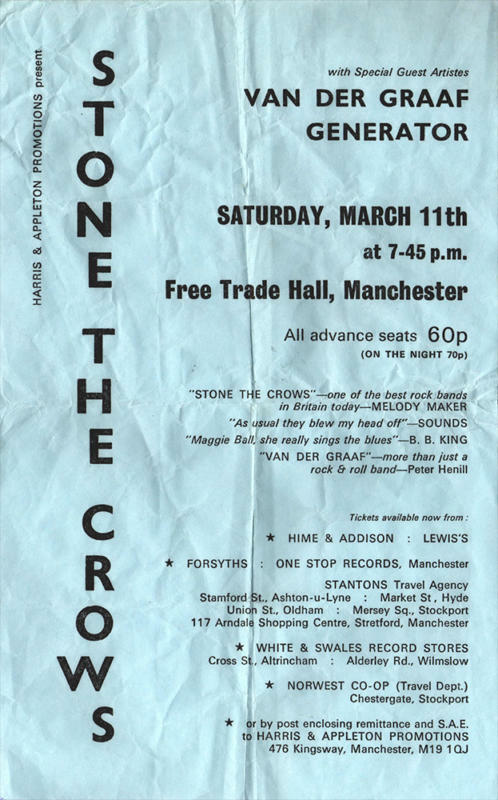 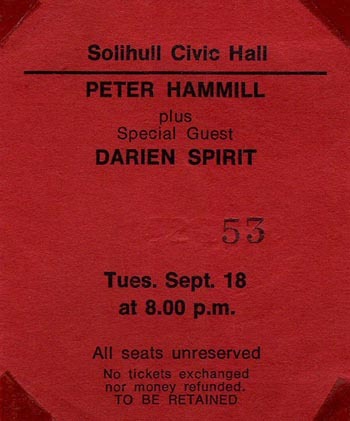 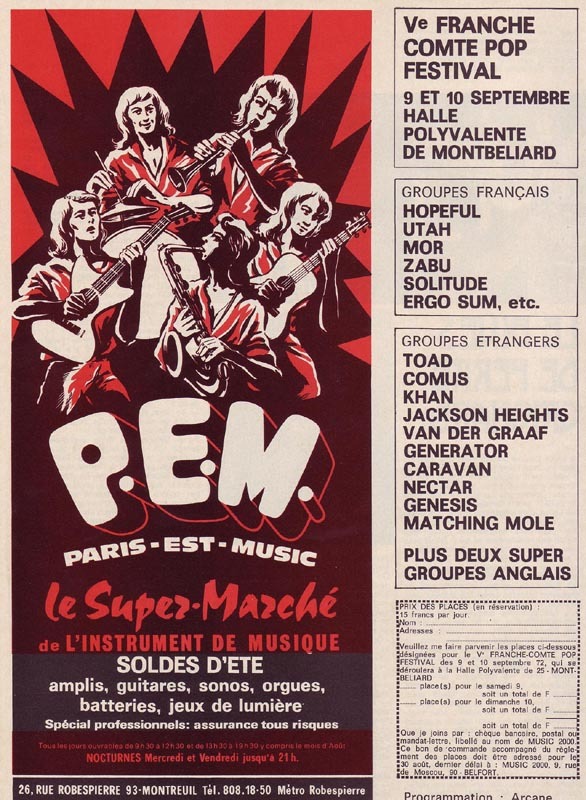 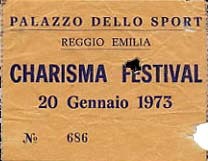 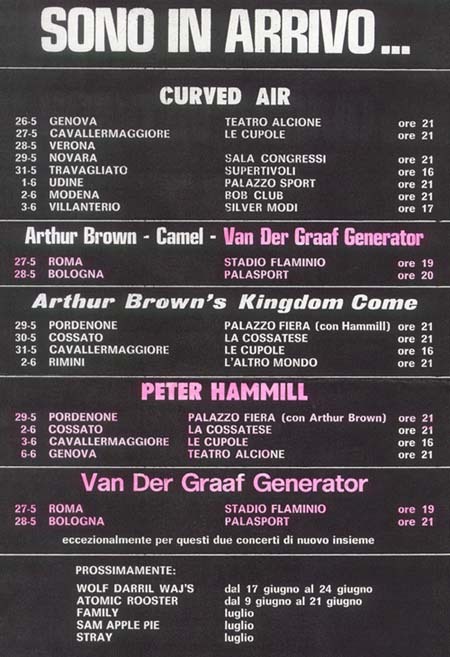 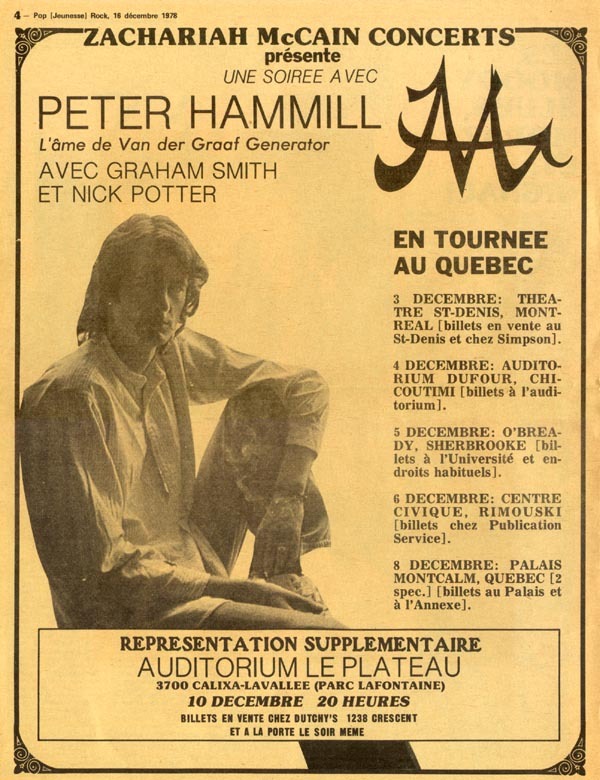 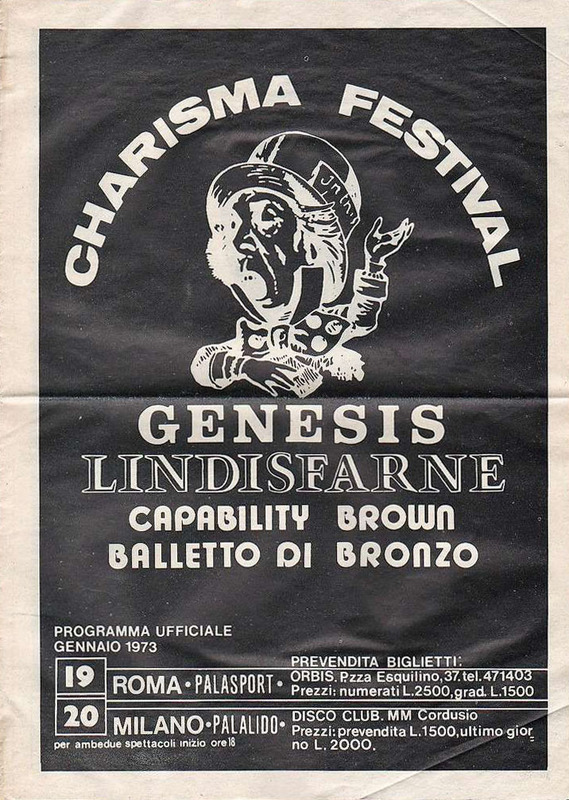 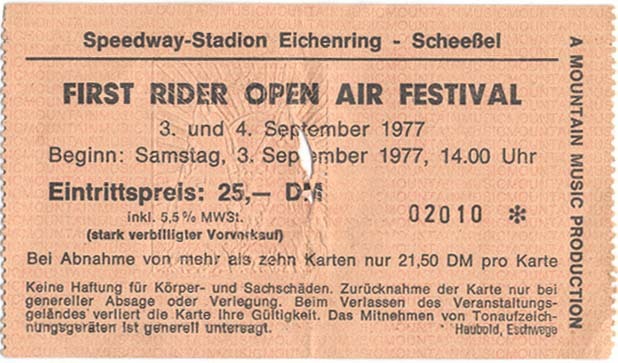 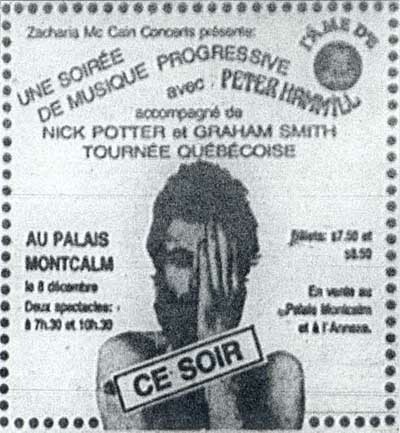 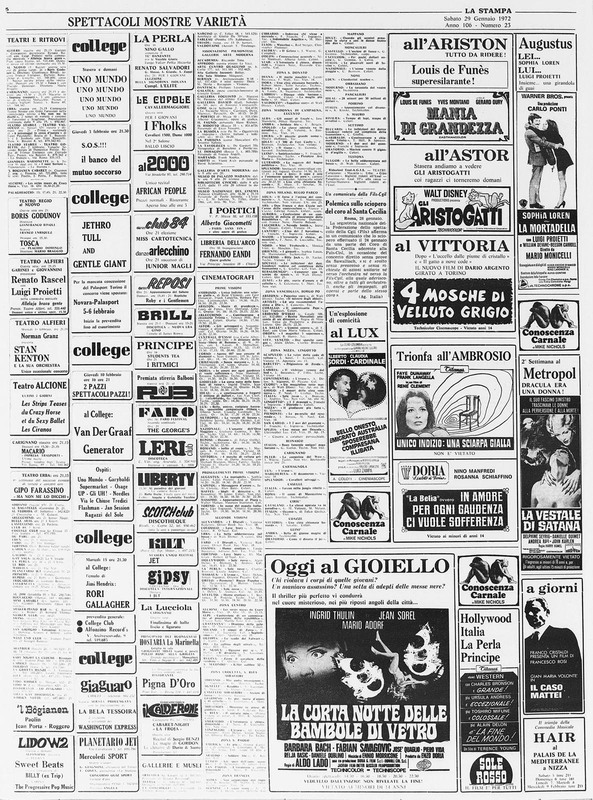 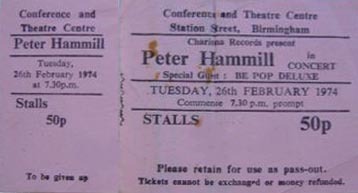 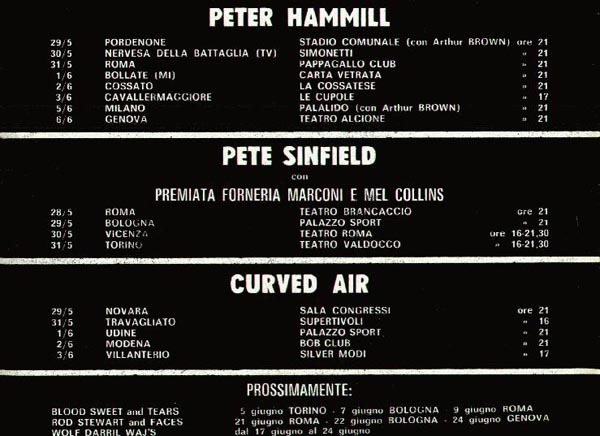 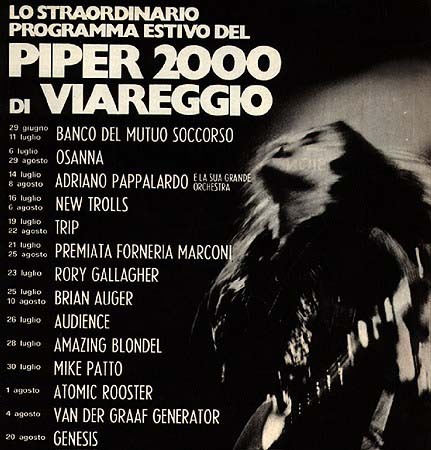 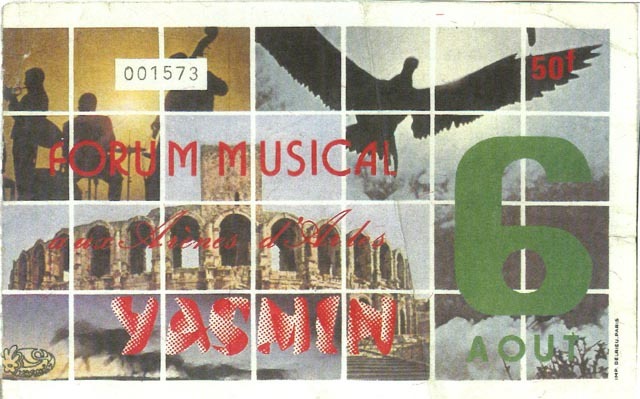 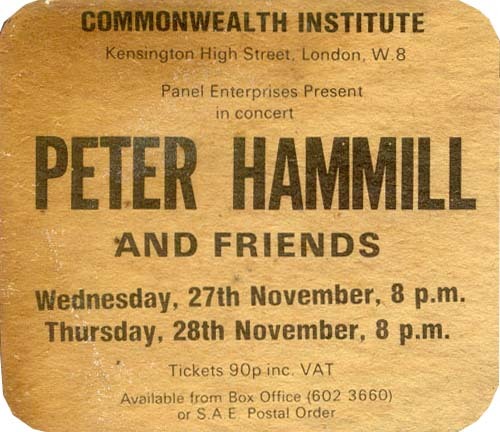 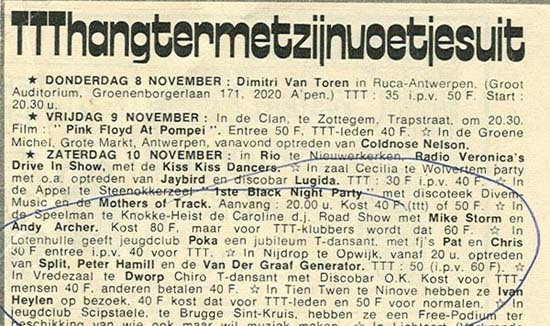 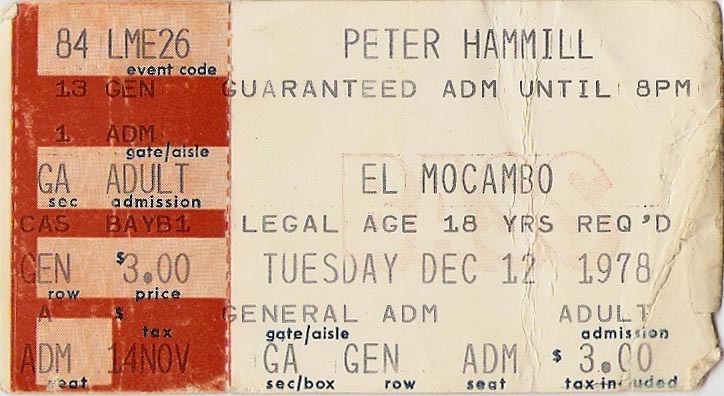 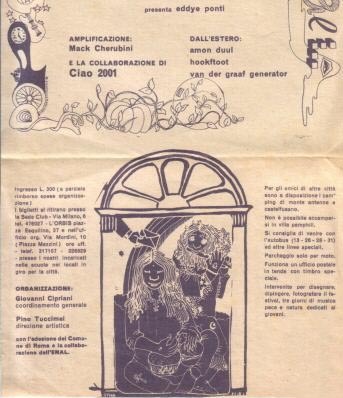 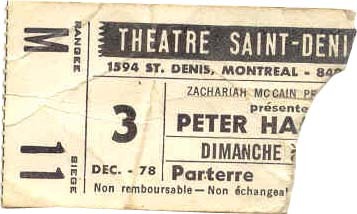 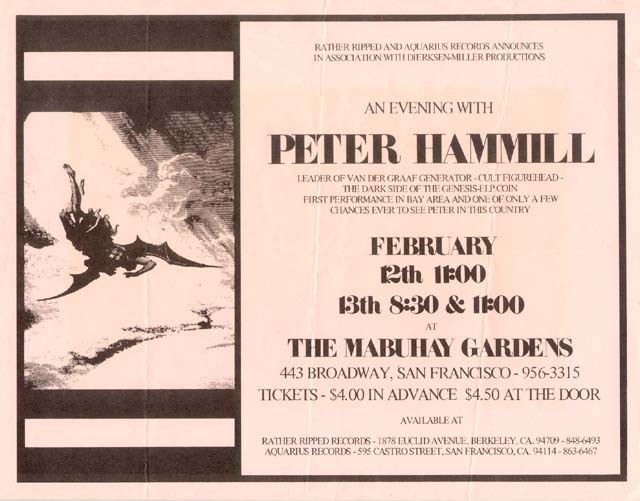 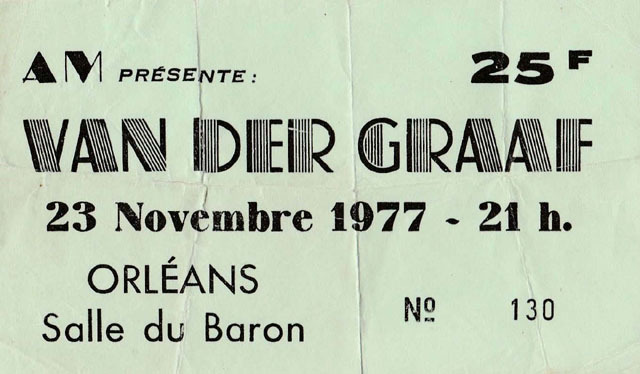 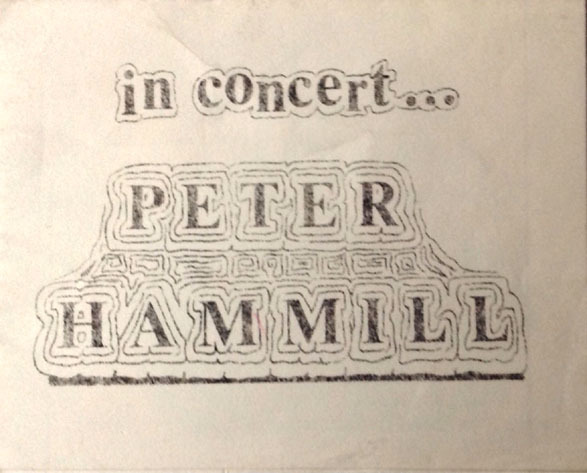 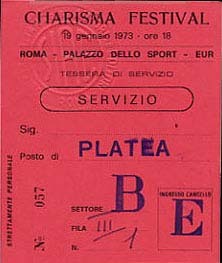 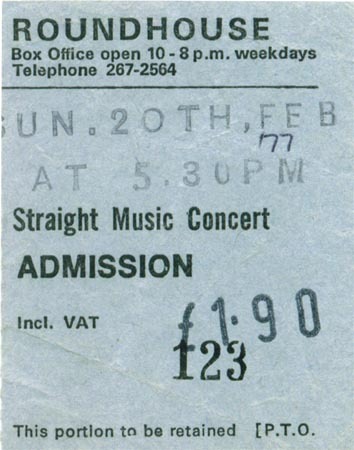 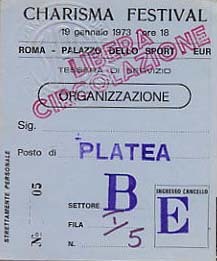 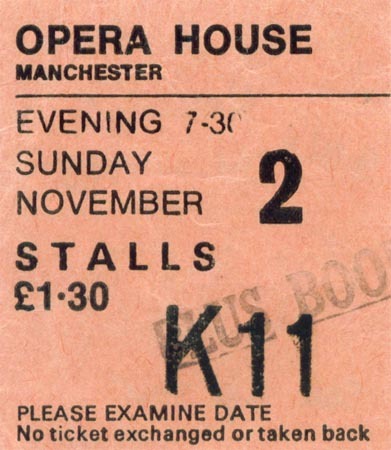 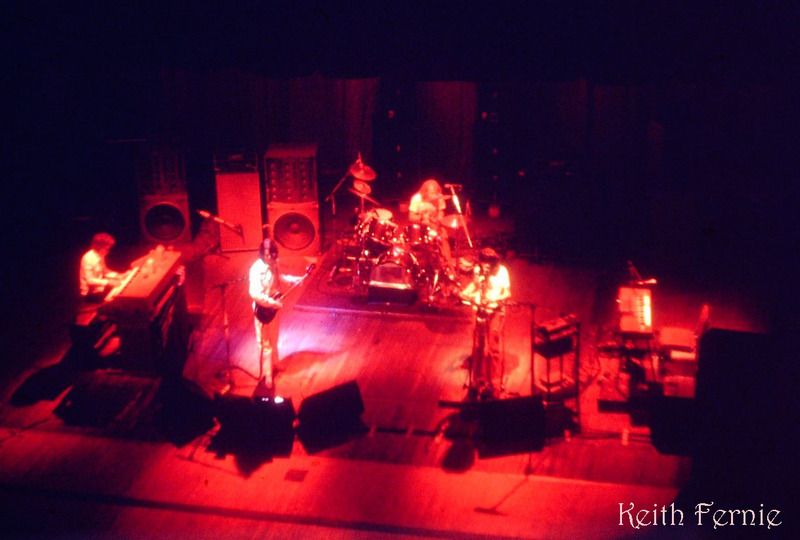 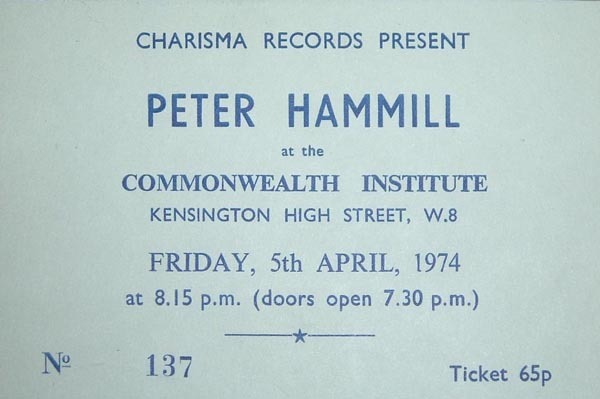 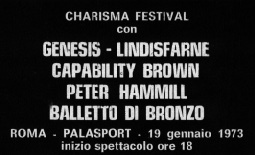 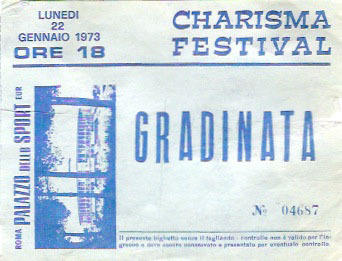 Also broadcast by Scottish TV, late at night in the early 80's, as part of a series called "Rock of the Seventies"
20 JAN 73 Italy, Reggio Emilia, Pallazzo Dello Sport (Ticket, Charisma Festival Advert, Programme) - PH and DJ may not have been at this one. 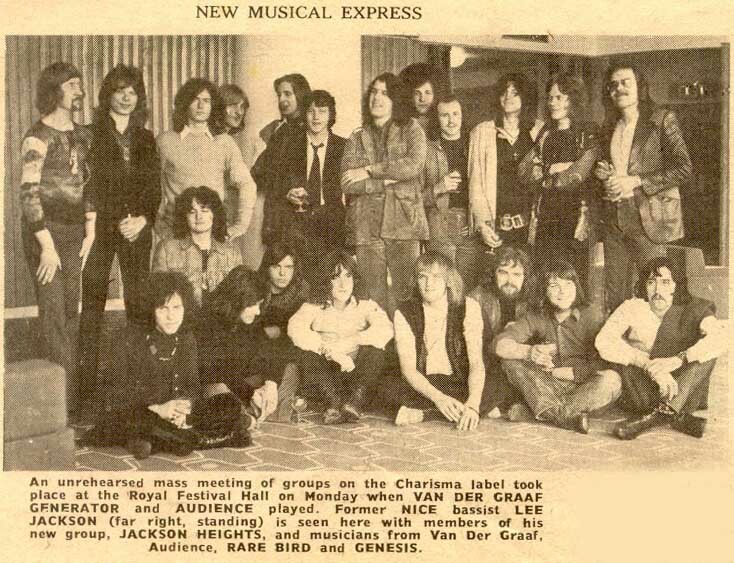 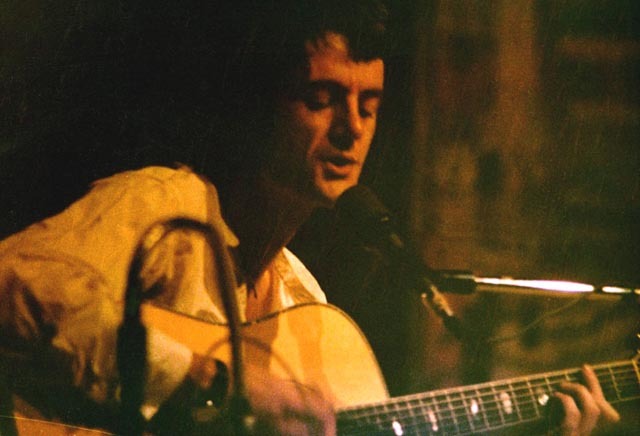 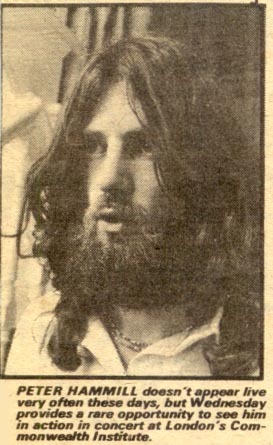 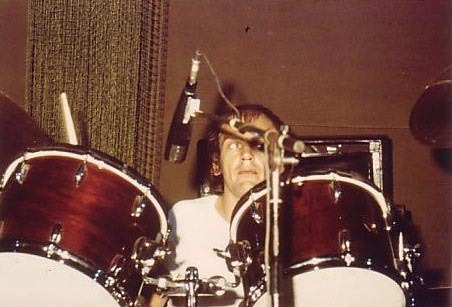 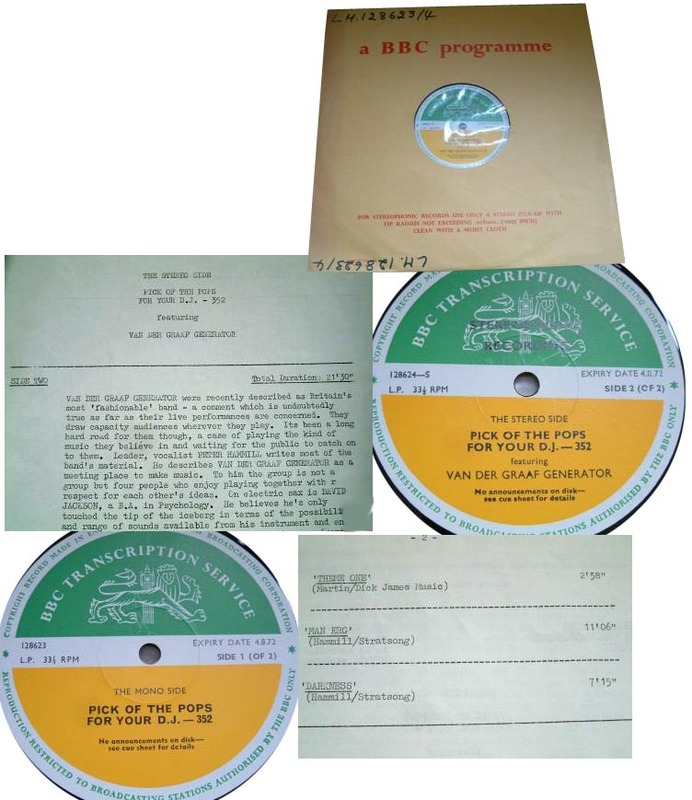 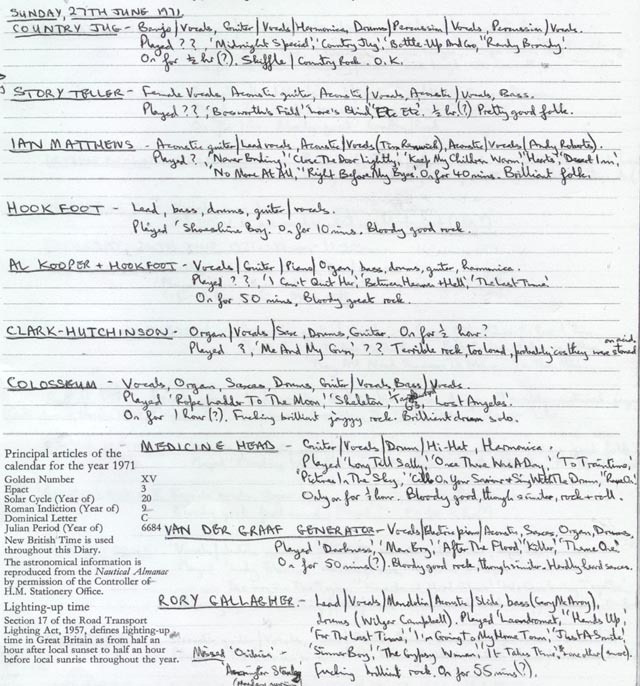 AUG 73 - LONG HELLO SESSIONS recorded at FOEL STUDIOS, CEFN COCH. 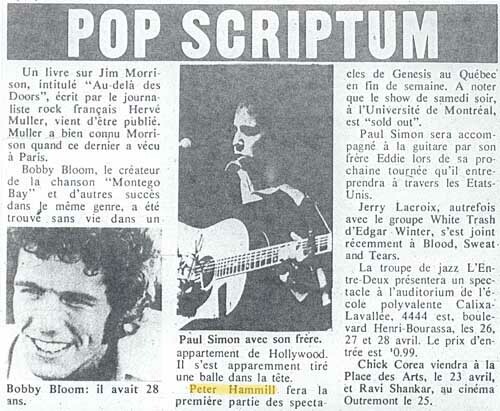 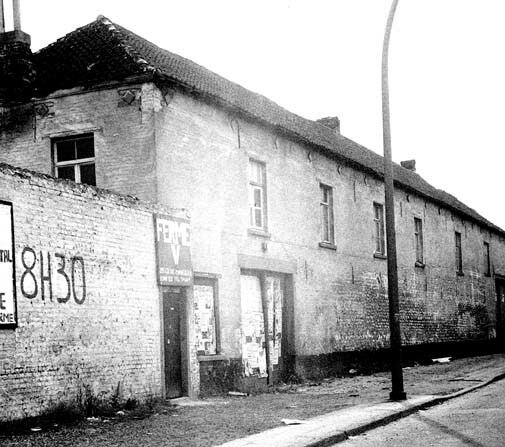 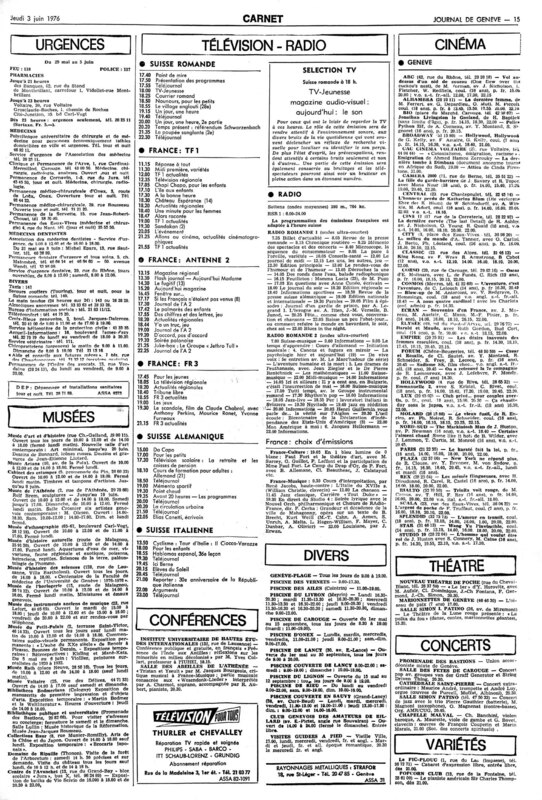 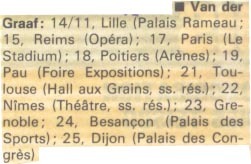 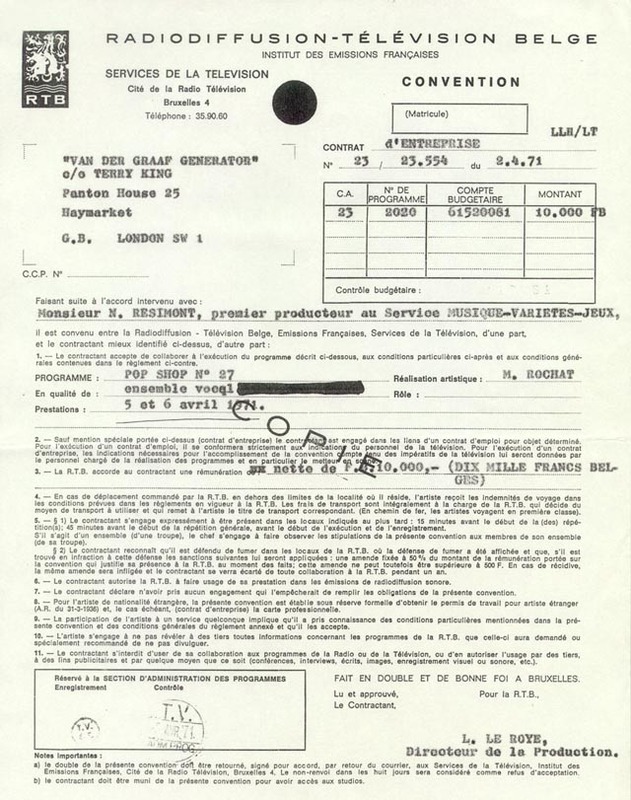 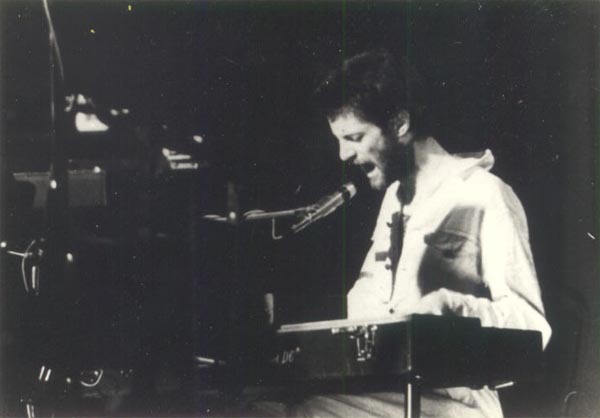 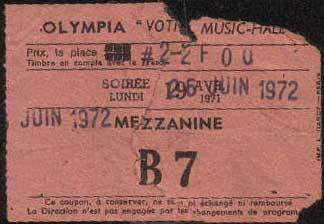 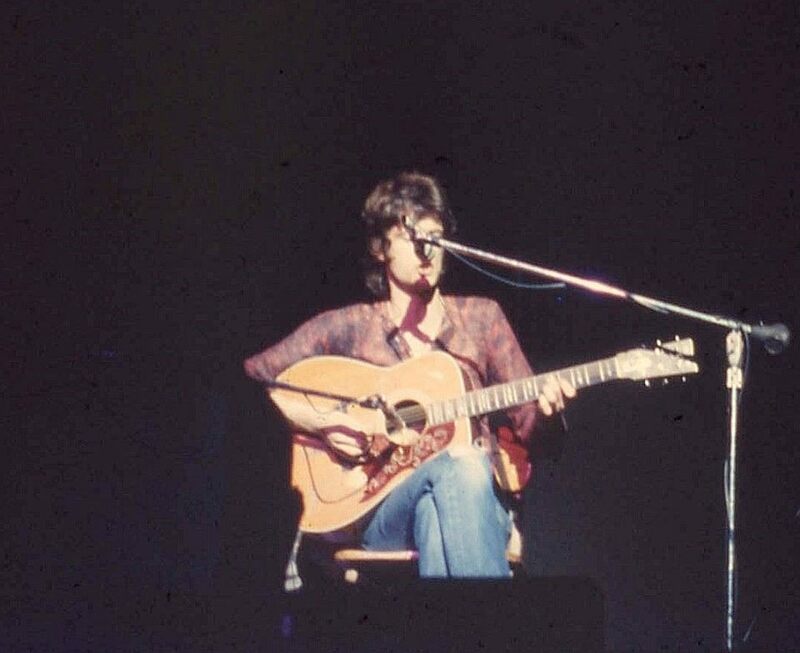 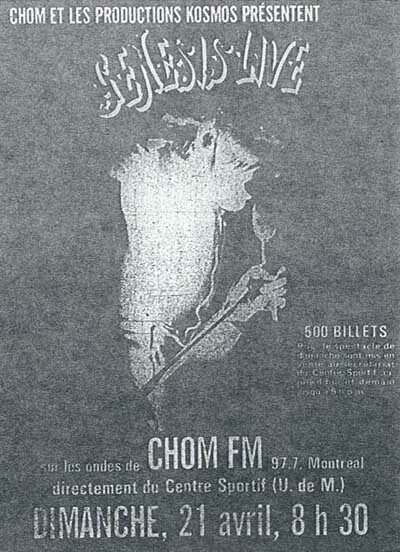 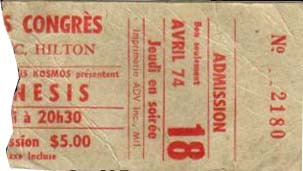 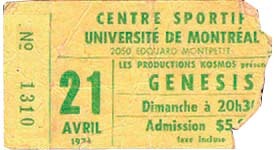 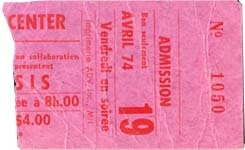 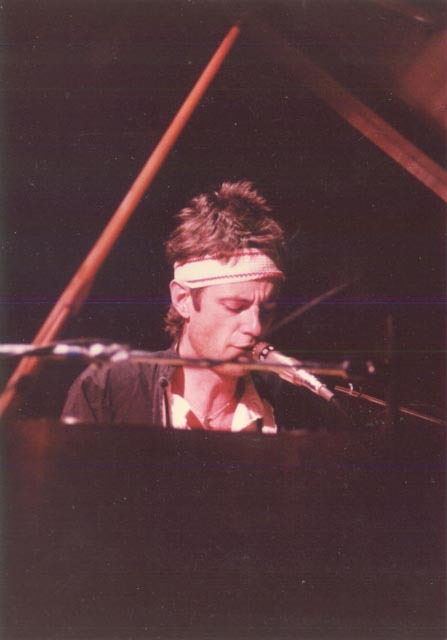 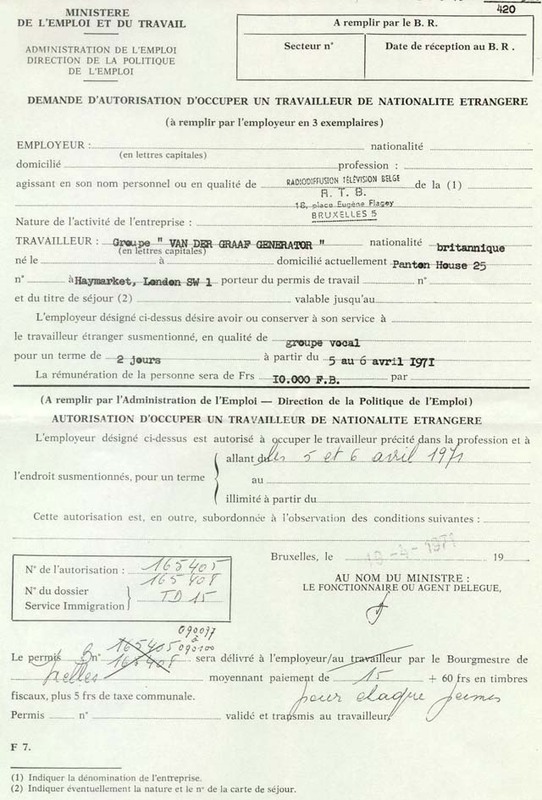 26 MAY 78 France, Lyon - actually on 29th. 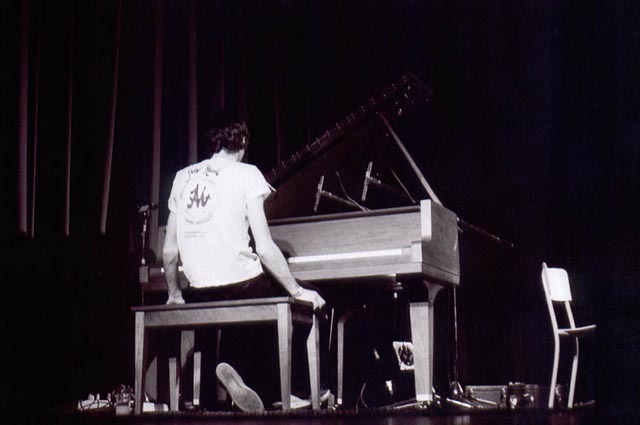 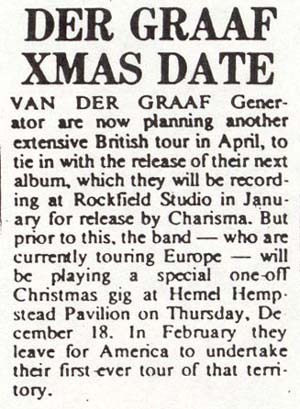 Van der Graaf split up for the last time? 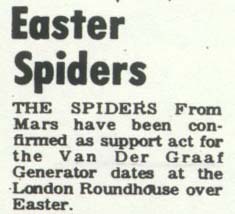 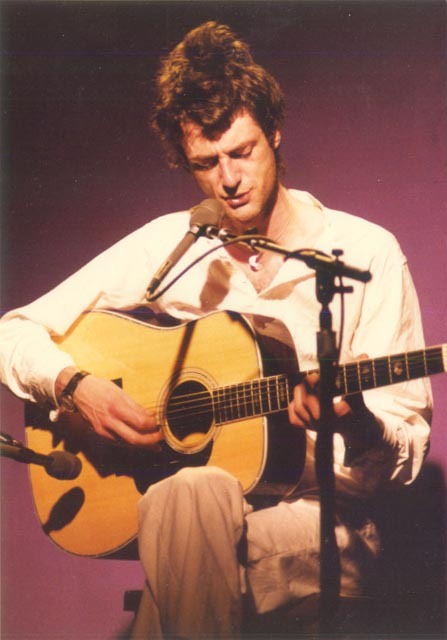 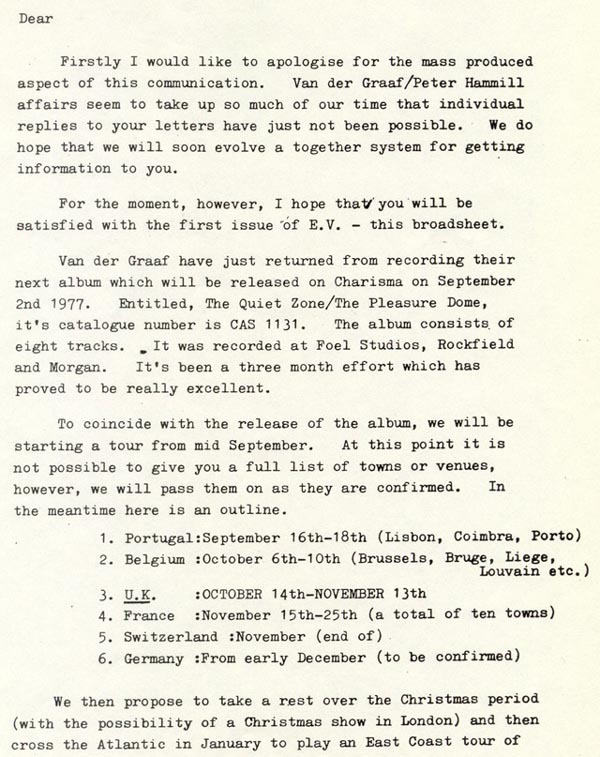 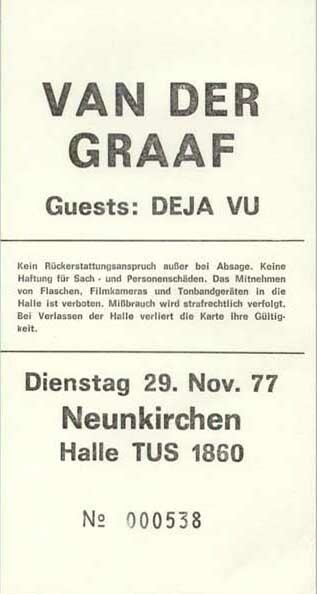 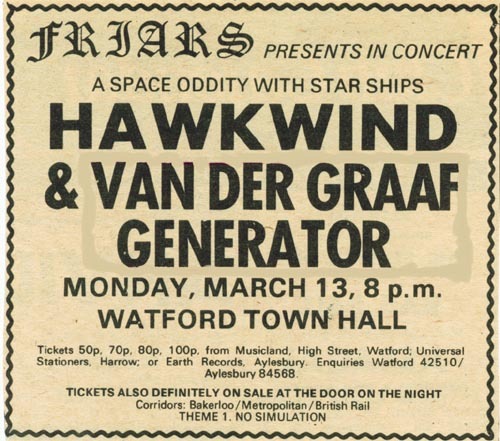 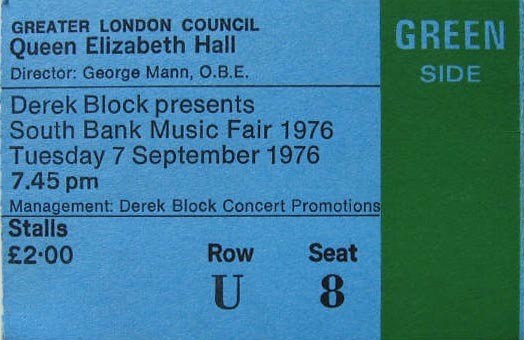 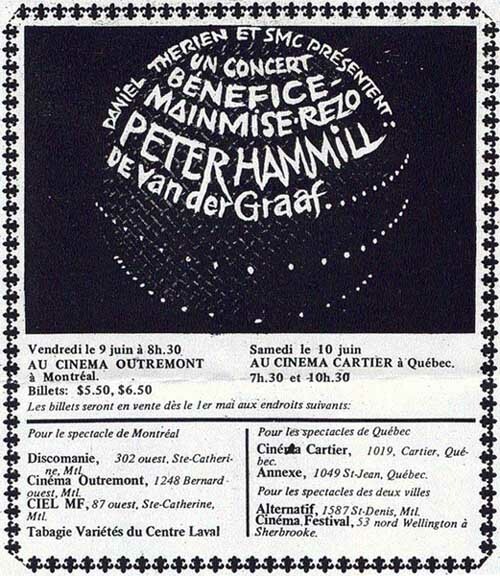 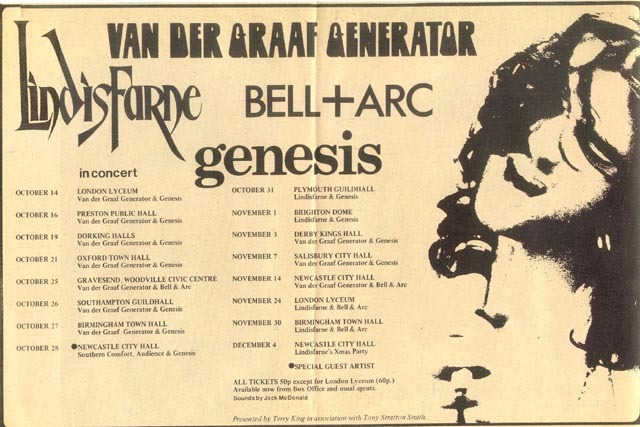 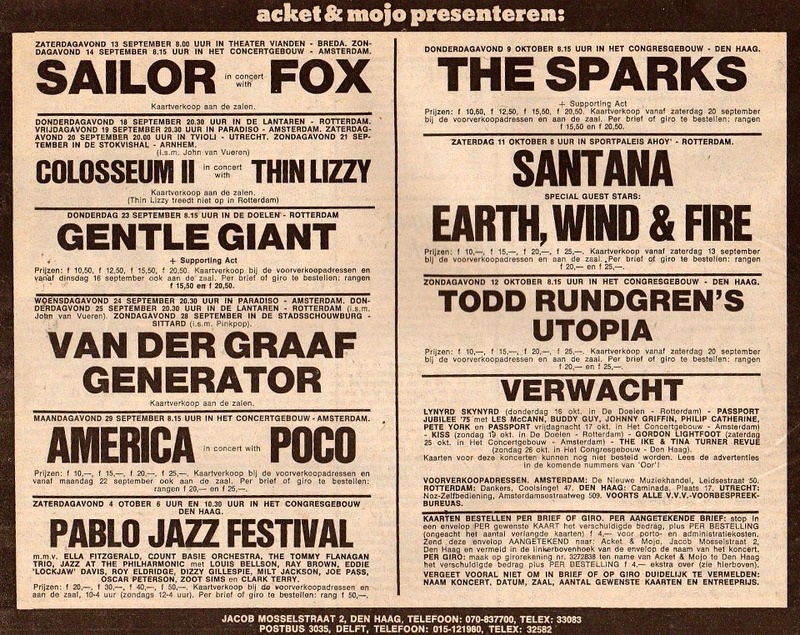 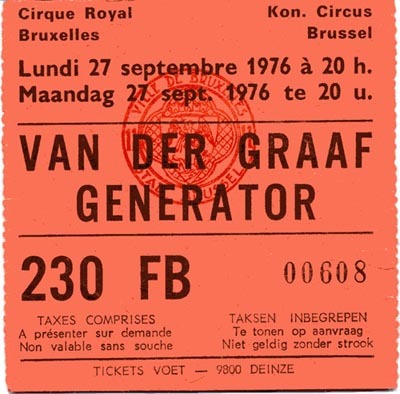 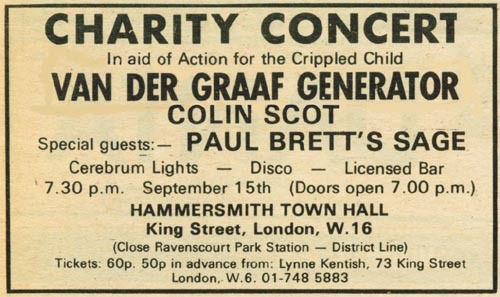 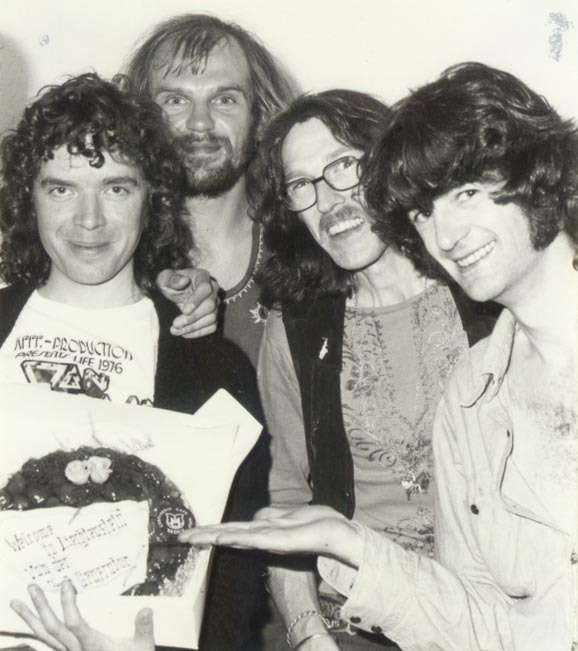 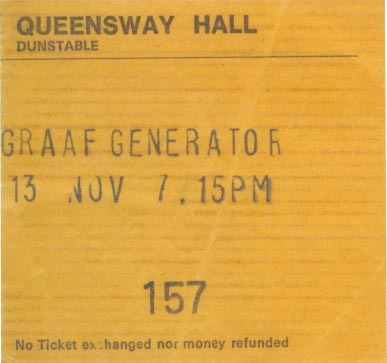 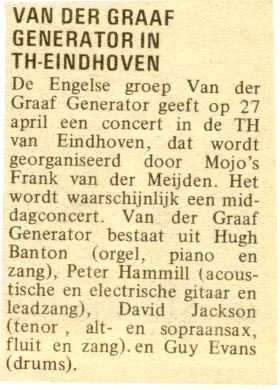 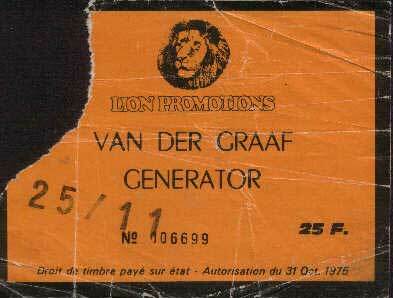 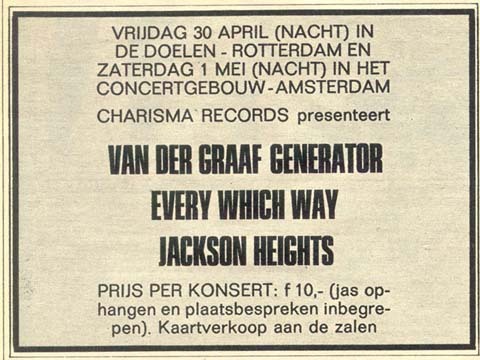 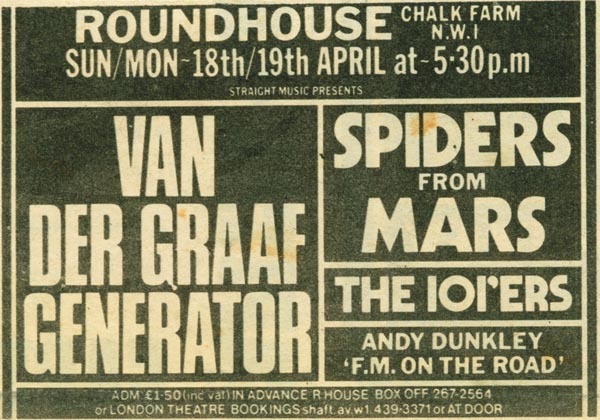 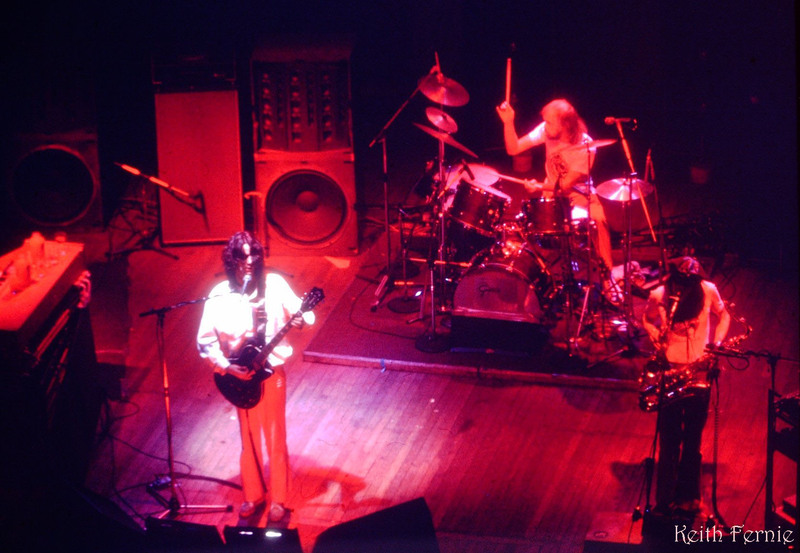 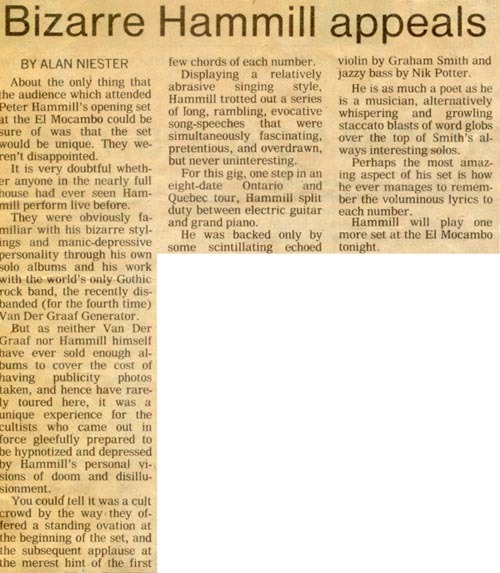 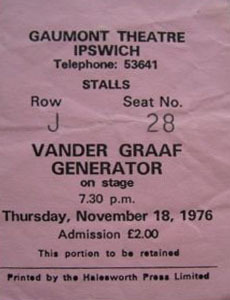 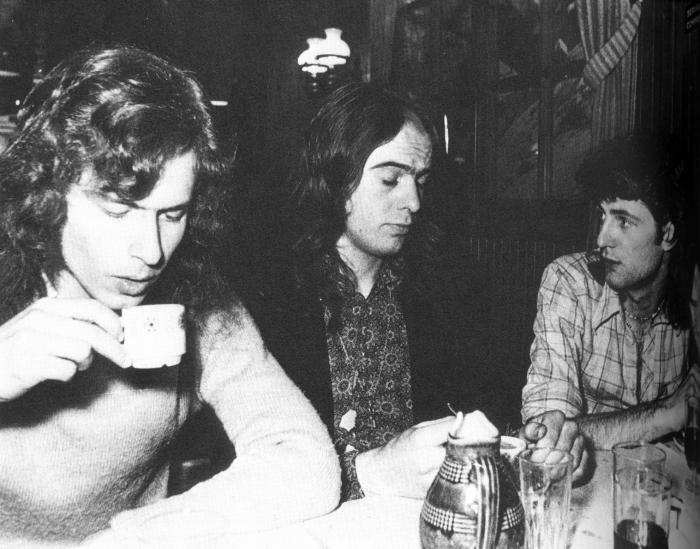 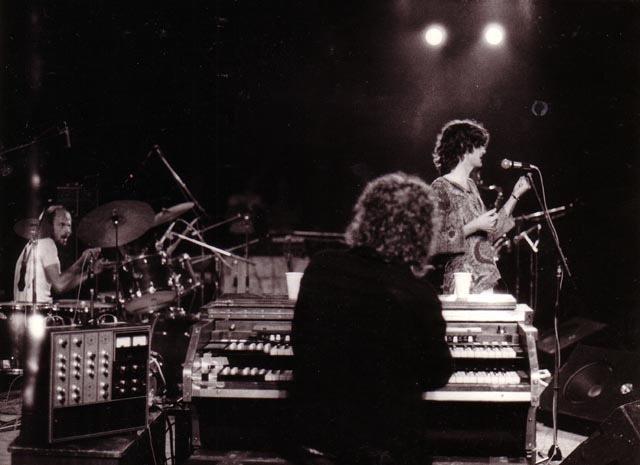 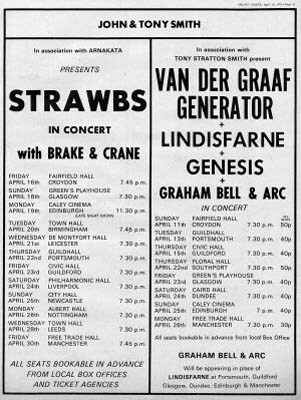 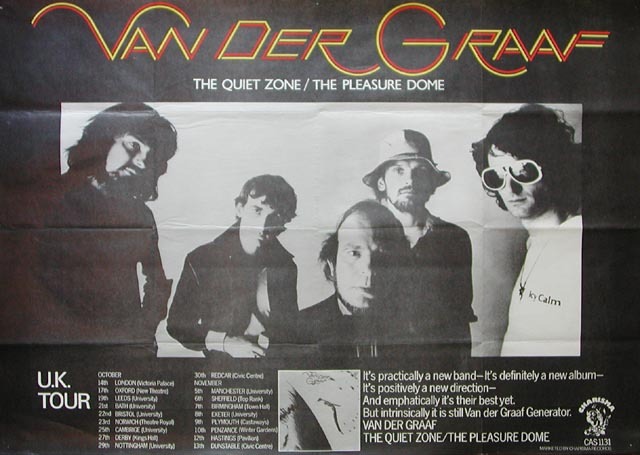 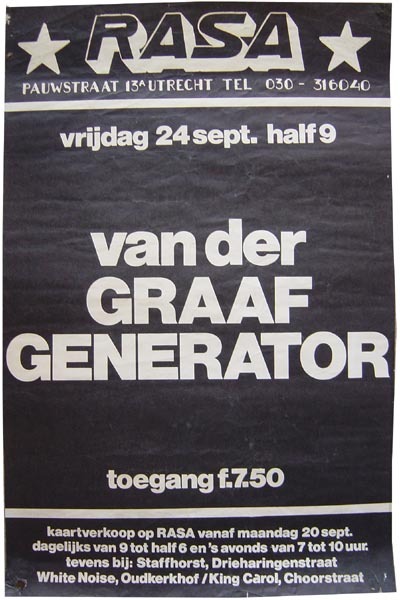 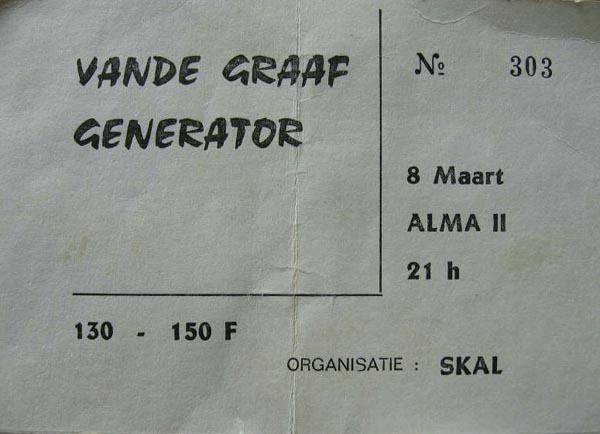 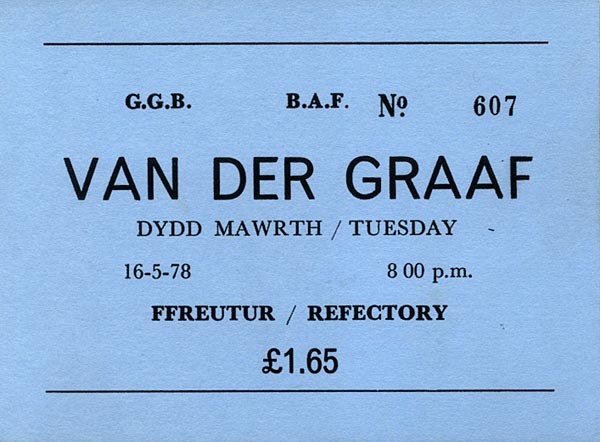 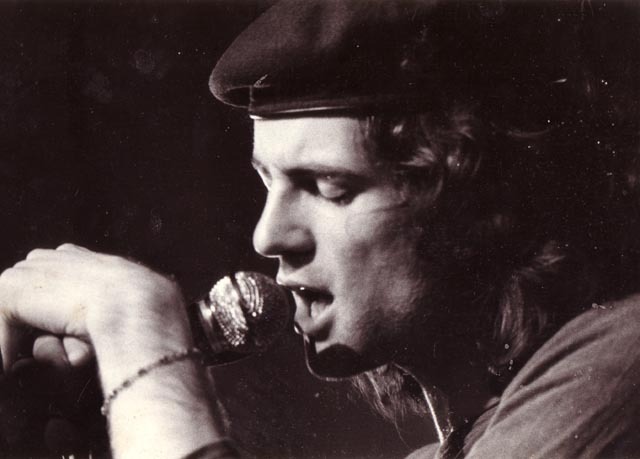 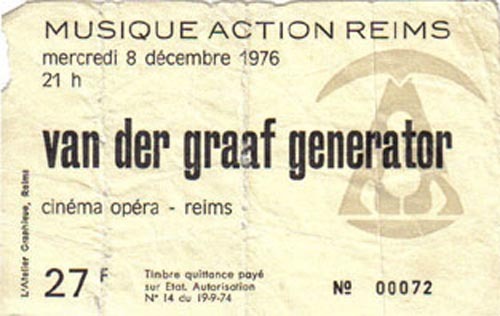 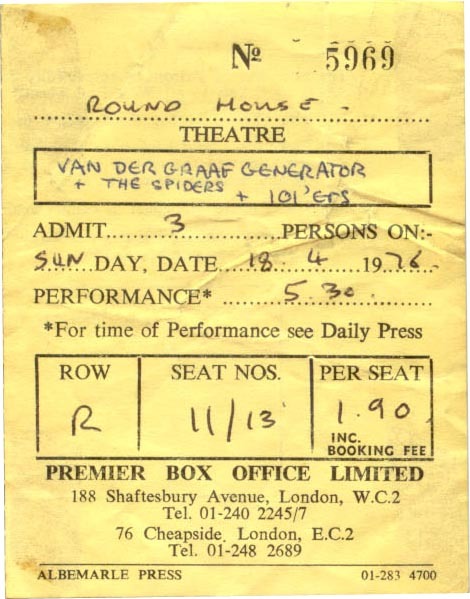 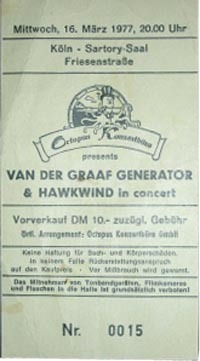 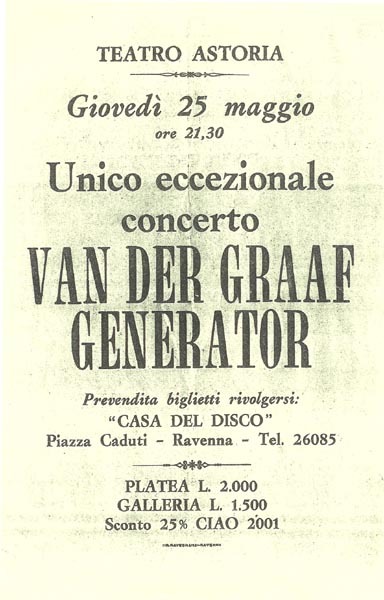 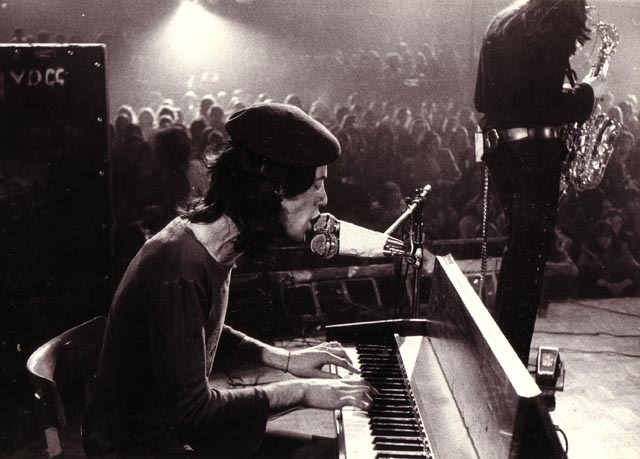 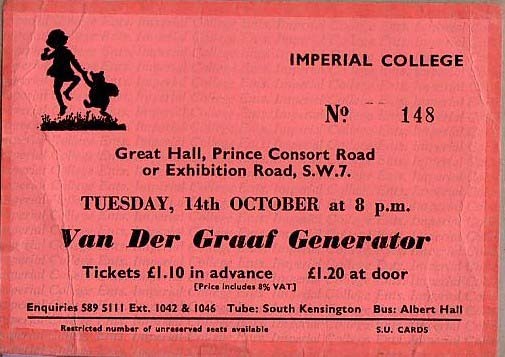 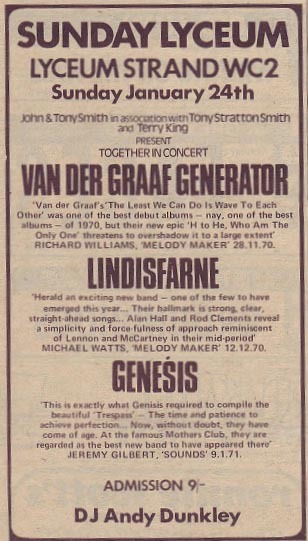 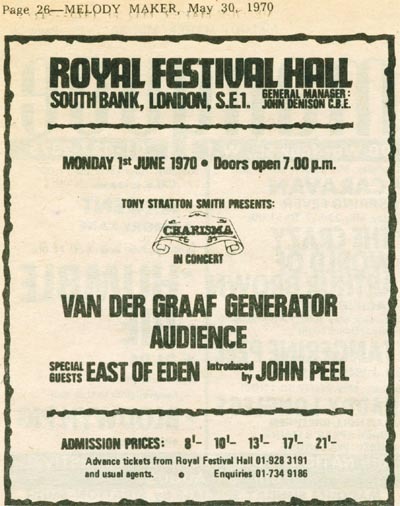 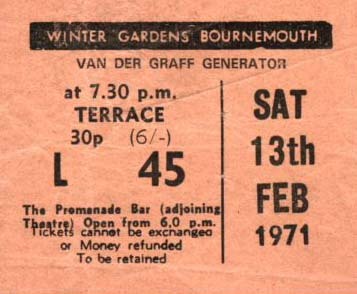 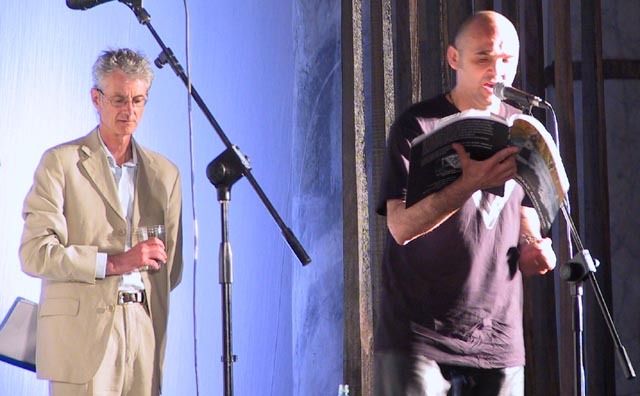 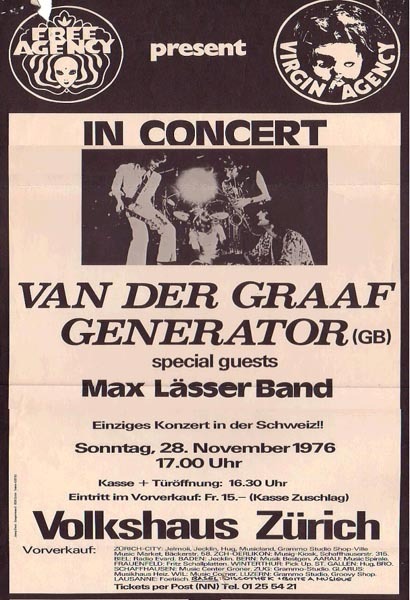 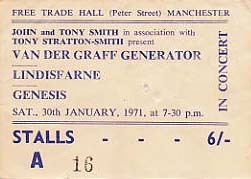 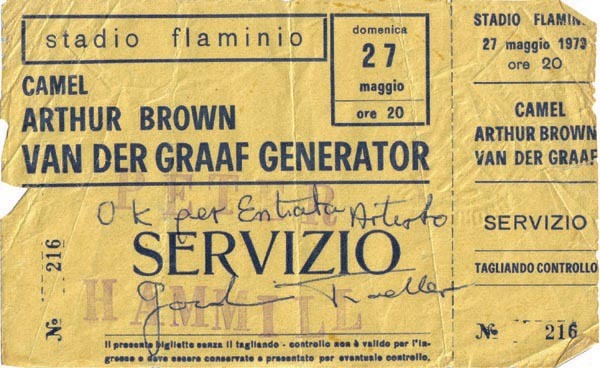 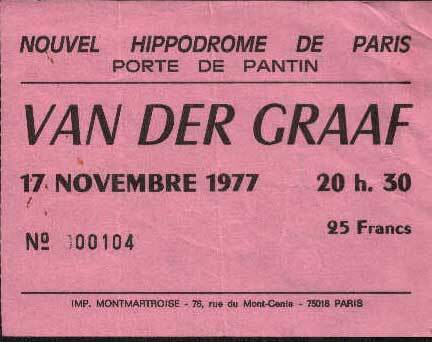 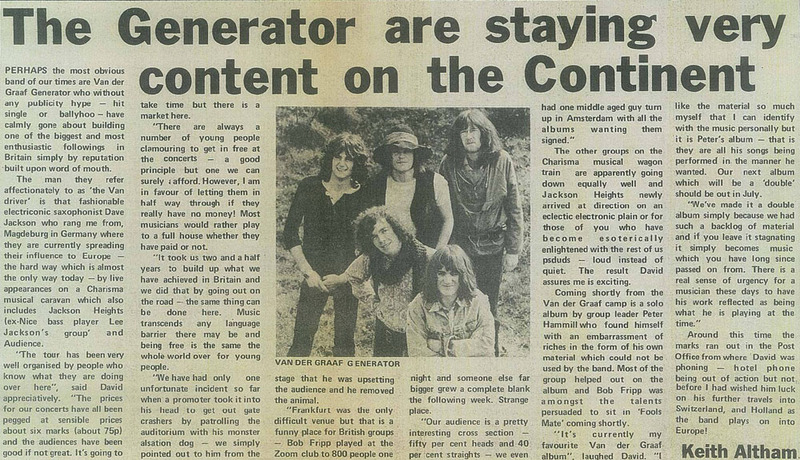 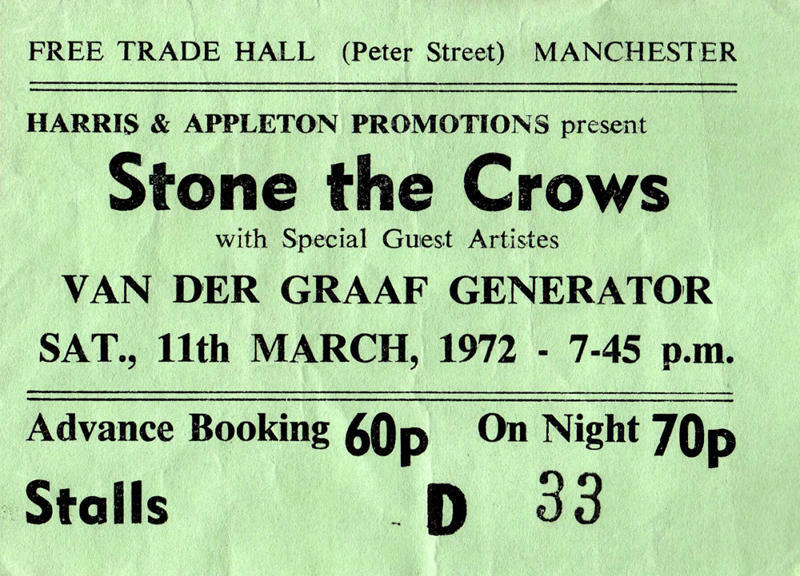 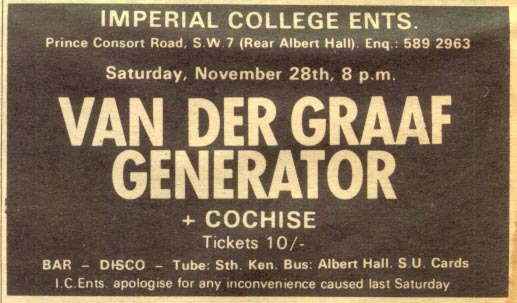 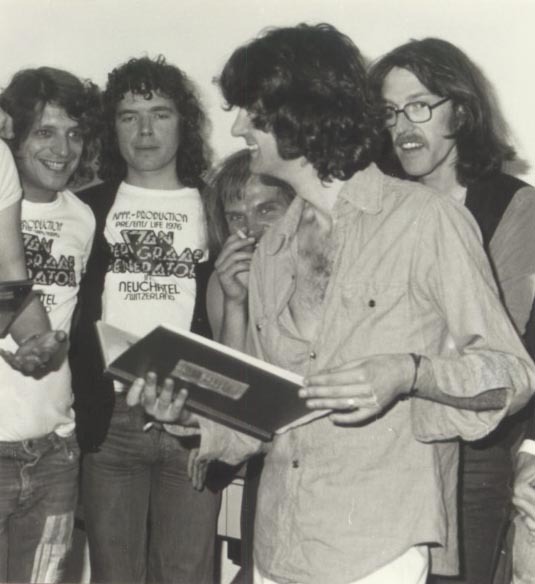 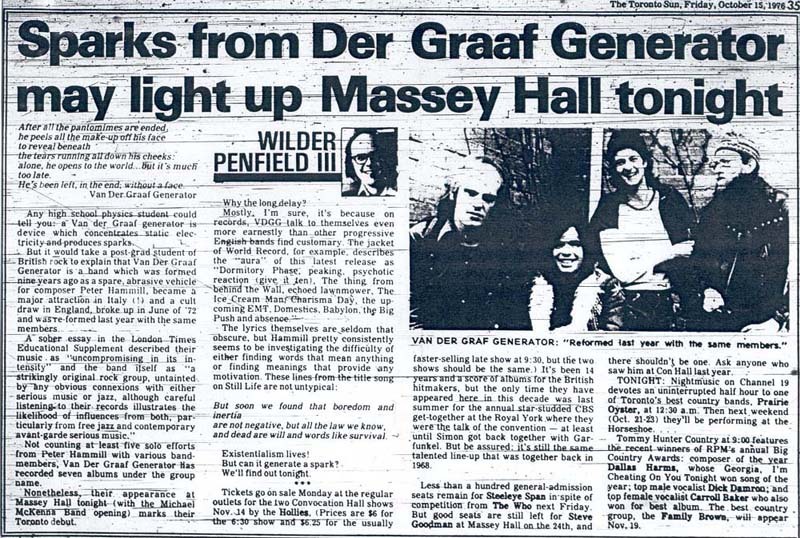 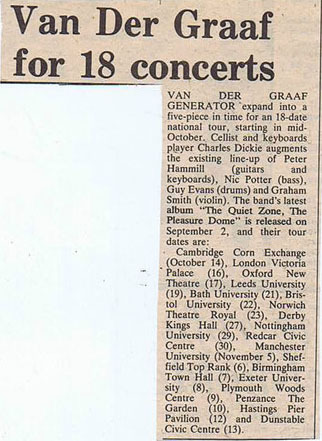 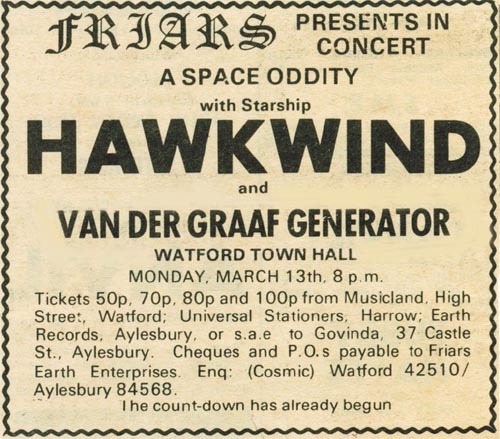 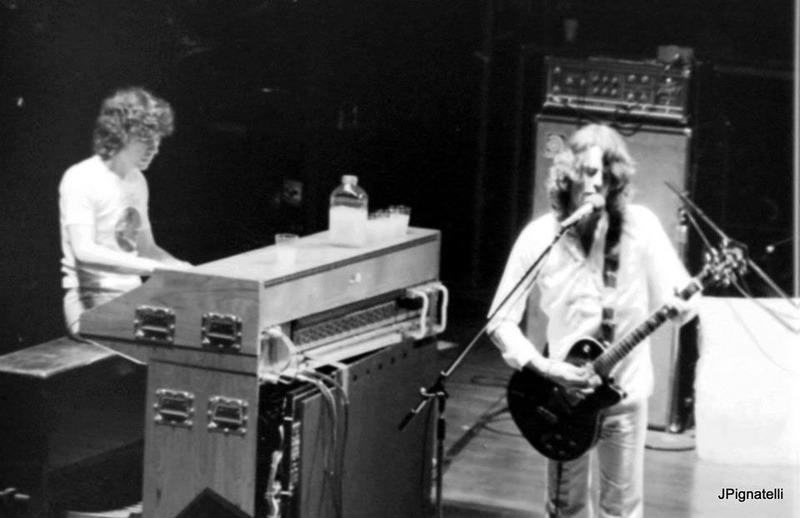 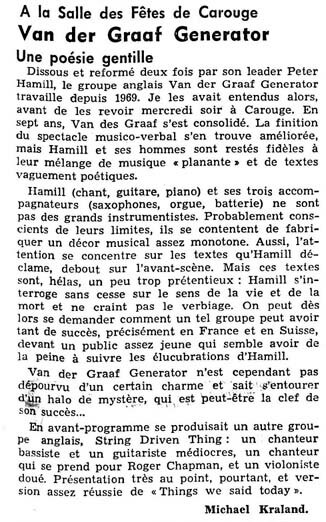 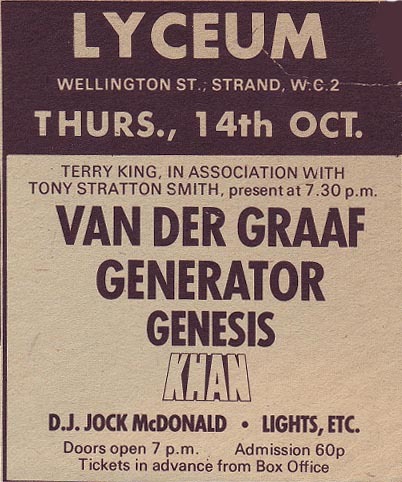 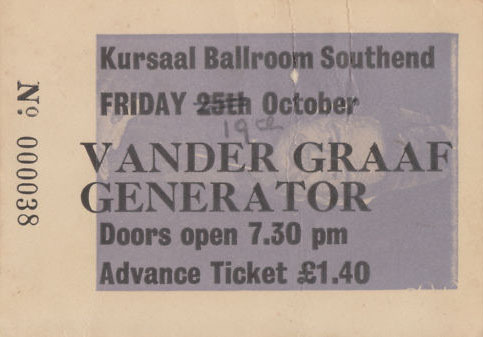 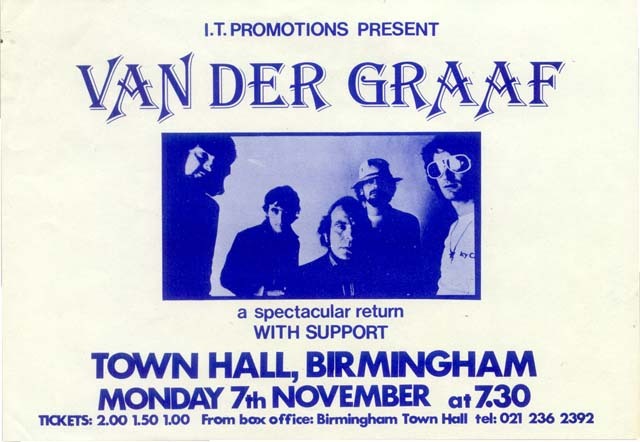 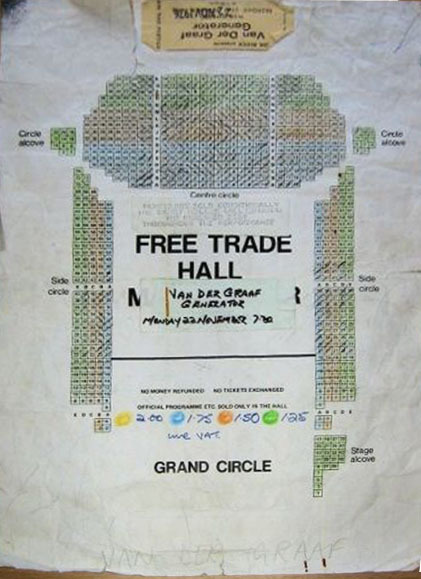 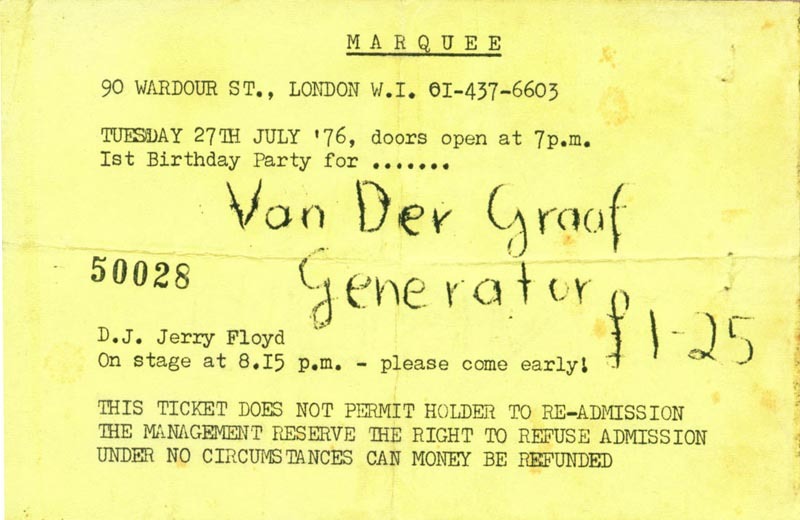 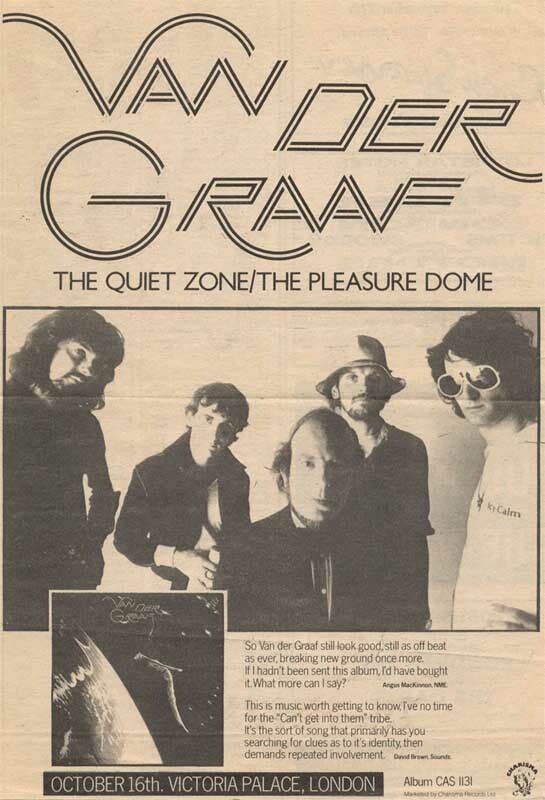 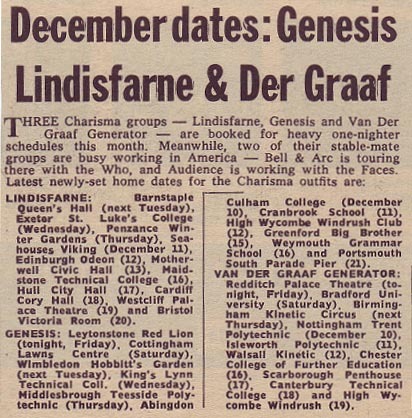 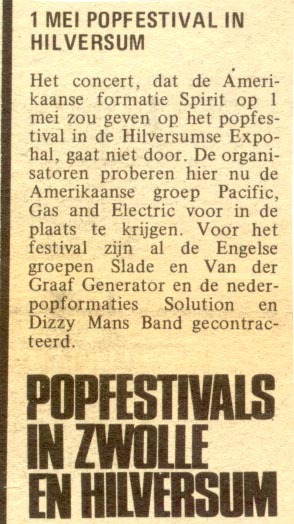 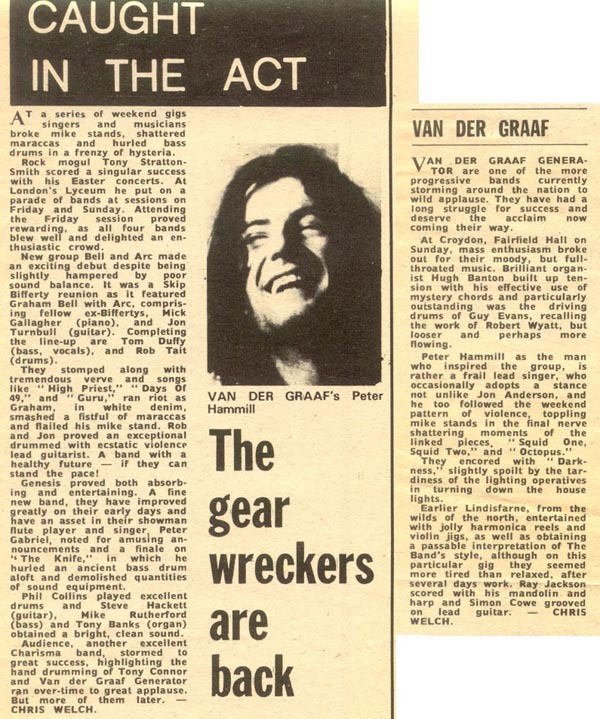 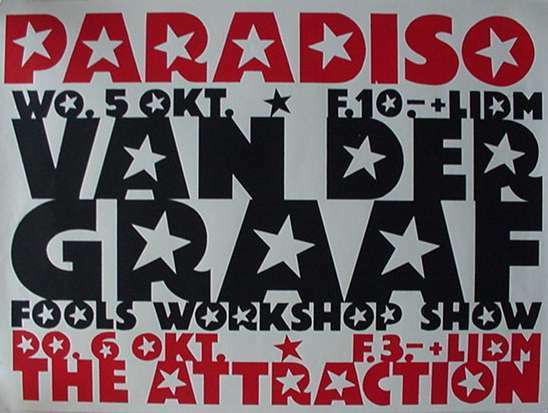 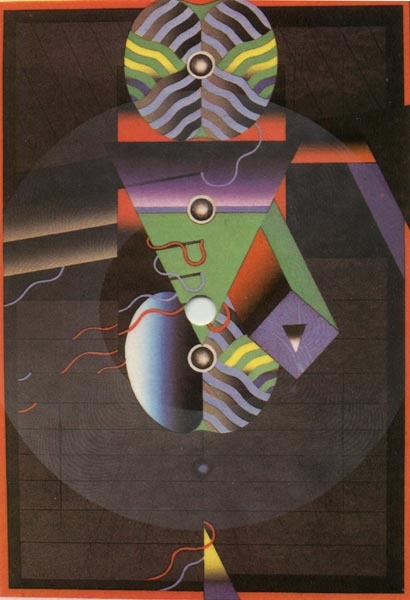 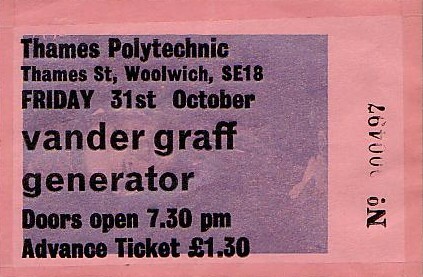 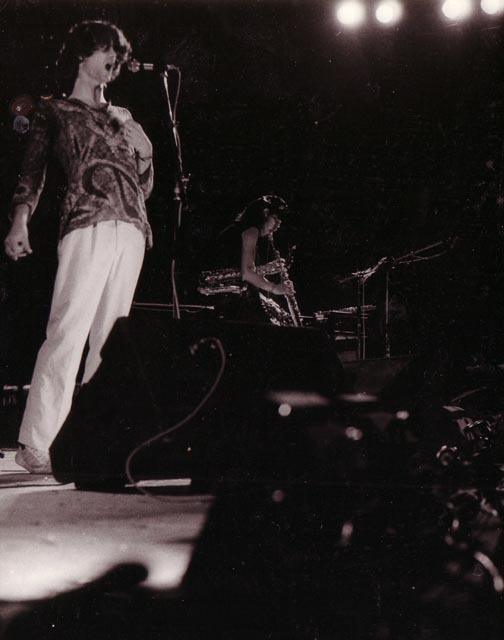 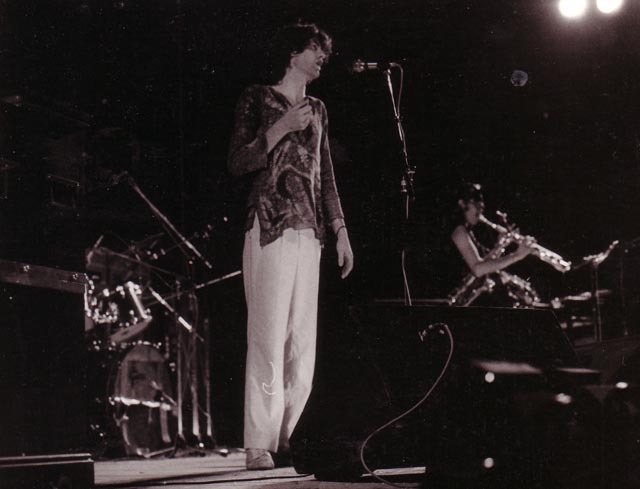 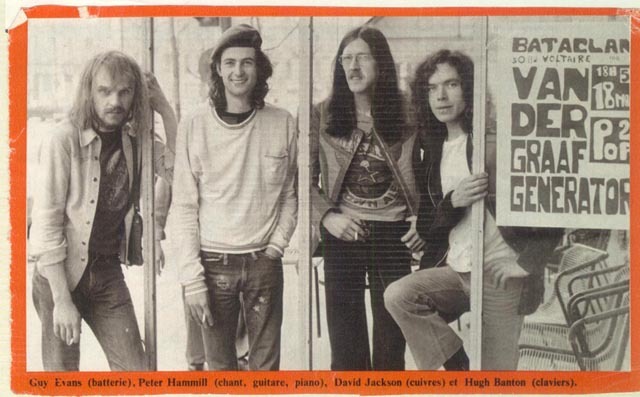 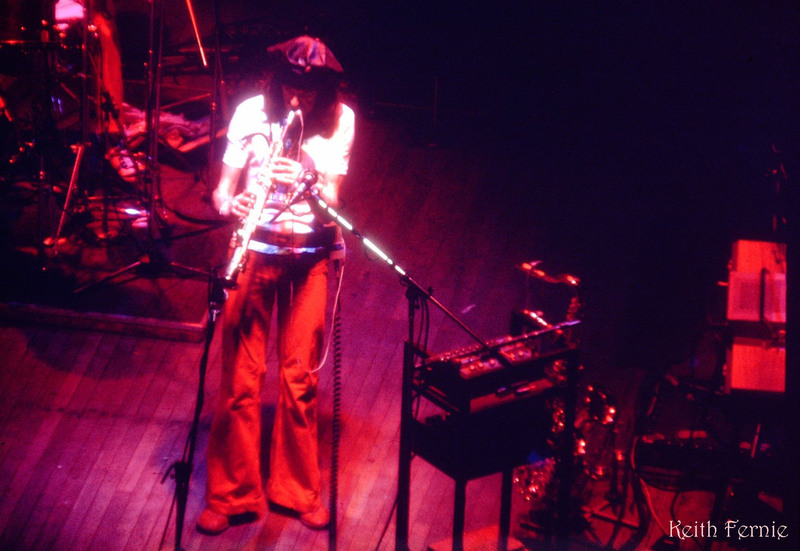 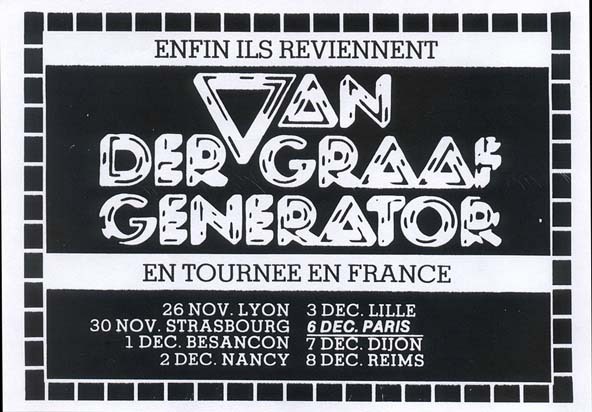 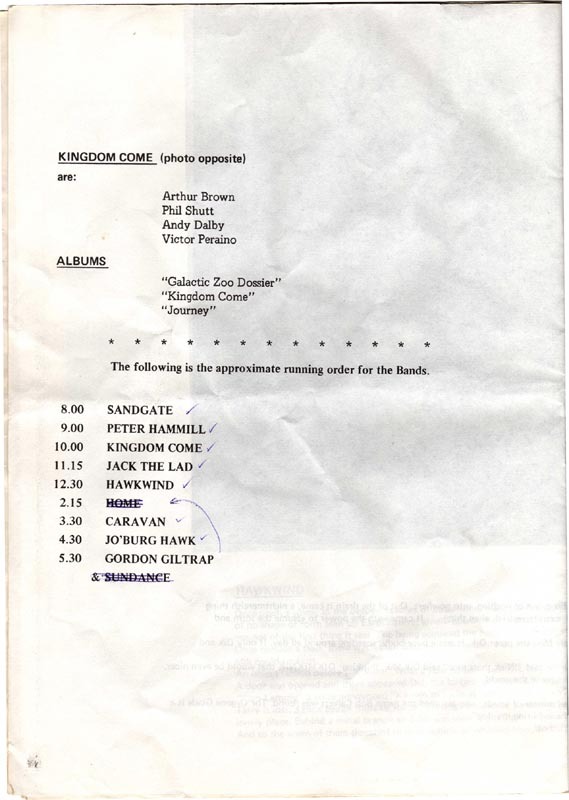 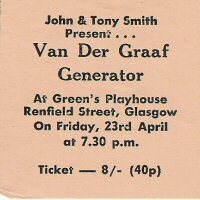 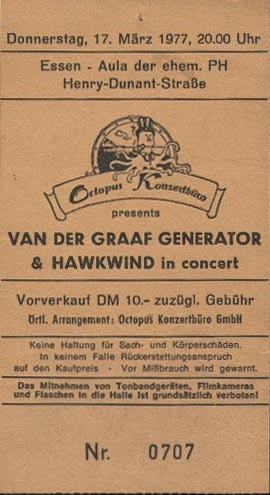 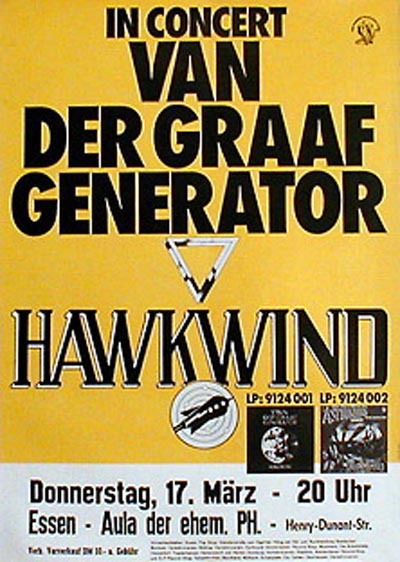 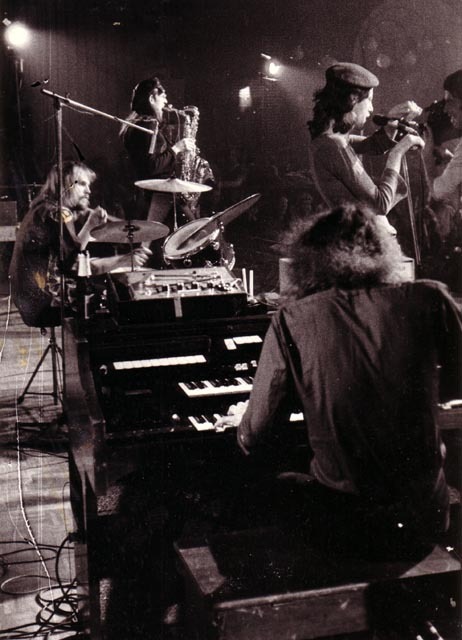 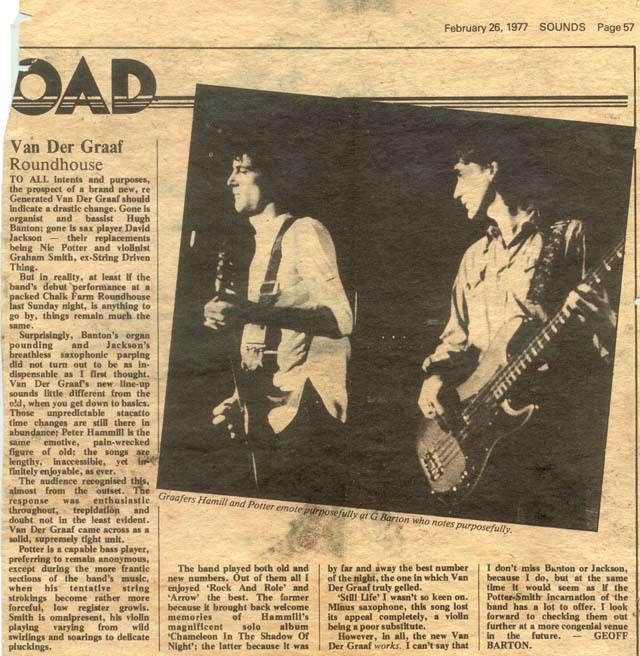 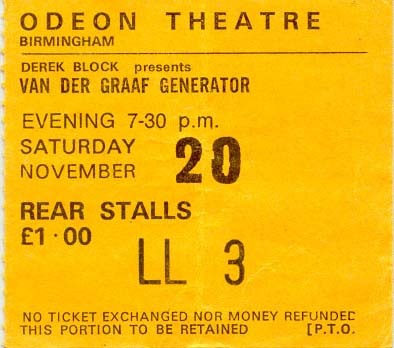 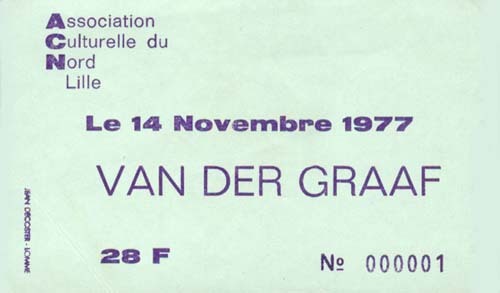 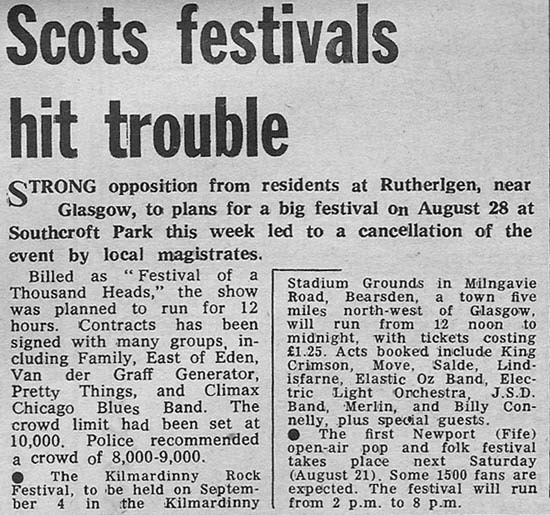 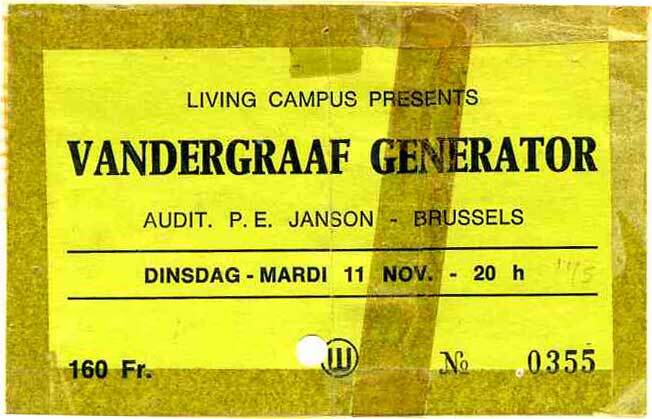 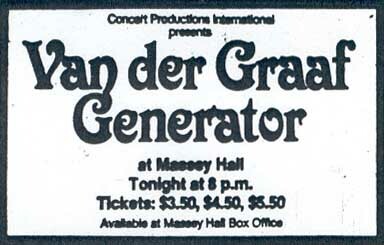 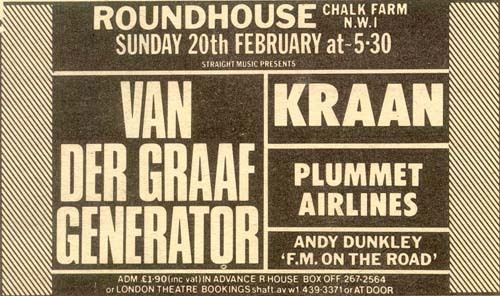 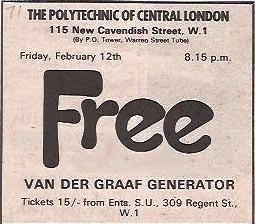 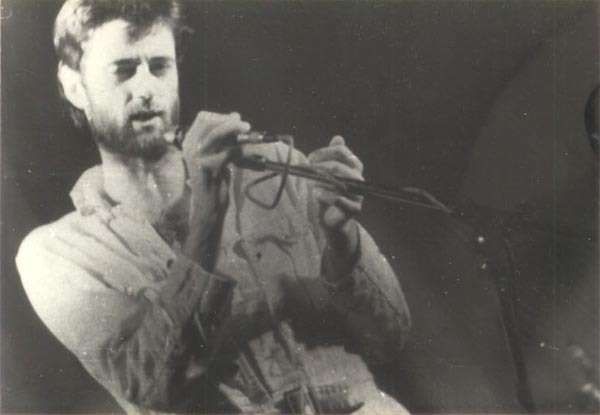 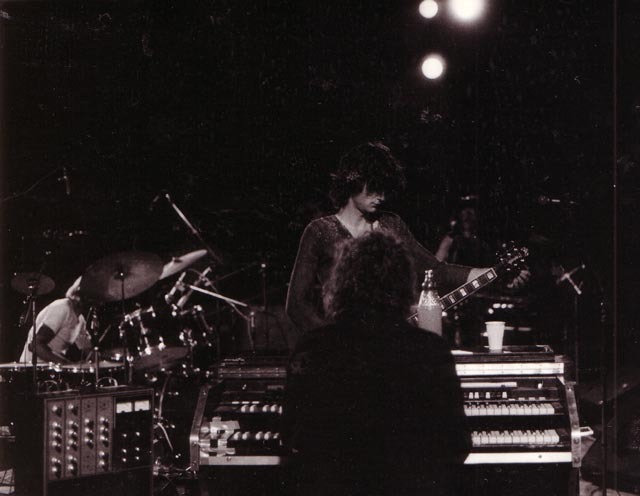 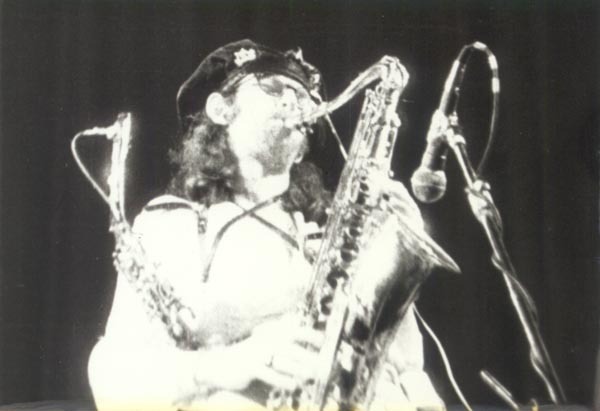 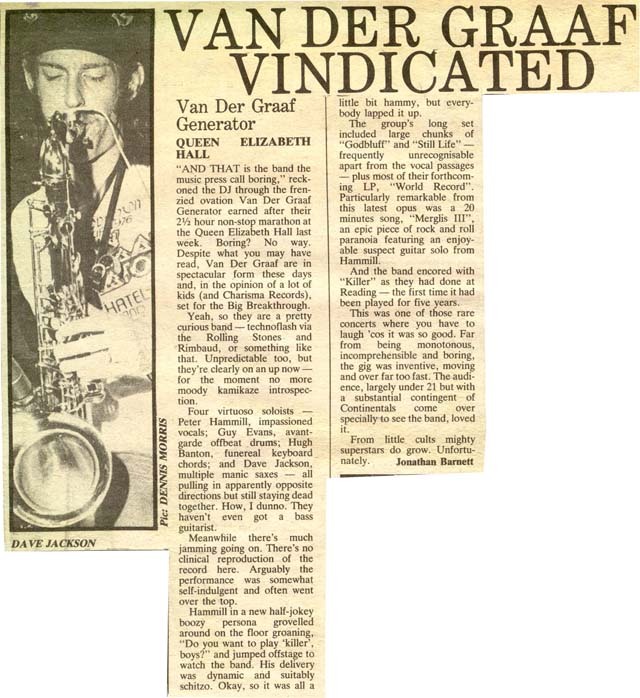 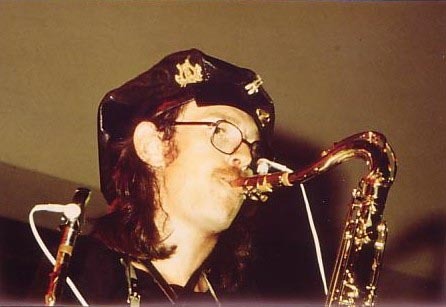 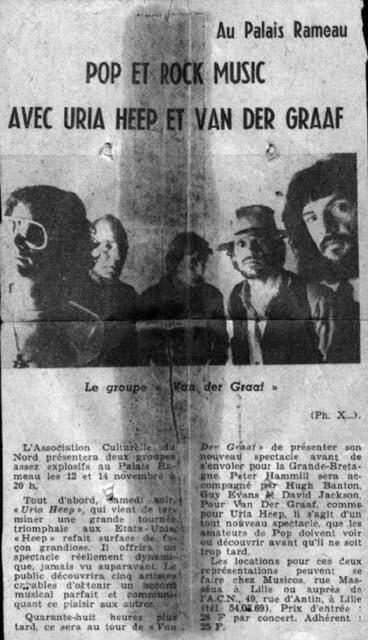 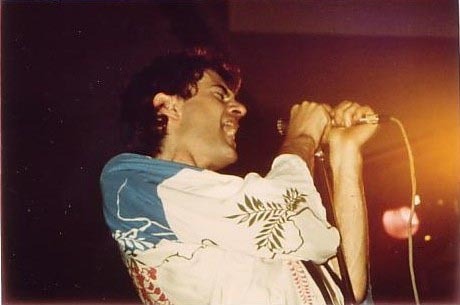 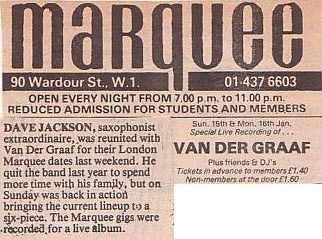 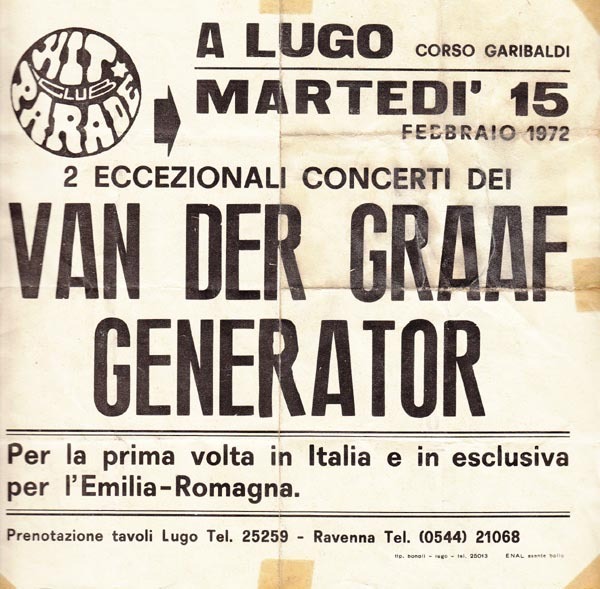 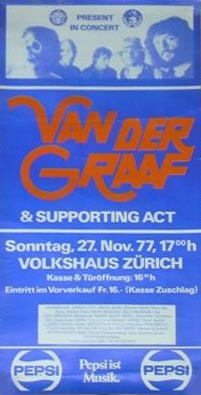 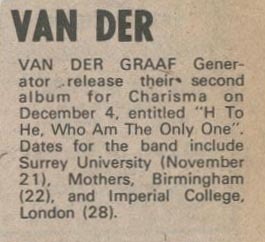 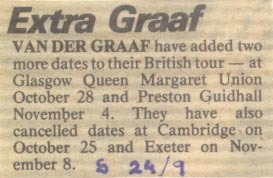 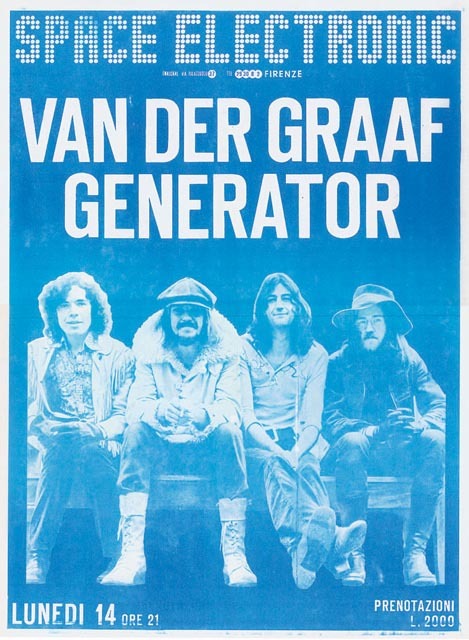 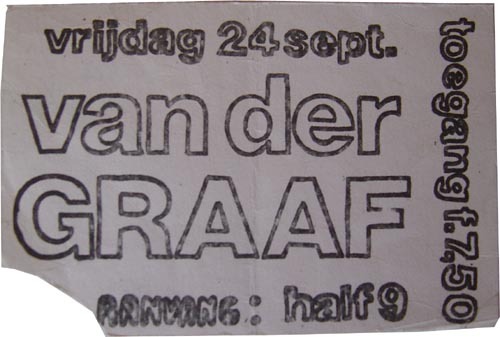 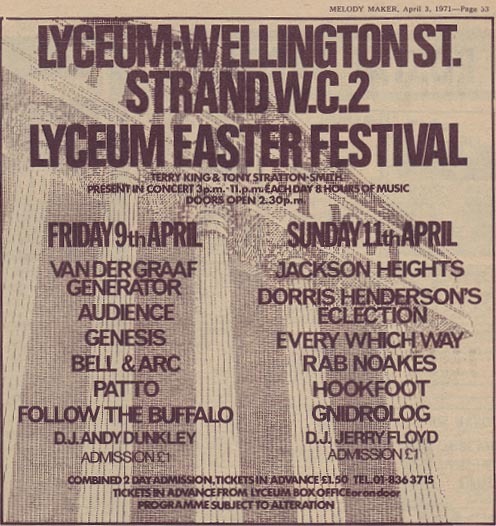 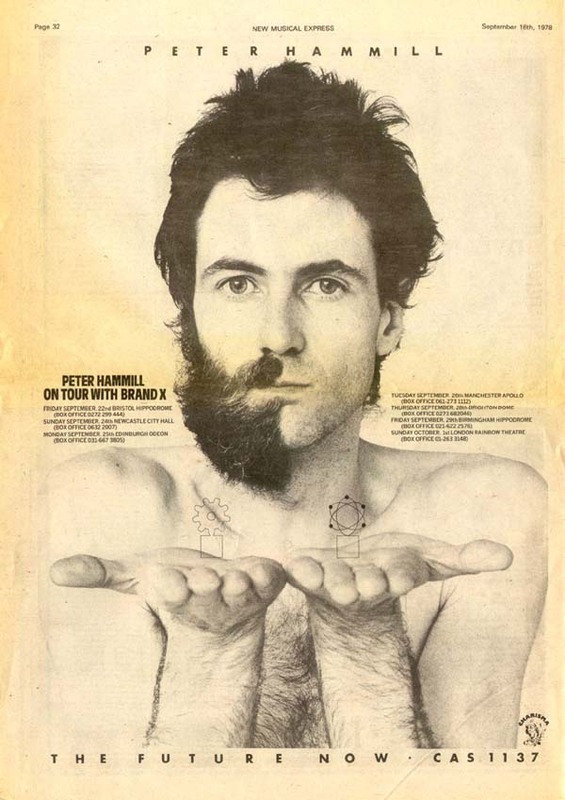 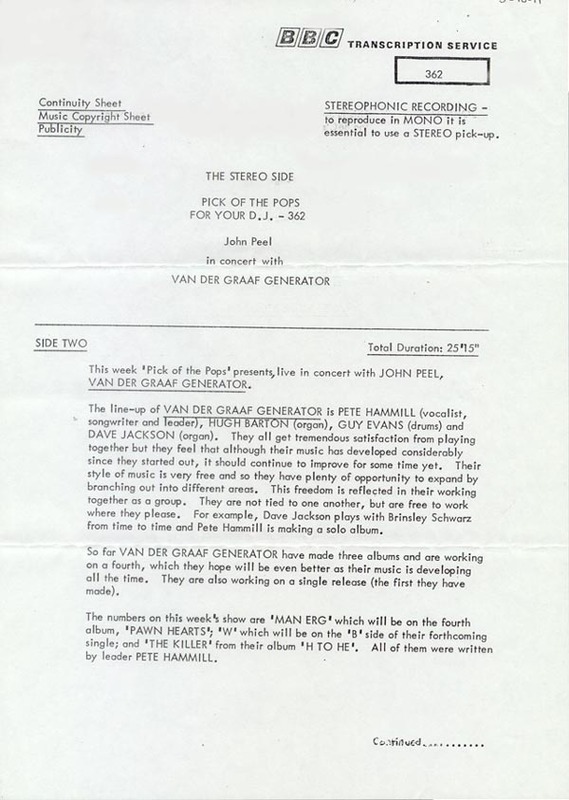 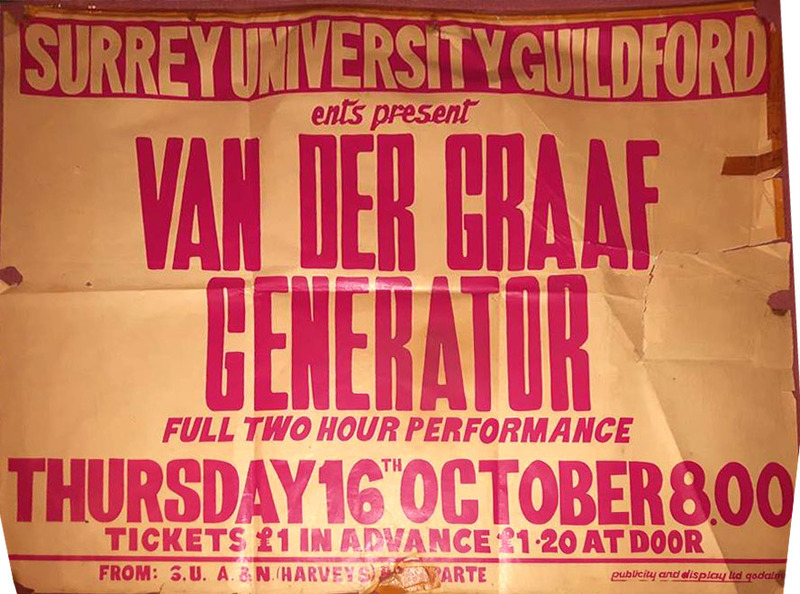 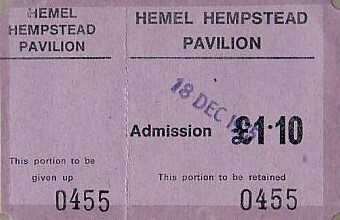 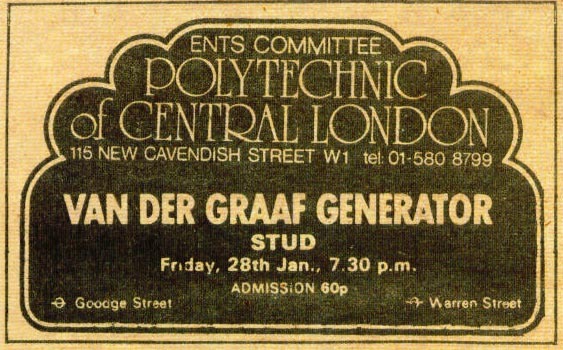 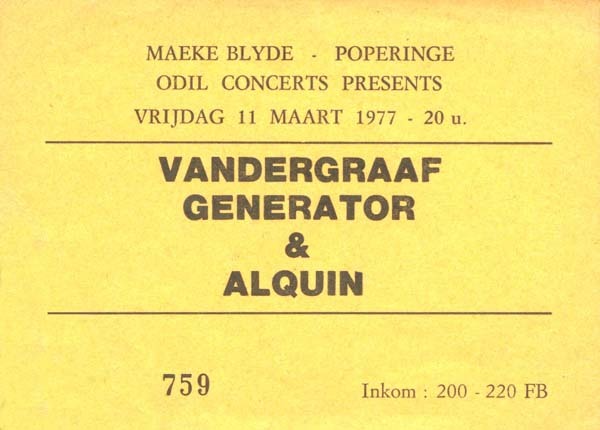 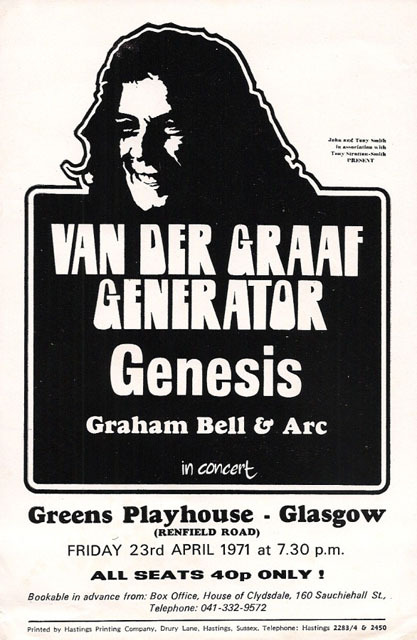 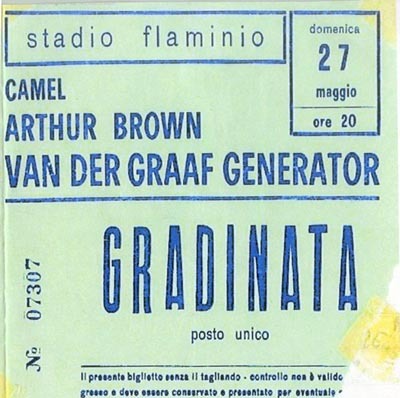 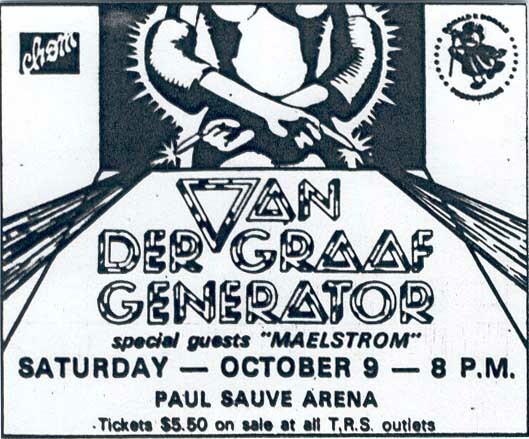 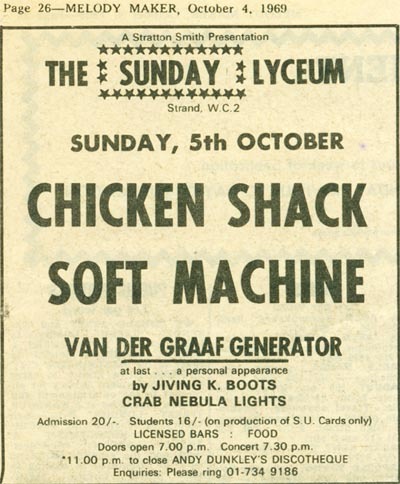 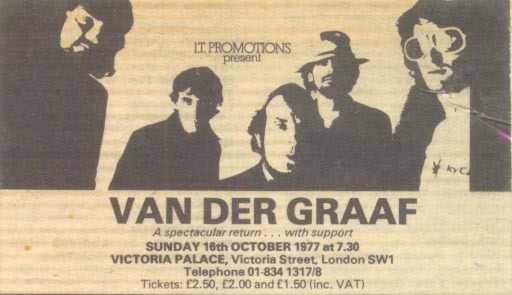 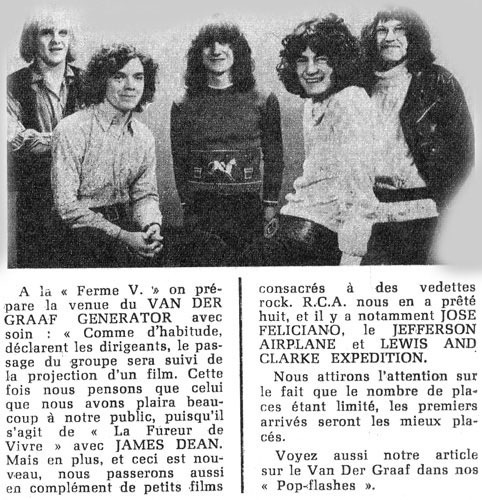 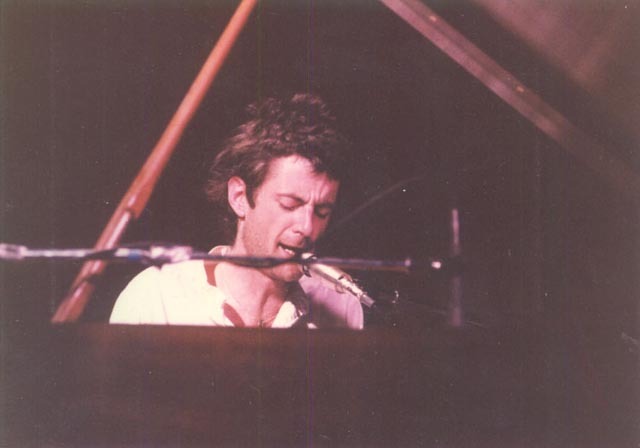 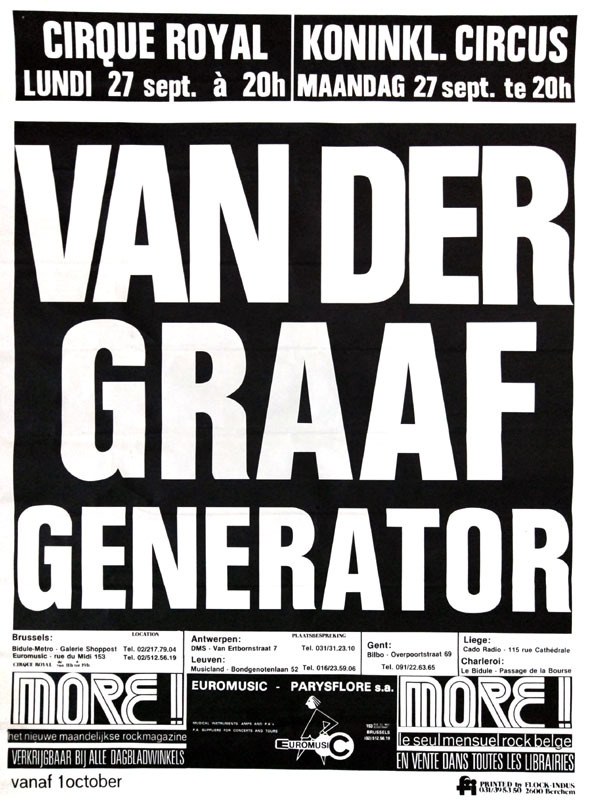 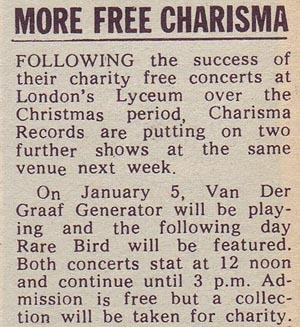 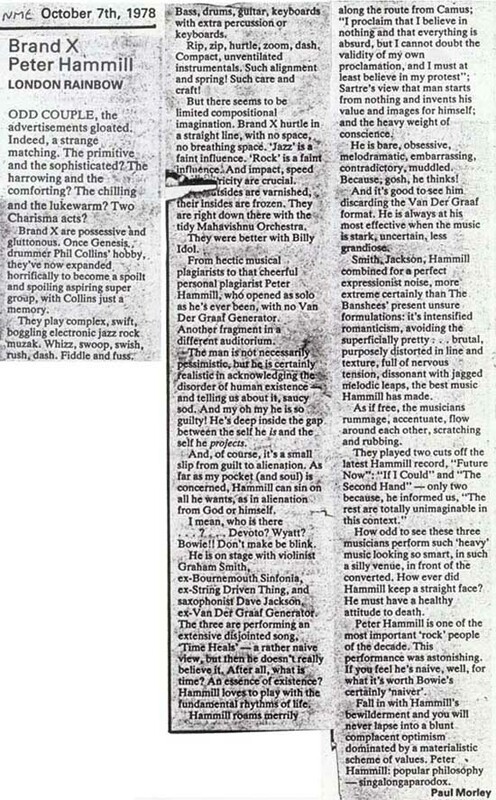 29 NOV 04 Van der Graaf Generator Reunion announced.